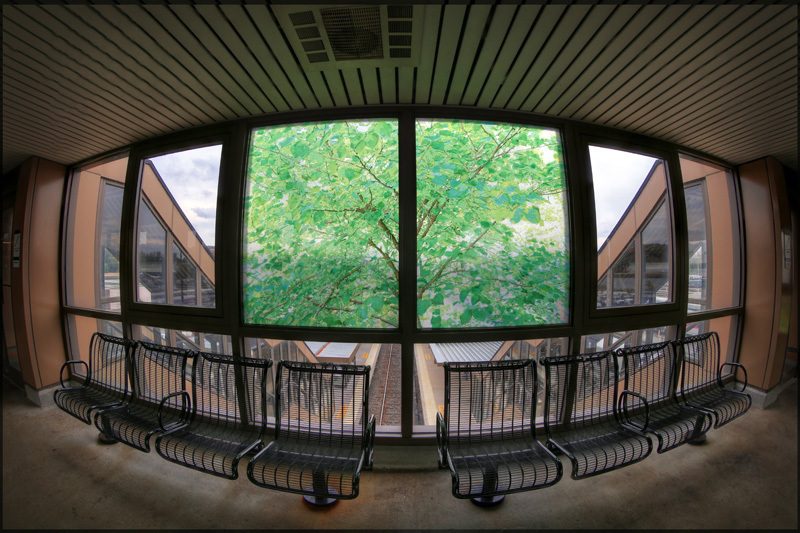 I think it is fairly well established that I love the Arts for Transit program, and pretty much any transit-related art in general. 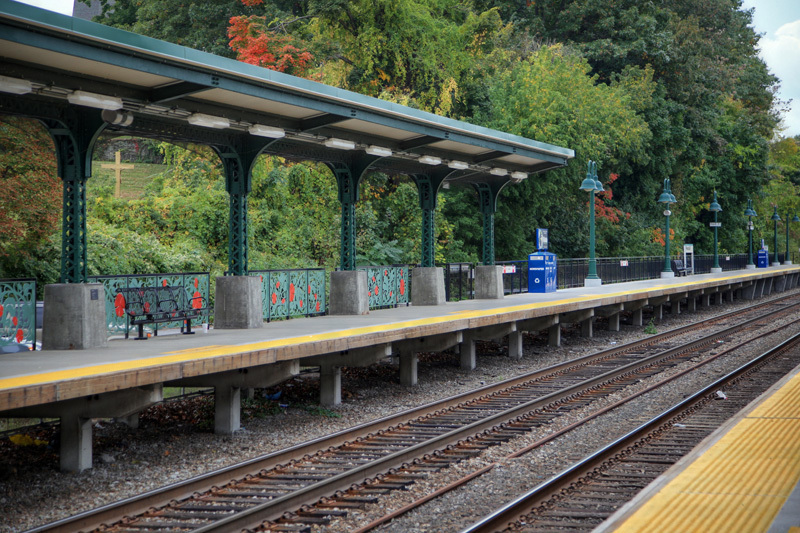 My three-year-long jaunt to every single Metro-North station was not only a great way to become familiar with our rail system, but to also become familiar with the art found within many of the stations. 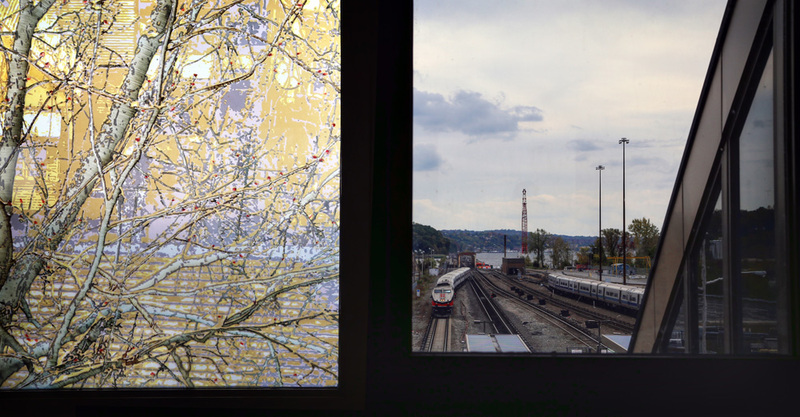 The Hudson Line has some of the newest and most attractive pieces out of the Arts for Transit program, including two stations that never made it into my Tuesday Tours. 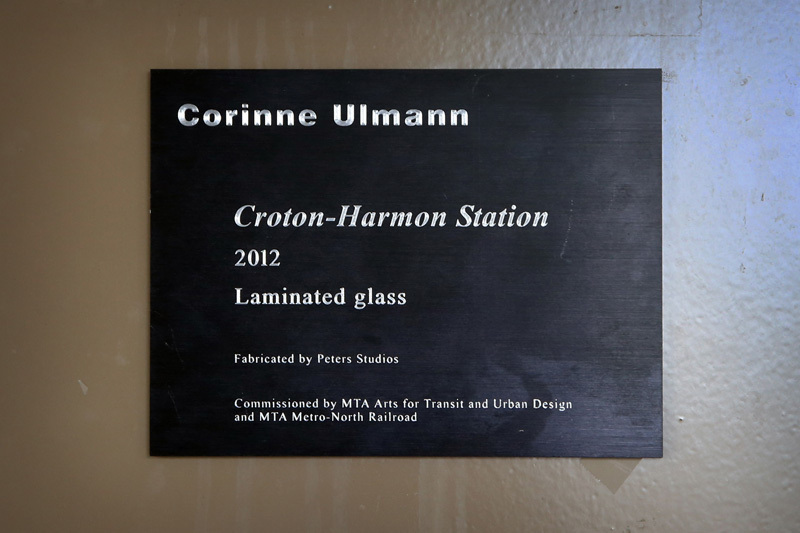 Both Croton-Harmon and Peekskill got some art in the latter half of 2012, after both stations had been featured on the site. Both are rather attractive designs, and I figured it would be worth visiting the Hudson yet again to check them out. 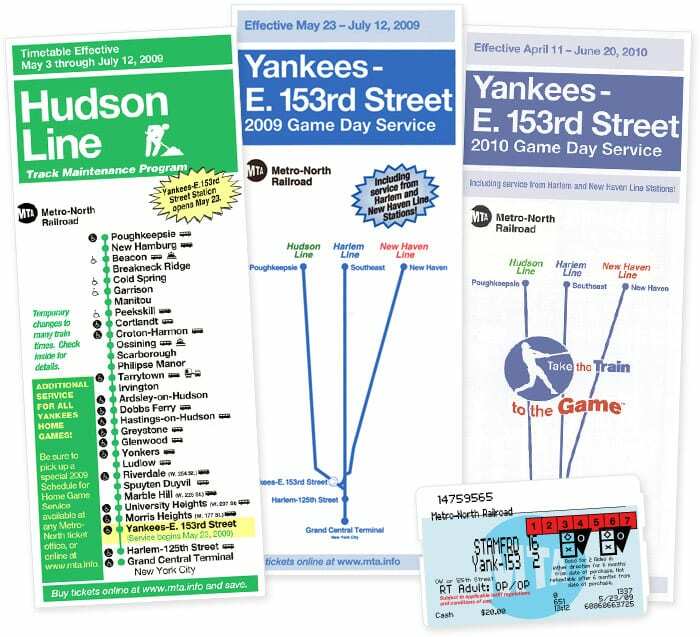 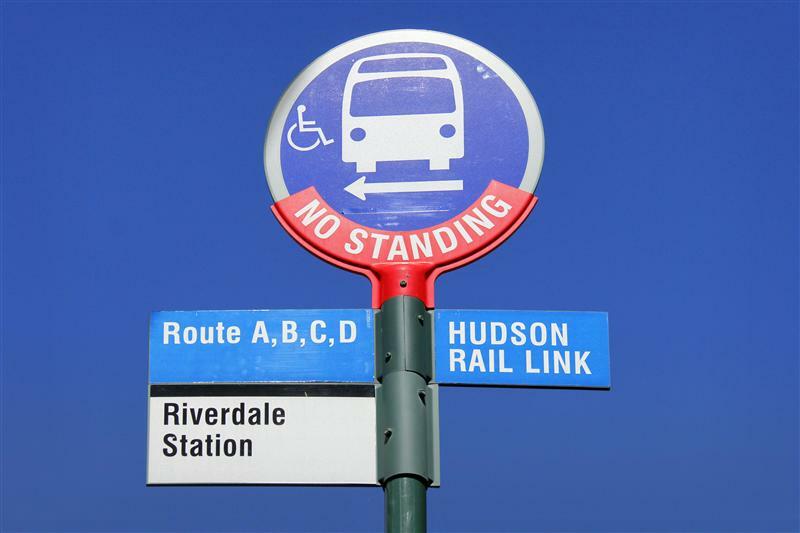 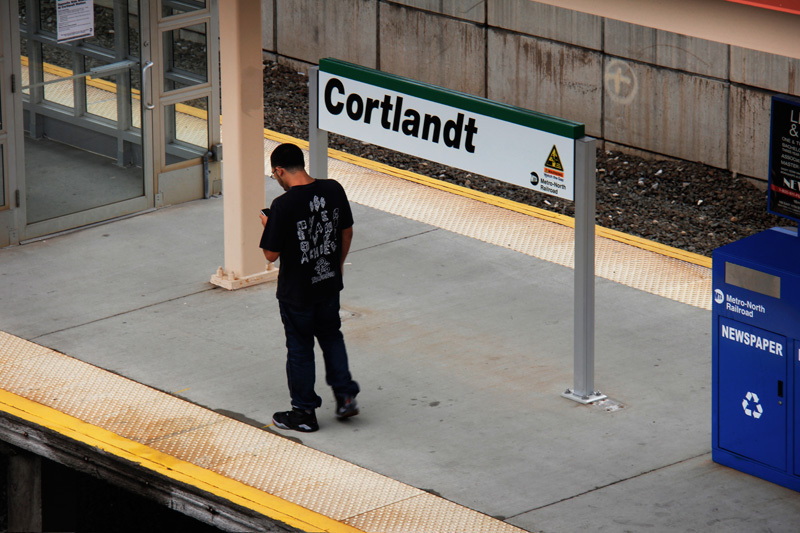 Some of Arts for Transit’s most successful installations are those that almost transcend the barrier between art and function, and those that interact with the space in which they are placed. 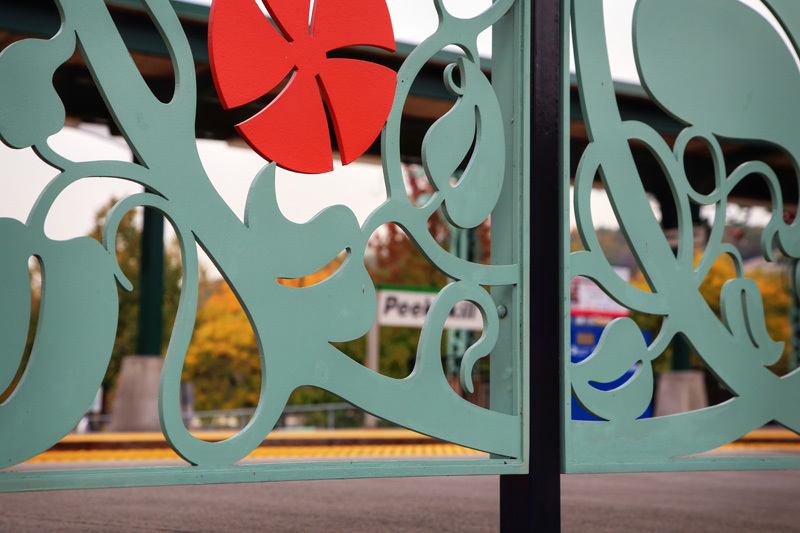 While bronze sculptures hanging on the wall are certainly a lovely (though easily missed) addition to any station, the bronze chairs you’ll find at Pleasantville station become even more than that. 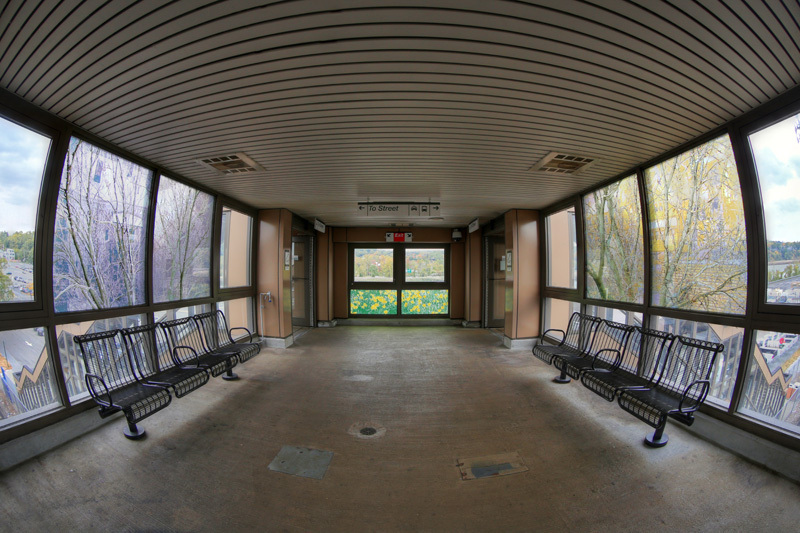 They are attractive, but also functional, they interact with the people that use the station, and they begin a dialogue. 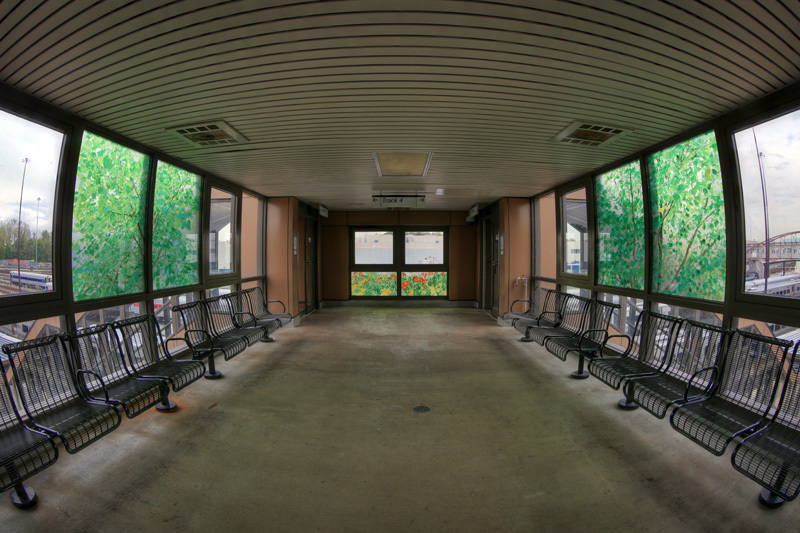 People that spy them from the train might say, “what are those nice looking chairs, and why are they there?” And as the artists intended, they evoke the comforts and feelings of home, and the thought that to many regular commuters this station is their second home. 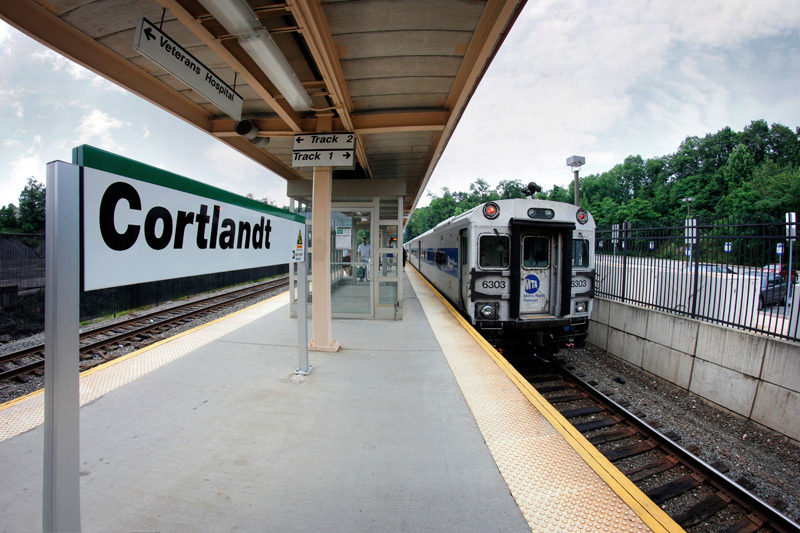 When comparing Arts for Transit pieces, Pleasantville always seems to be the bar to which I compare, and is (at least in my opinion) one of the best embodiments of the program’s concept of enhancing the experience of travel. 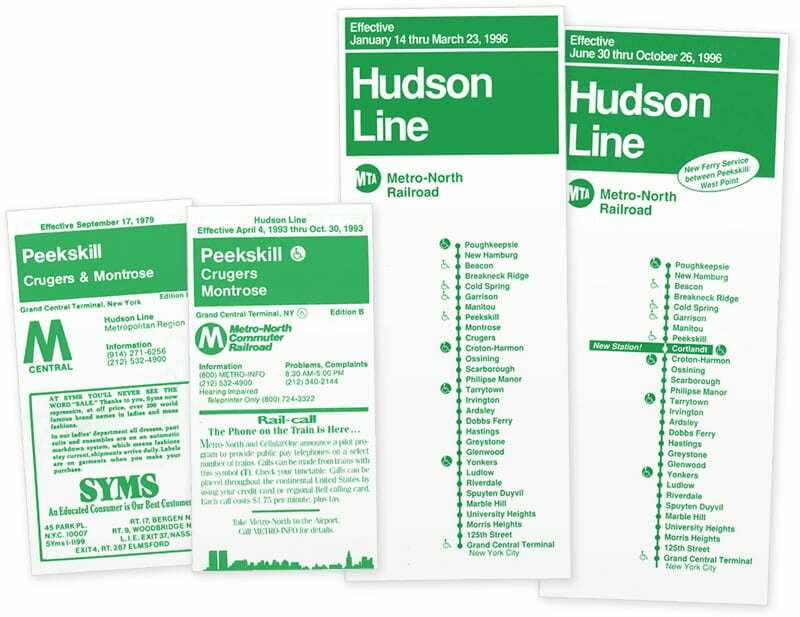 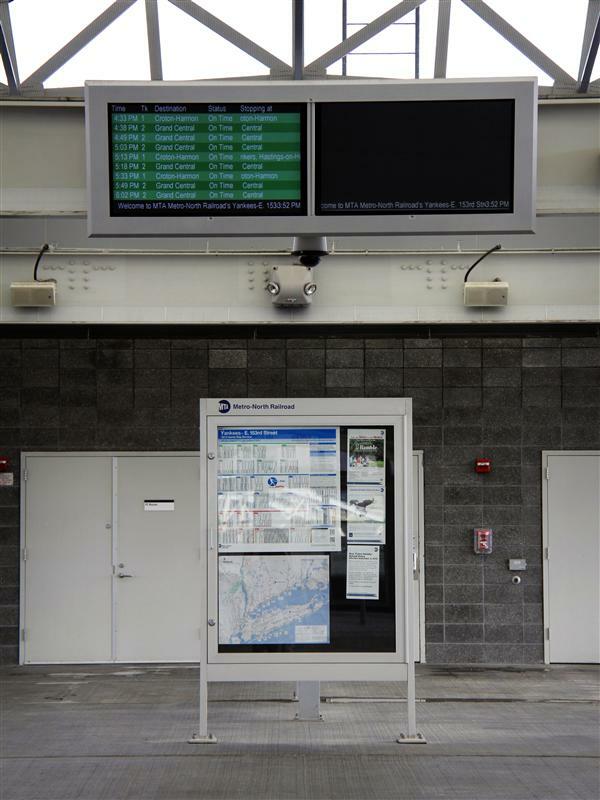 In a similar vein to the Pleasantville piece, both of the newest Arts for Transit works on the Hudson Line seem to interact with the stations in which they’ve been placed, and thus the people that frequent them. 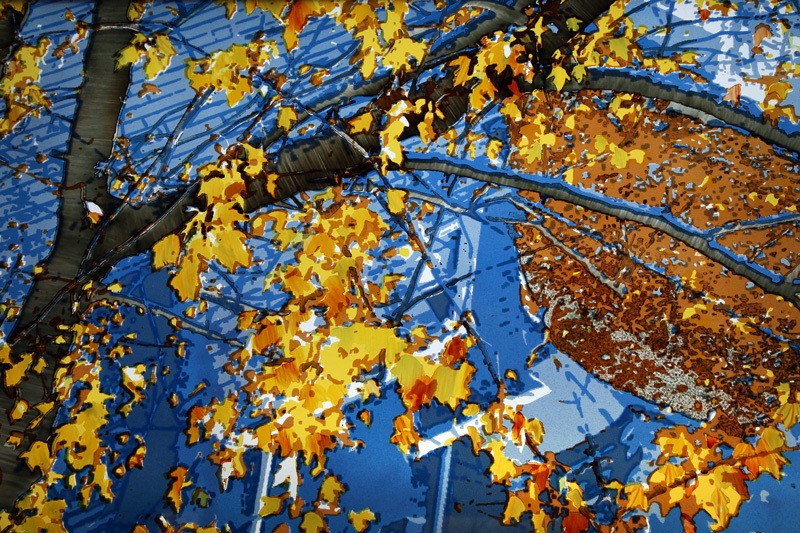 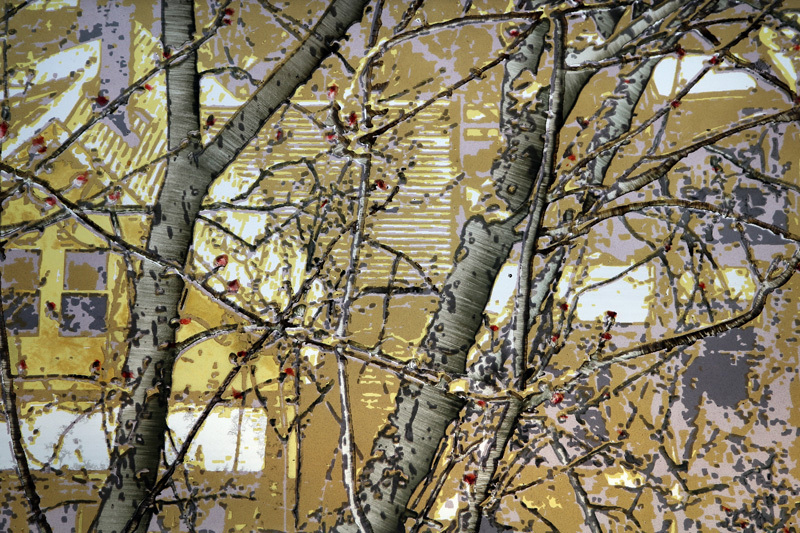 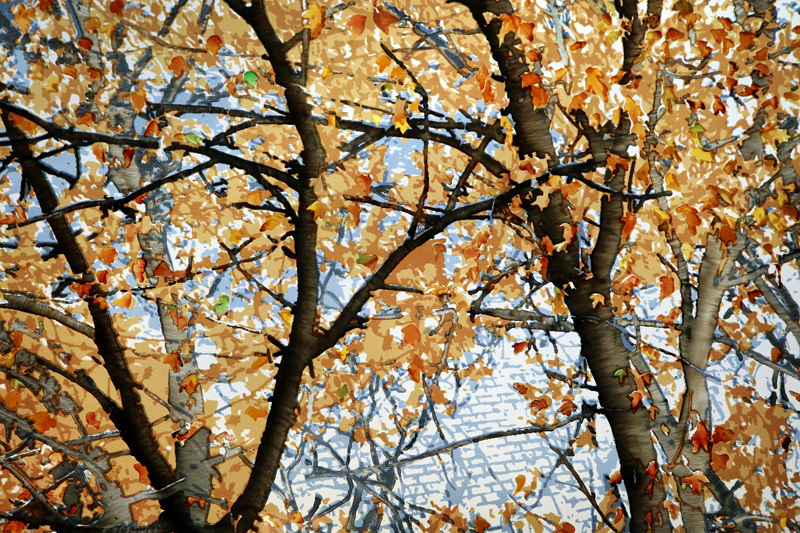 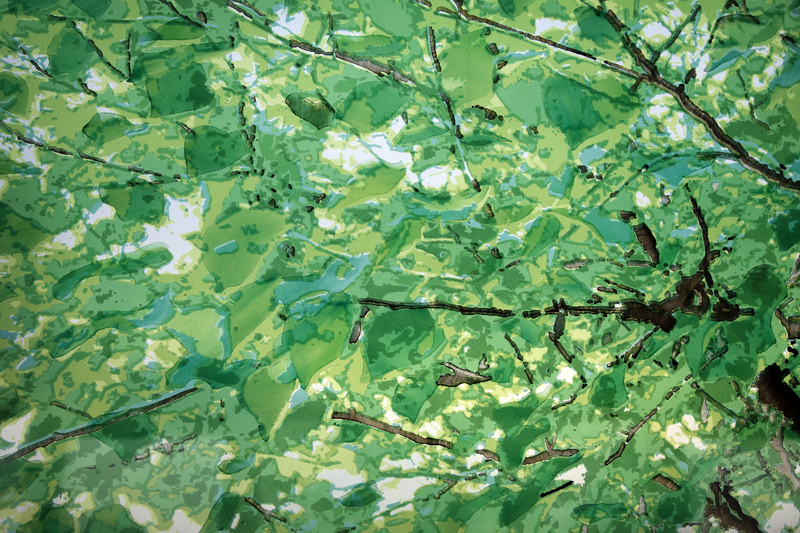 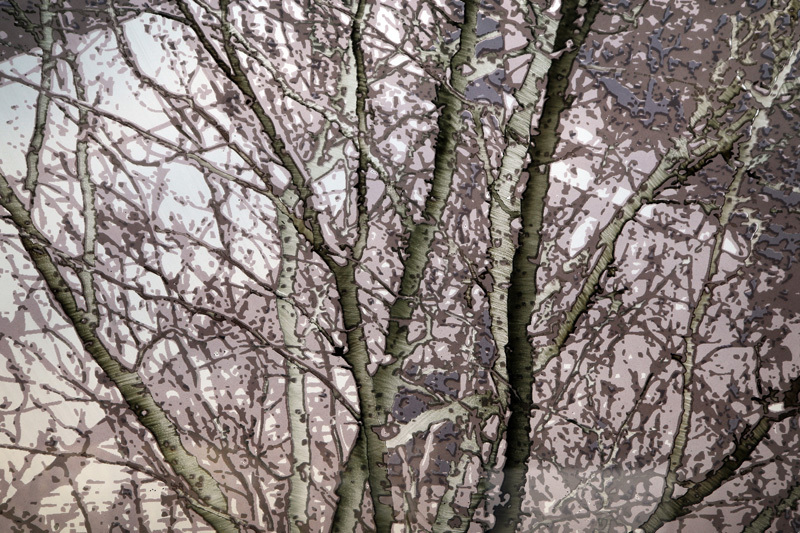 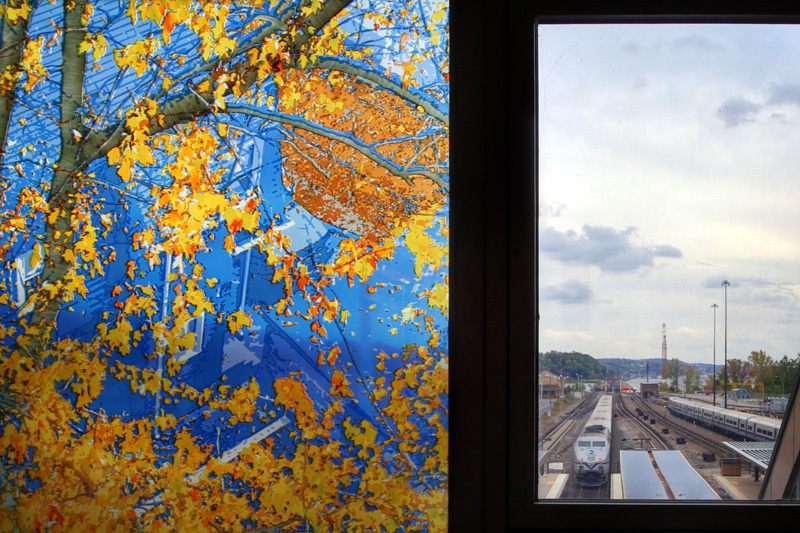 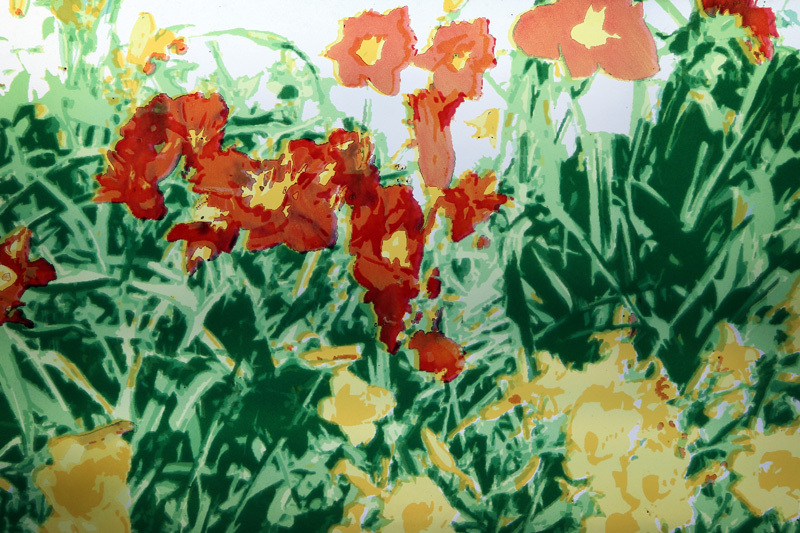 Croton-Harmon’s artwork, a series of laminated glass panels by Brooklyn-based artist Corinne Ulmann, not only depict the changing of seasons, but seem to change on their own based upon the light that filters into the overpass. 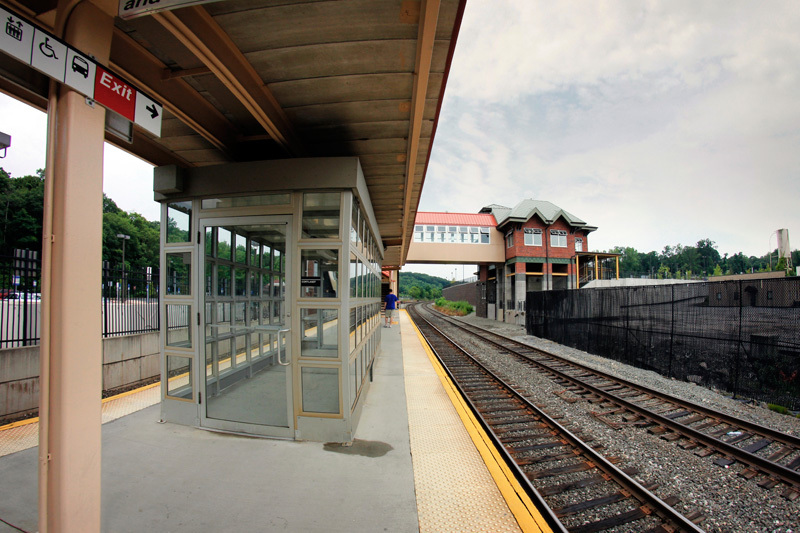 Several Hudson Line stations feature both faceted and laminated glass works in the overpasses, and I’ve always felt they’ve been successful as they’re never the same at all times. 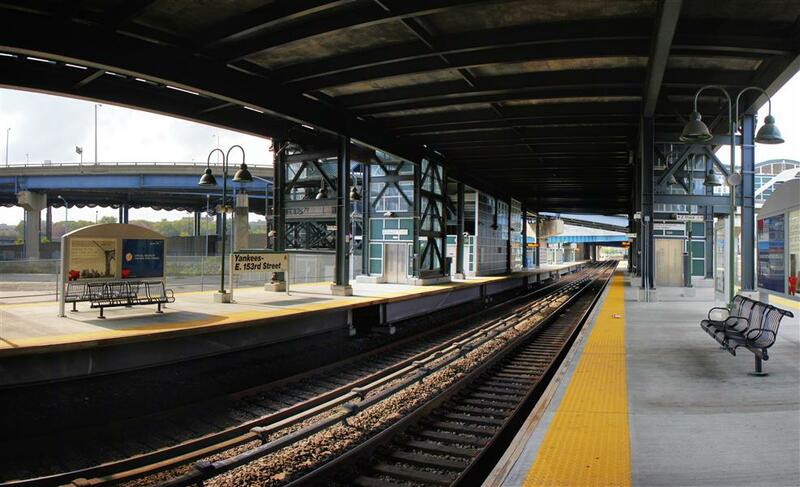 As sunlight passes through, colors are reflected onto the platforms and walkways and move as the sun crosses the sky. 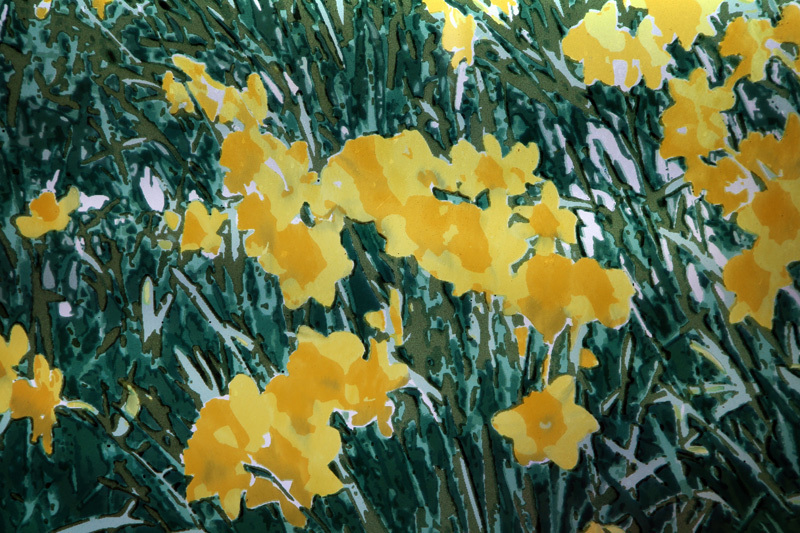 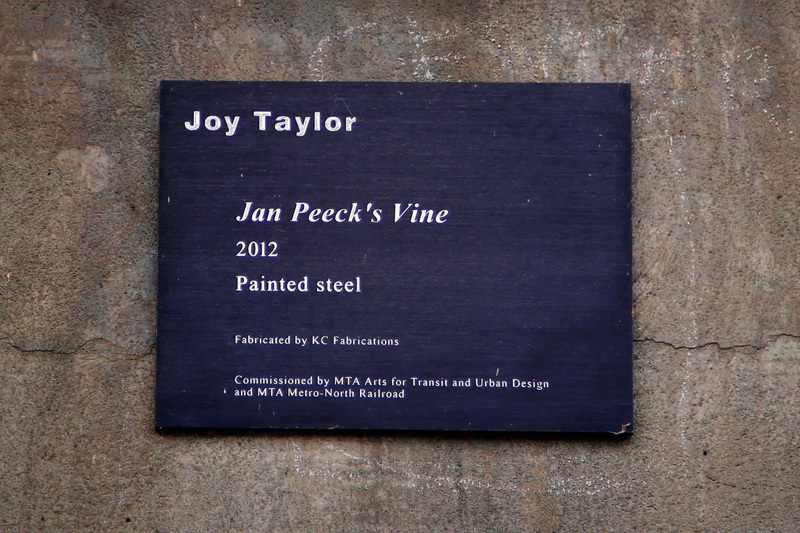 Thus the art is hardly static, it subtly changes due to season, time, and weather. 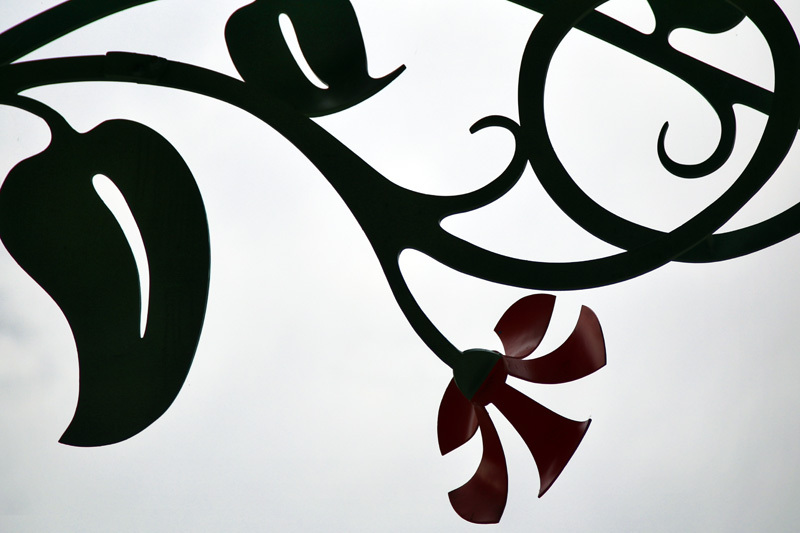 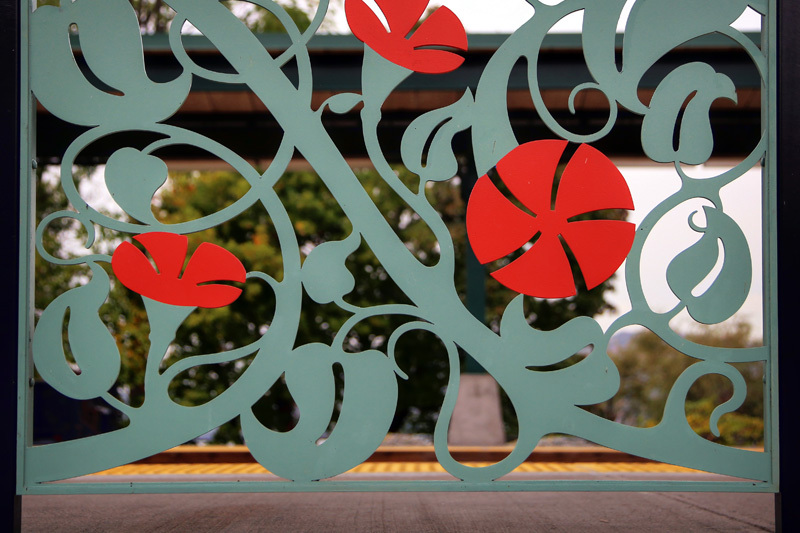 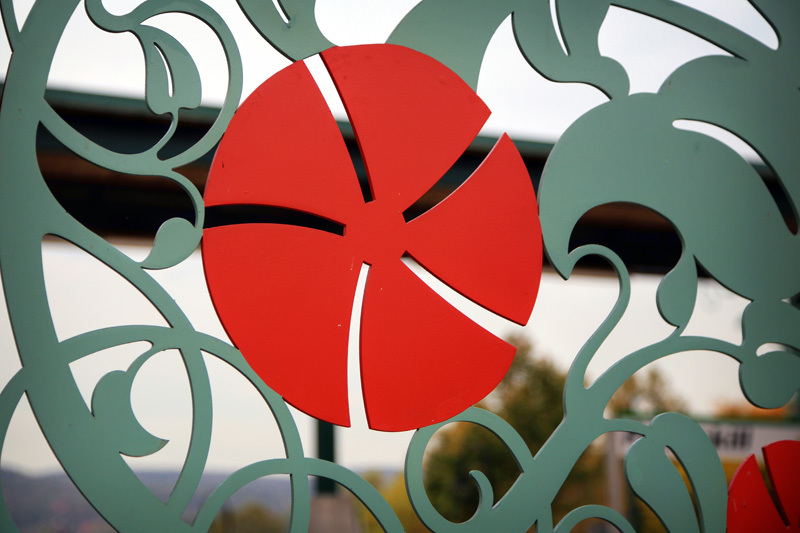 Peekskill’s art, an installation of various painted steel pieces by Joy Taylor, also interacts with the station, and the sunlight. 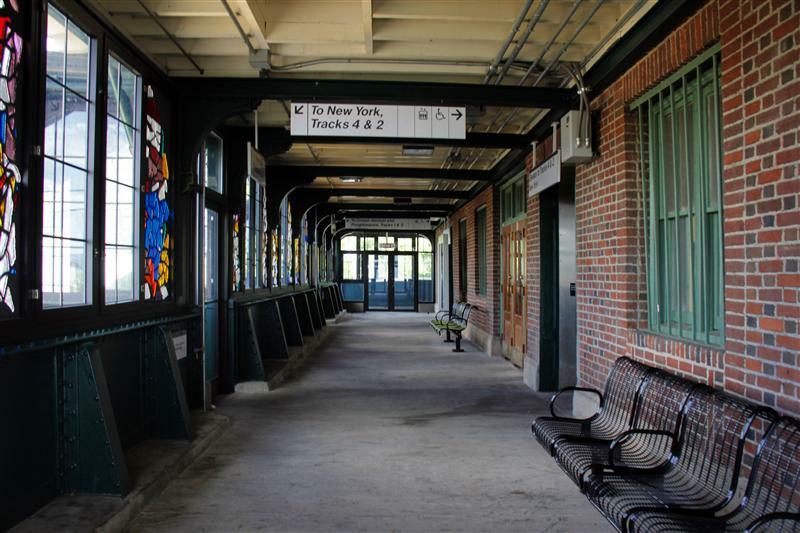 The large pieces cast shadows on the platform, but also highlight a play between new and old at the station. 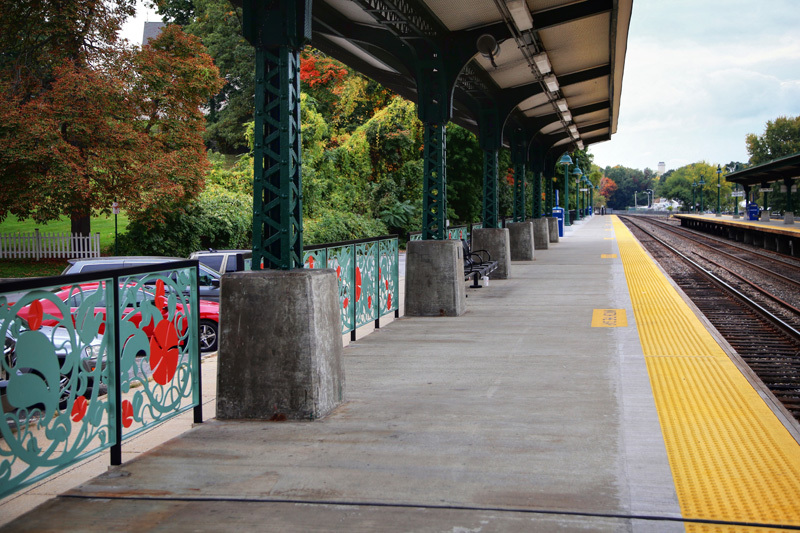 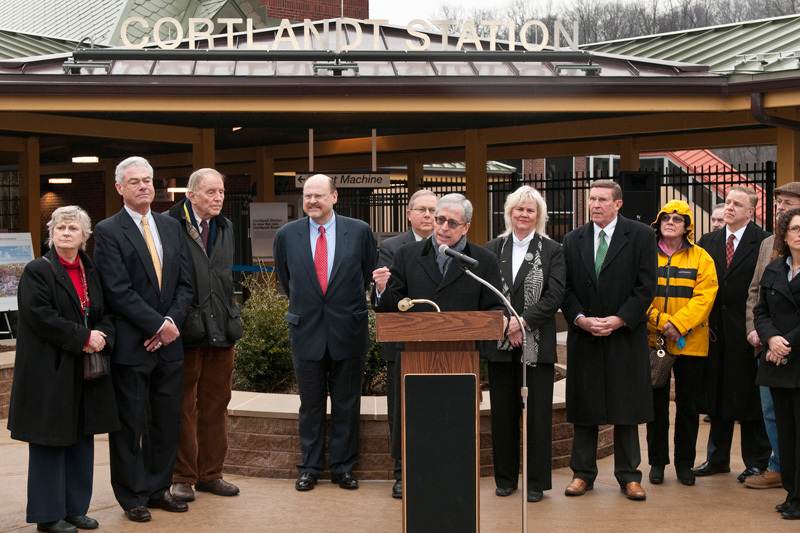 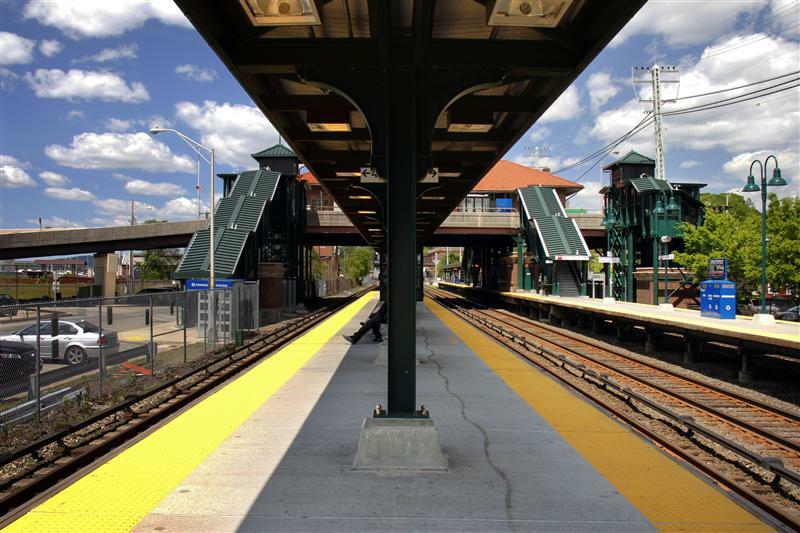 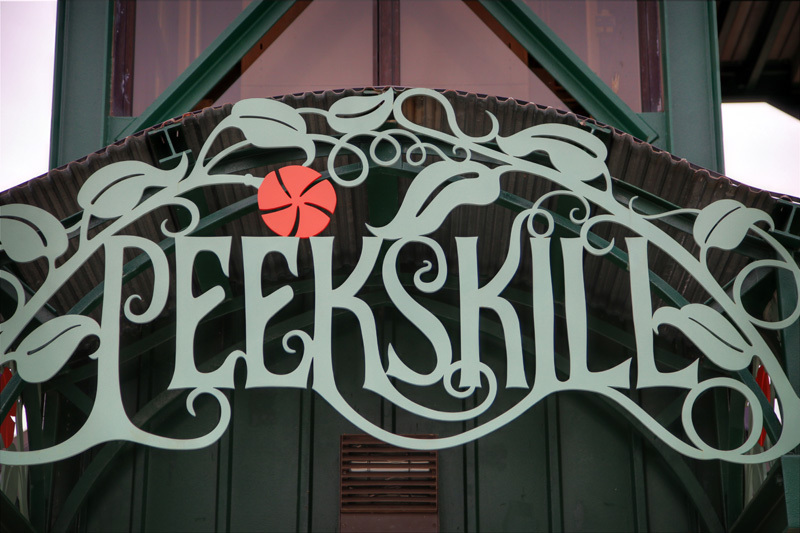 During Peekskill’s recent renovations, the station’s historical canopy was restored. 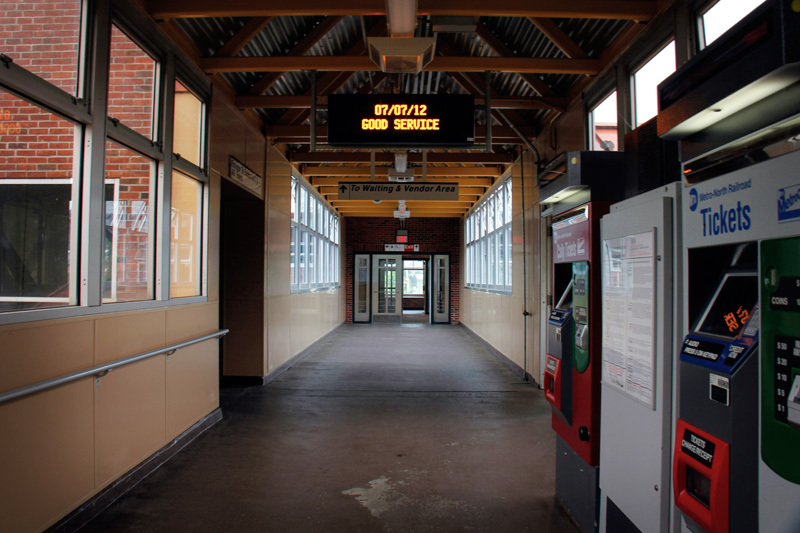 This canopy runs parallel to the more modern one found on the station’s other platform, but both evoke a different feeling. 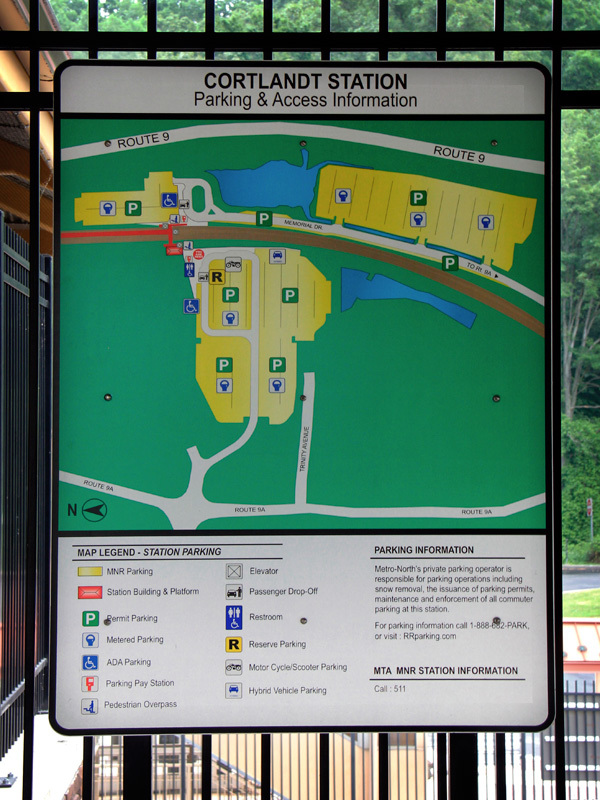 The historical canopy is rounded, where the new is more angular, with squared edges. 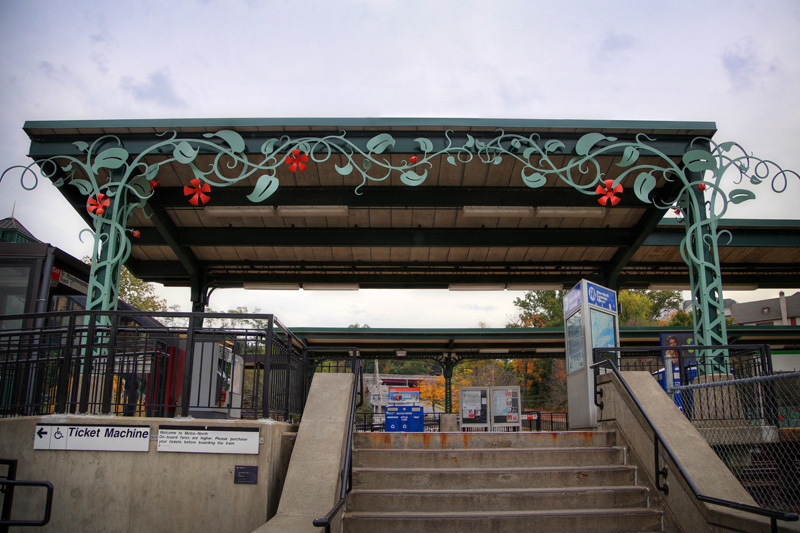 But with the artistic flourishes added to the modern canopy (the historical canopy was appropriately left without embellishments), the new canopy visually parallels the old. 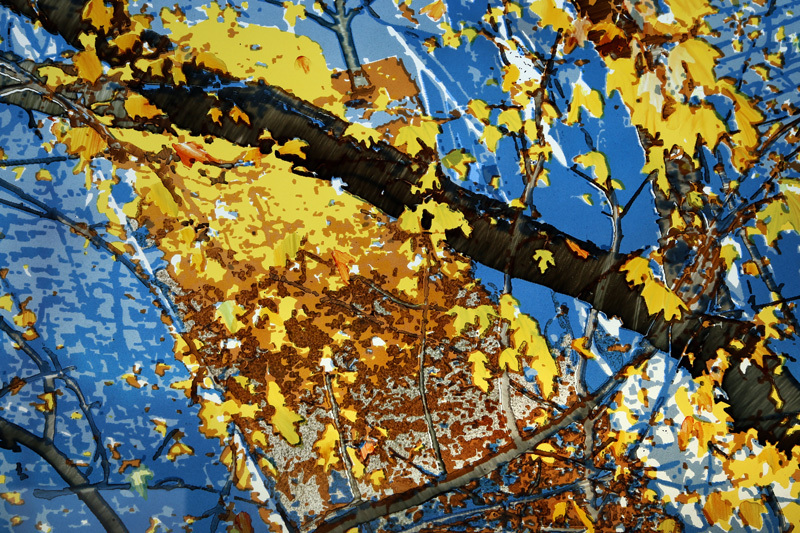 Not only does it create an interesting play between new and old, but it emphasizes the historical nature of the one canopy. 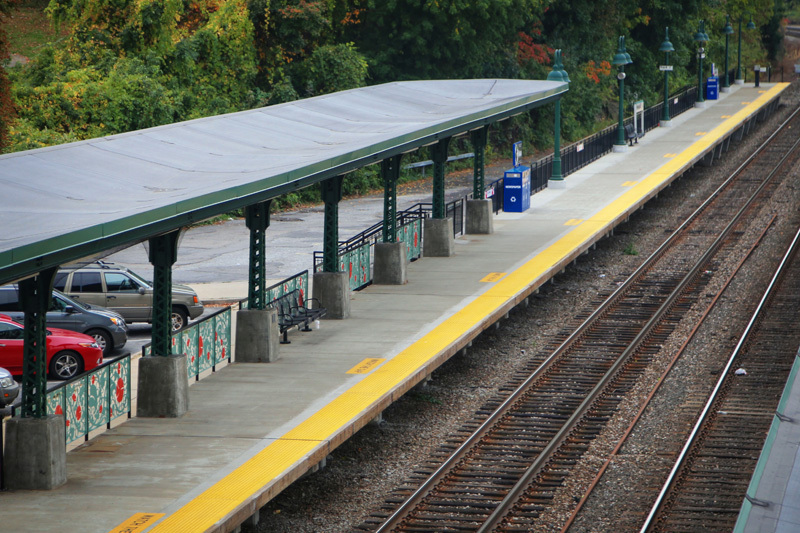 That side of the platform is not bare, however. 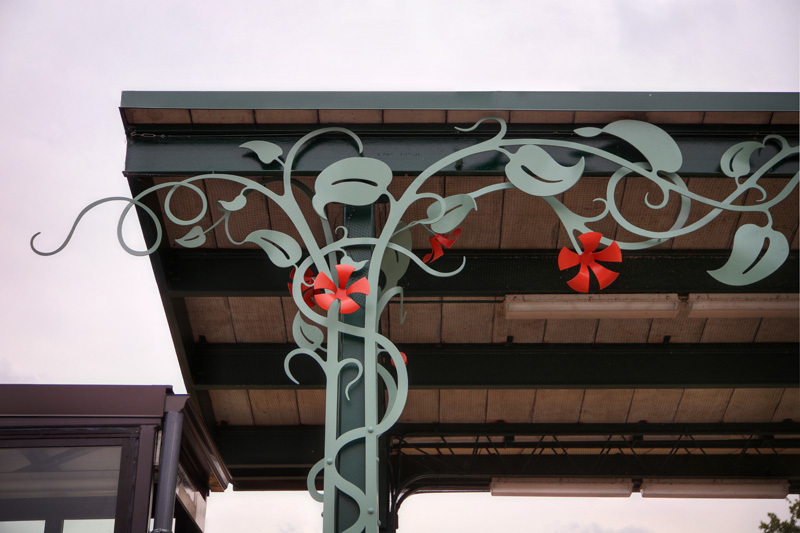 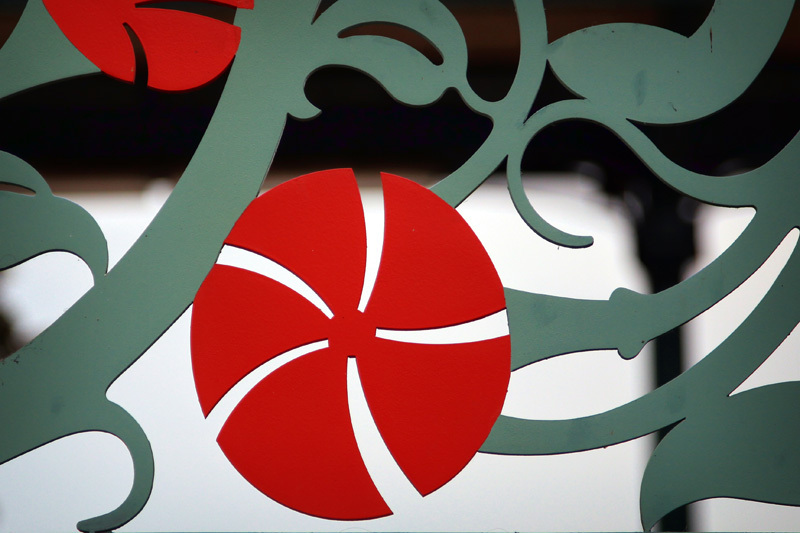 The fencing behind the old canopy carries the same flowery motif, but without compromising the part that is historical. 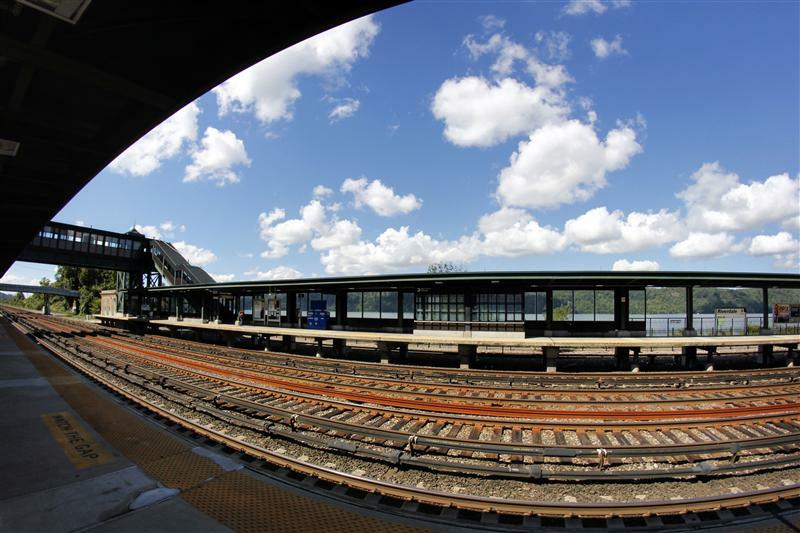 If you happen to get over to the Hudson Line, both pieces are certainly worth checking out, and make commuting on the Hudson Line a little bit more attractive than before. 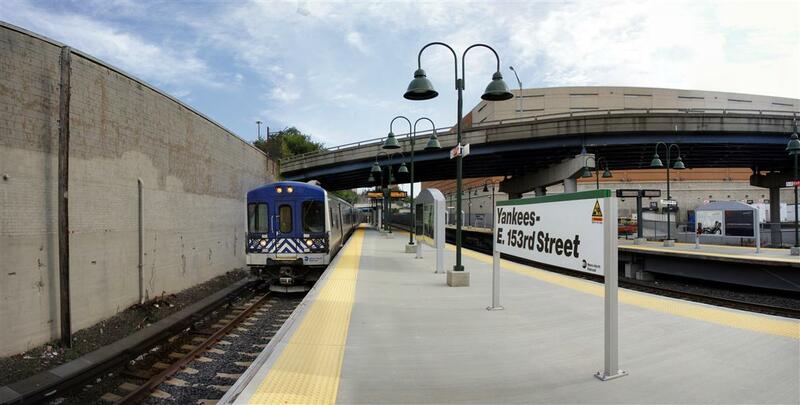 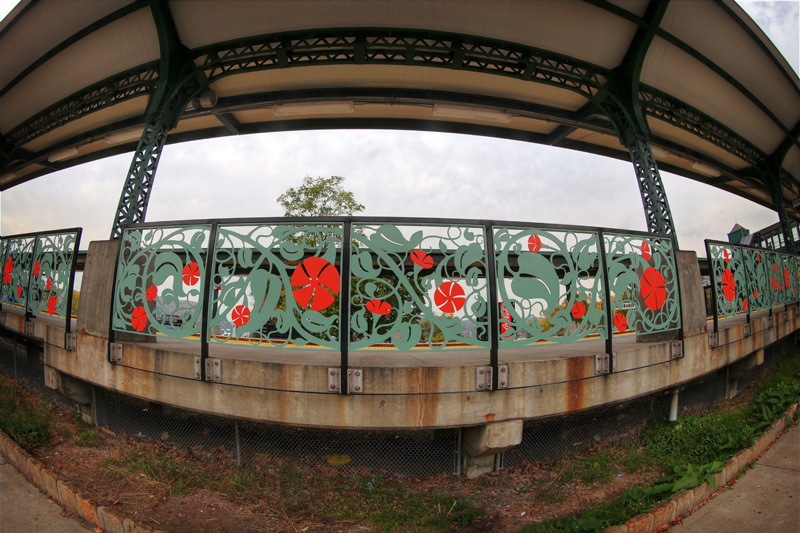 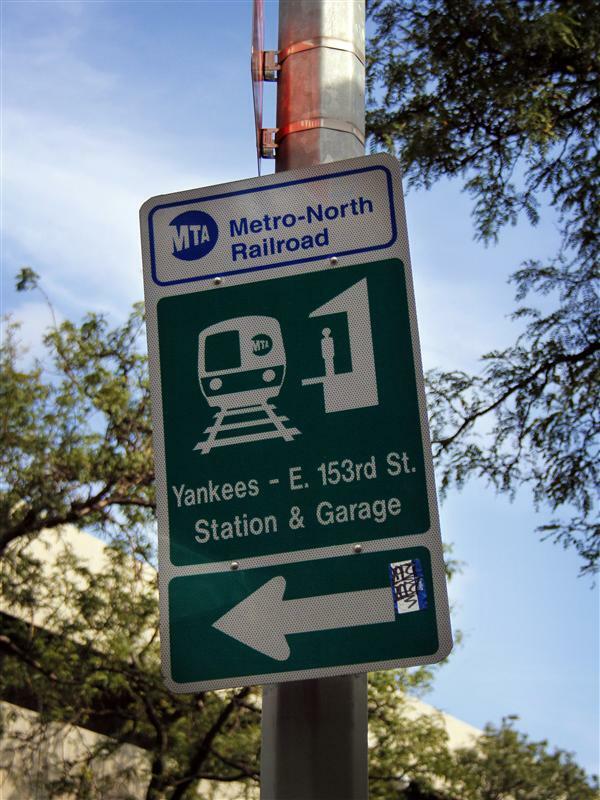 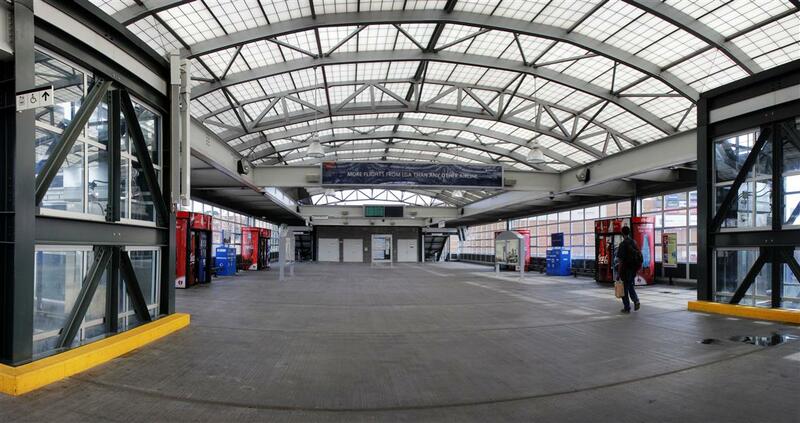 And before I forget, Metro-North’s newest Arts for Transit will be at Fordham station on the Harlem Line. 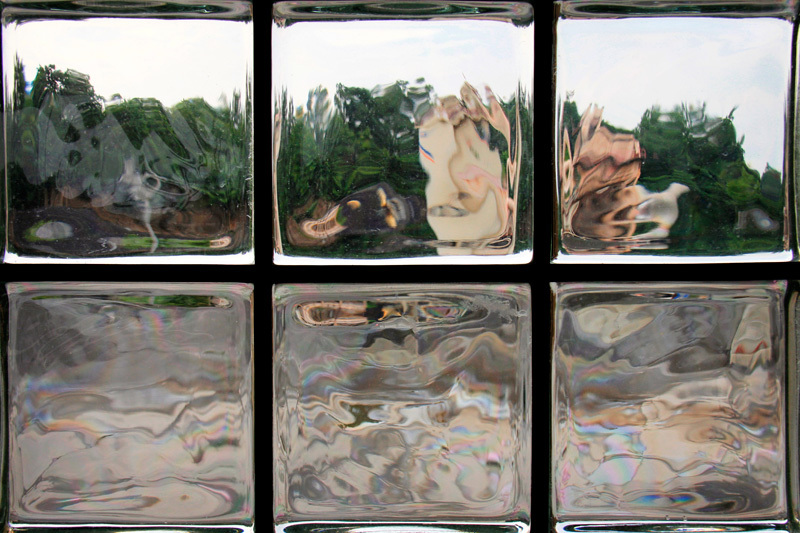 If you happen to be an artist, you still have a few days to reply to the Call for Artists. 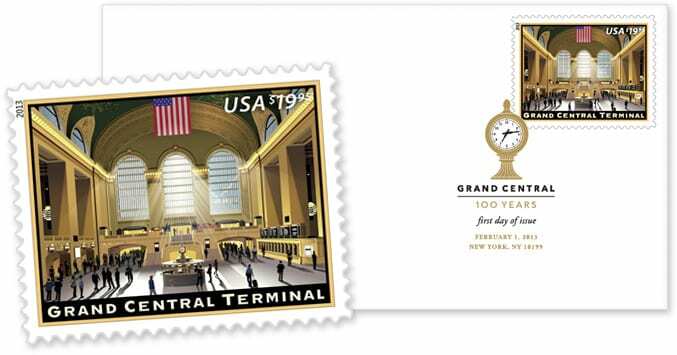 Submissions need to be postmarked by the 28th. 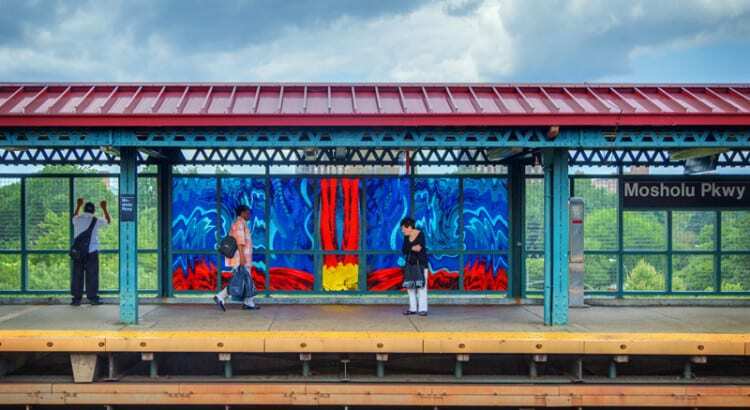 As a Metro-North rider, and an appreciator of art, I must say that I have a strong affinity for the Arts for Transit program. 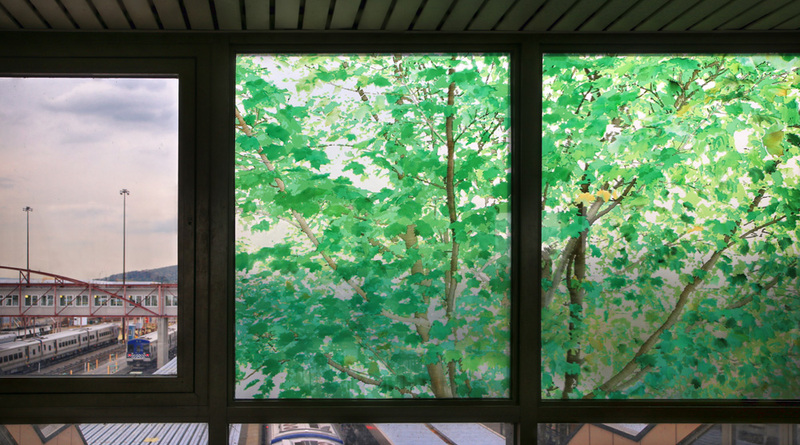 In fact, I found the many permanent artworks to be some of the most enjoyable things discovered while on my journeys to all 123 Metro-North stations. 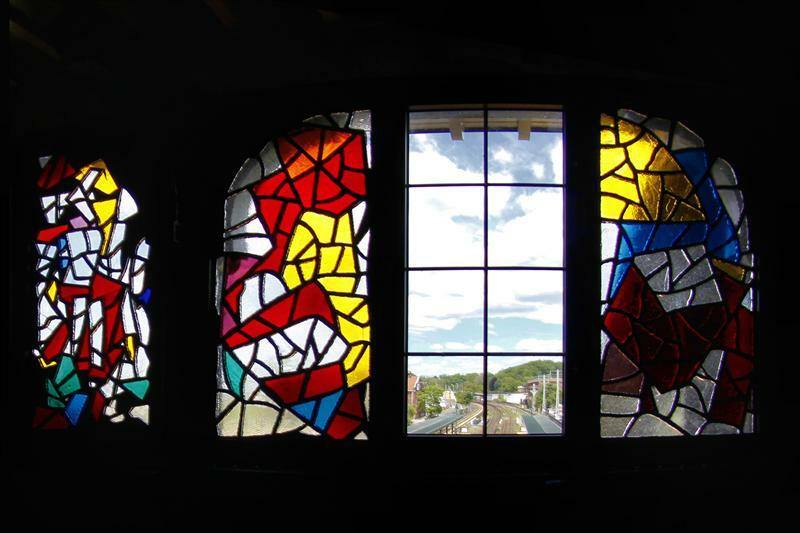 From the bronze chairs in Pleasantville, to the stained glass in Tarrytown, there is delightful art abound. 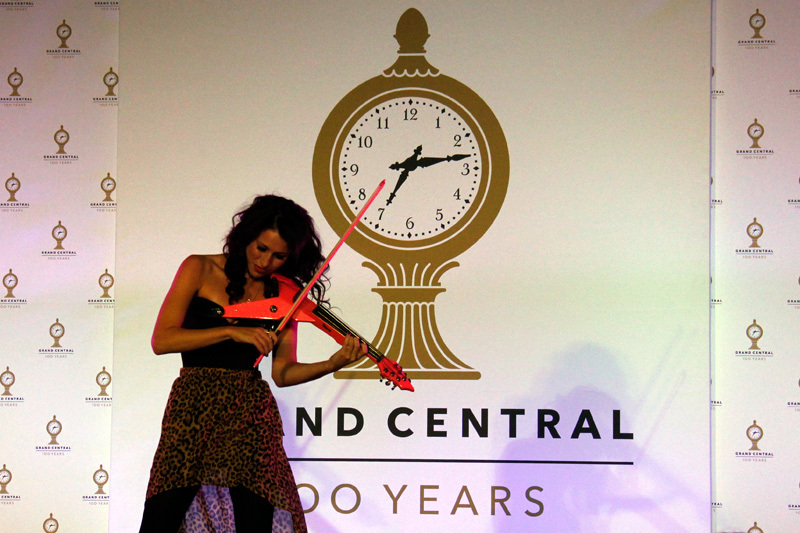 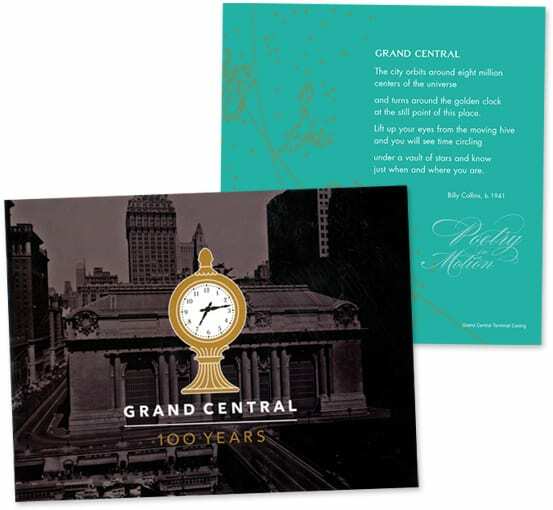 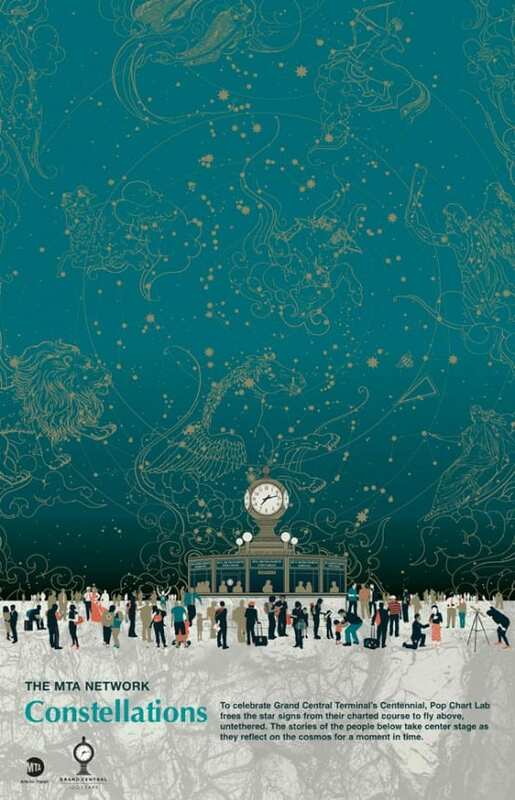 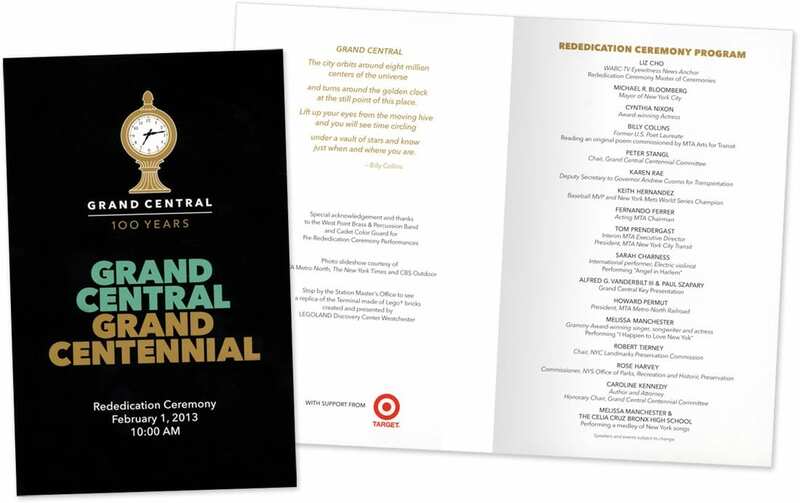 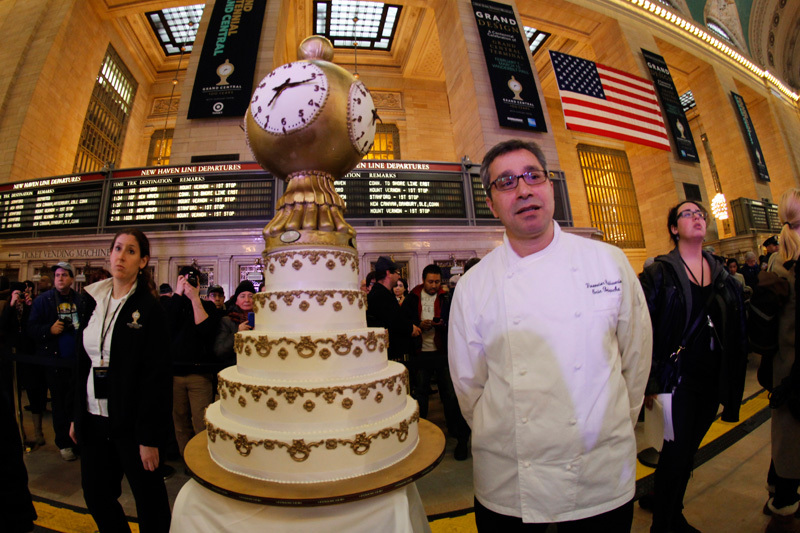 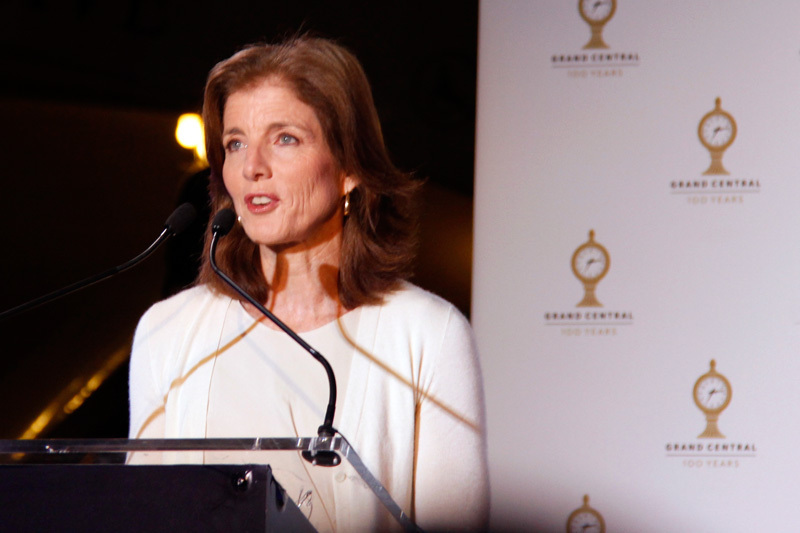 But some of the most lovely work to come from the Arts for Transit program recently are not the permanent installations in our stations, but the designs inspired by Grand Central Terminal, a part of the year long centennial celebration called On Time / Grand Central at 100. You may have seen this poster around… Pop Chart Lab brings the sky ceiling to life! 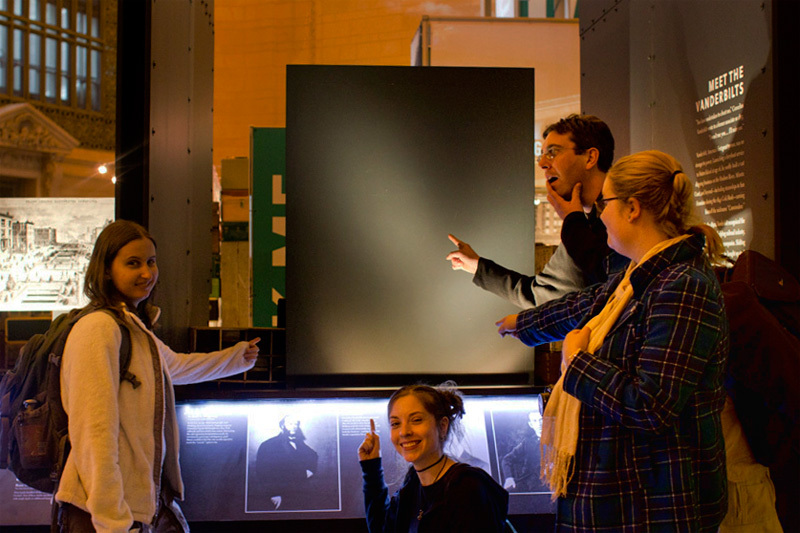 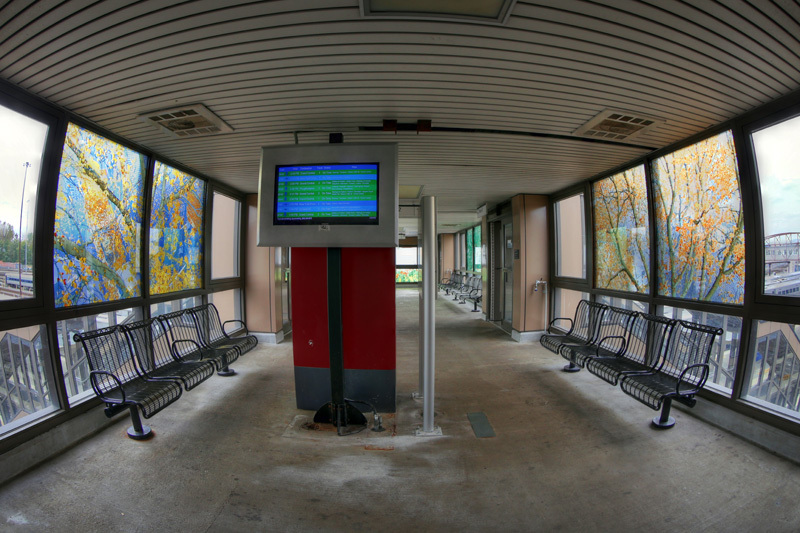 Arts for Transit, however, is not the first group to bring art into the Terminal. Long before the program was ever conceived, the Grand Central Art Galleries were established on the sixth floor of Grand Central. 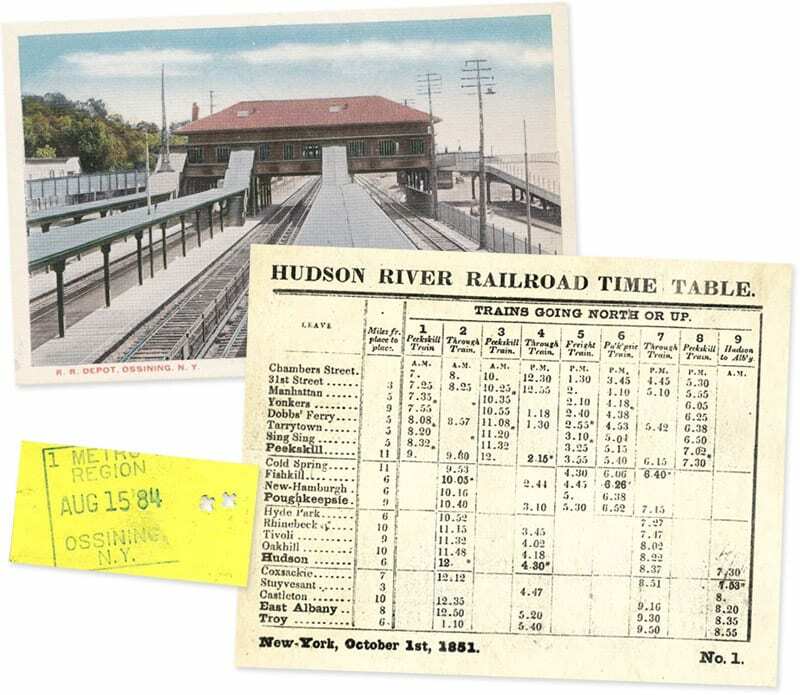 I was inspired to learn a little bit more about the galleries after purchasing an old New York Central dining car menu. 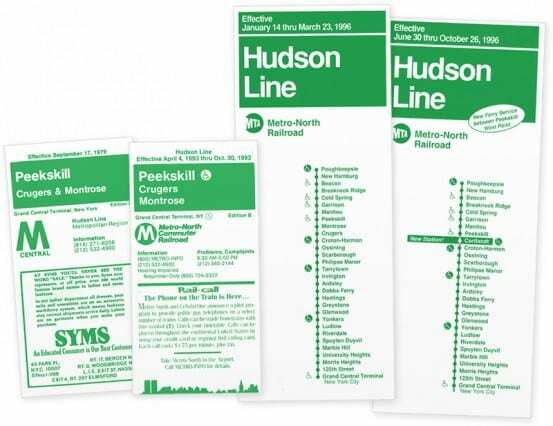 The menu featured an example of the artwork one could find in the gallery, and the back contained a rather dated ad suggesting that businessmen take their wives on the trains and only pay half (which, if you are interested, I posted on the I Ride the Harlem Line facebook page). 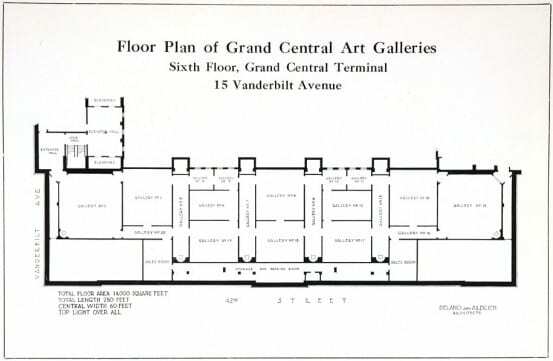 The Grand Central Art Galleries were established in 1923, and remained in the Terminal until 1958, when they moved to the nearby Biltmore Hotel. 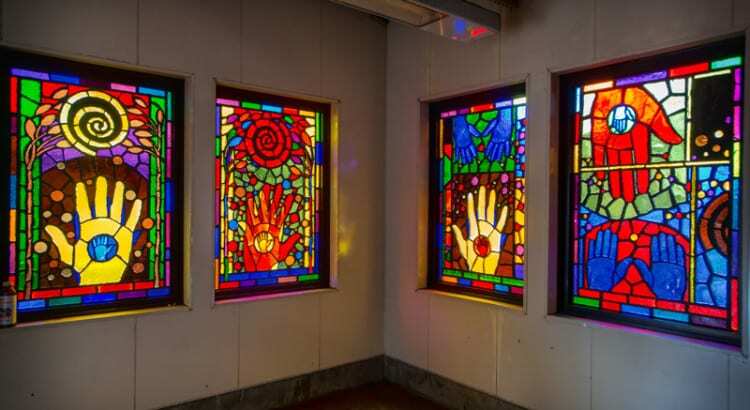 Long established in our collective consciousness is the concept that a dead artist is worth more than a living one, but this gallery’s intent was to sell the artworks of the living. 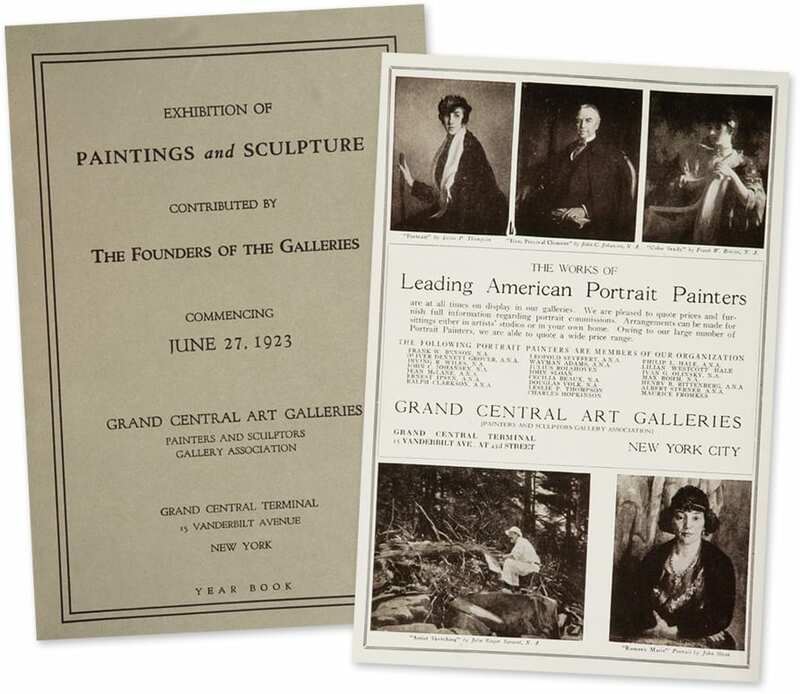 Both artists and non-artists paid a membership fee, providing artworks (1 a year, for 3 years) and cash ($600 when the galleries opened), respectively. 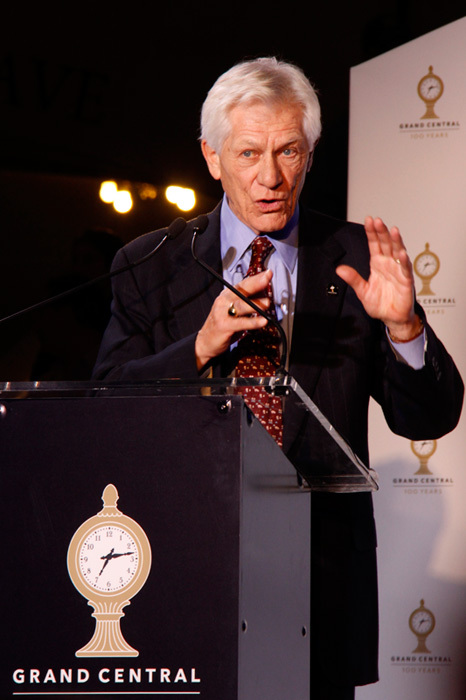 A wide variety of artists were associated with the Grand Central Art Galleries over its many years, including some well-known faces in the art world like John Singer Sargent. 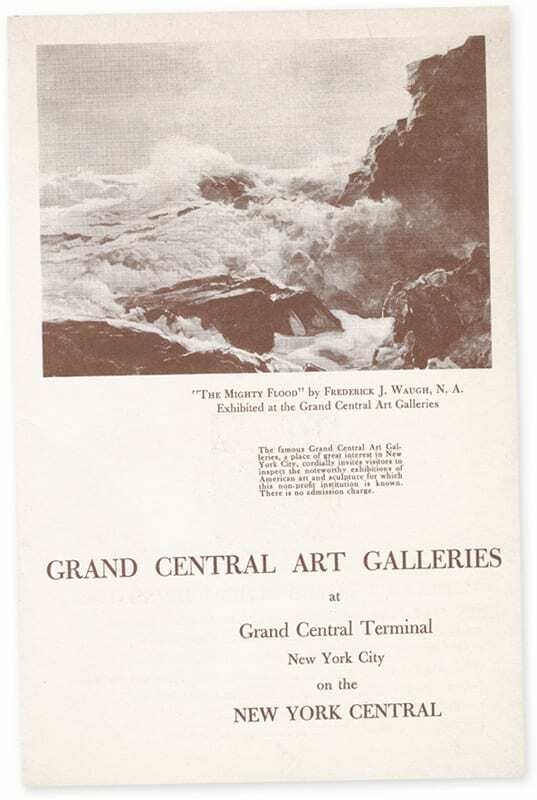 Featured on the menu above was a painting by Frederick Judd Waugh, whose art frequently depicted ocean scenes. 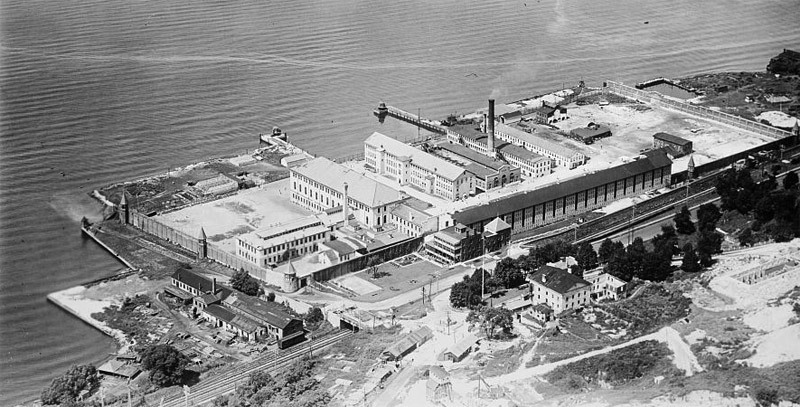 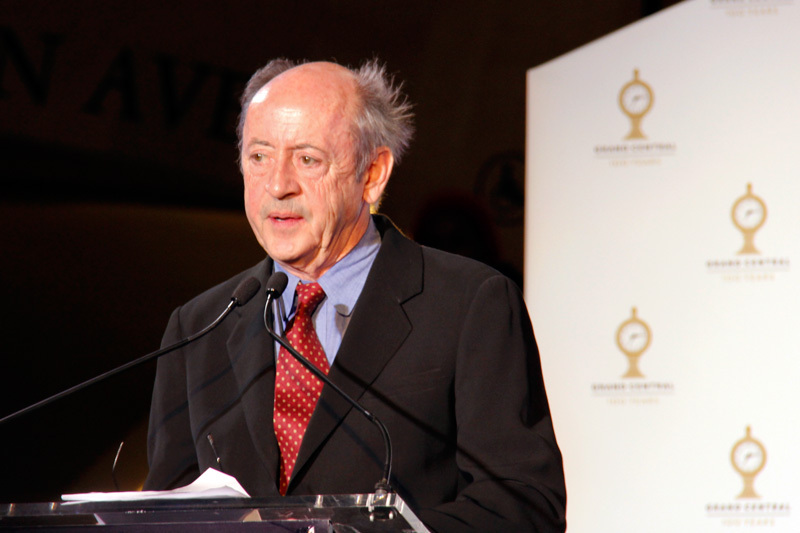 He was also known for designing ship camouflage with the US Navy during World War I. 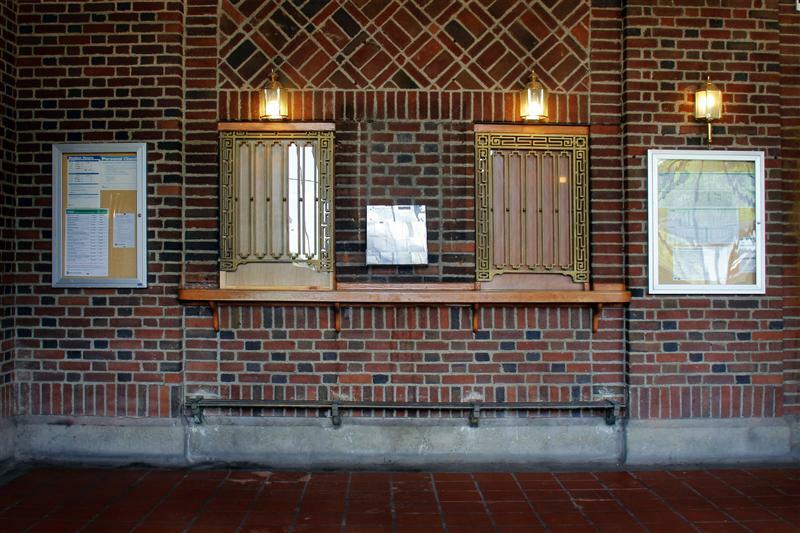 Today Grand Central’s upper floors are off-limits to the general public… but if you’d like to see how the 6th floor looked back in the late 1920s, here are a few photos! 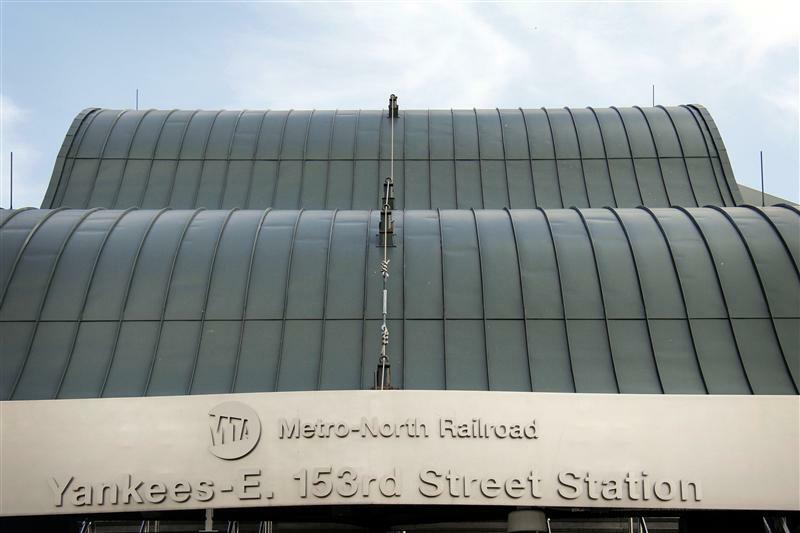 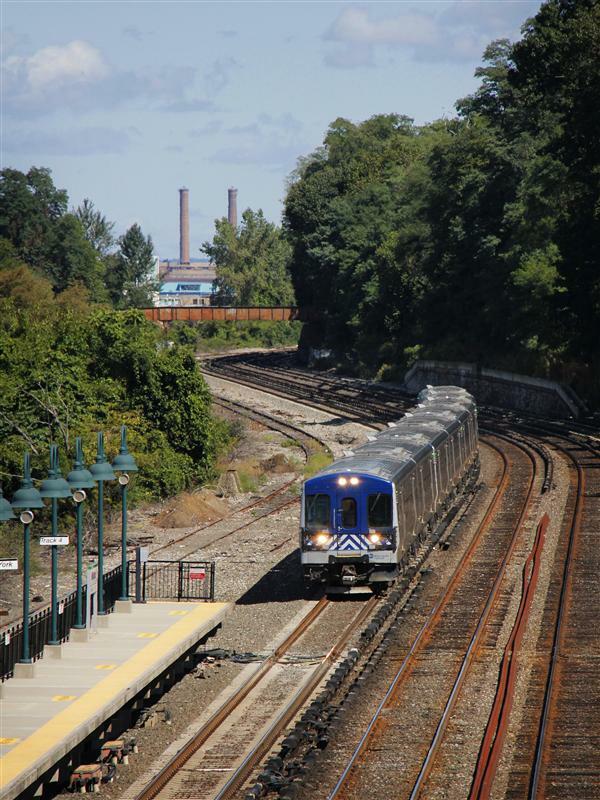 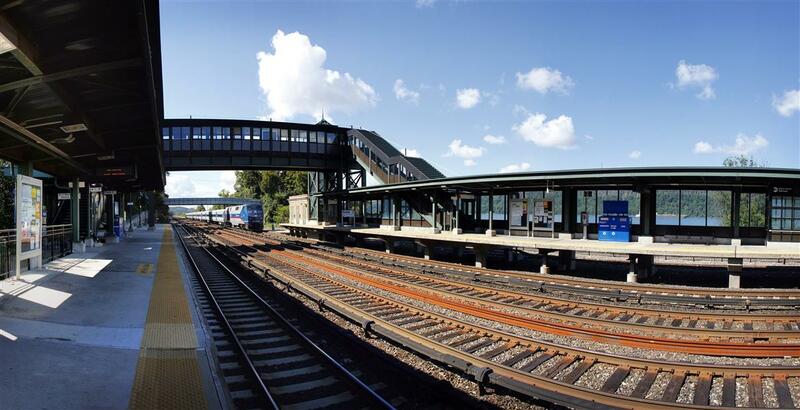 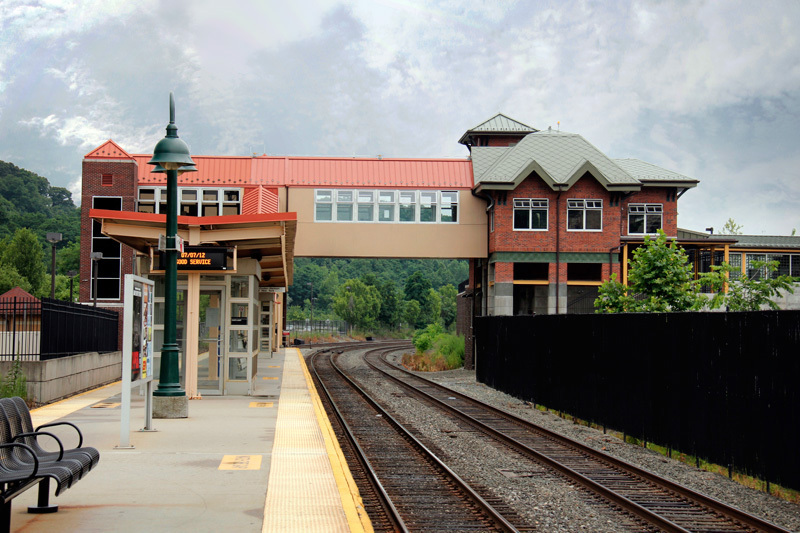 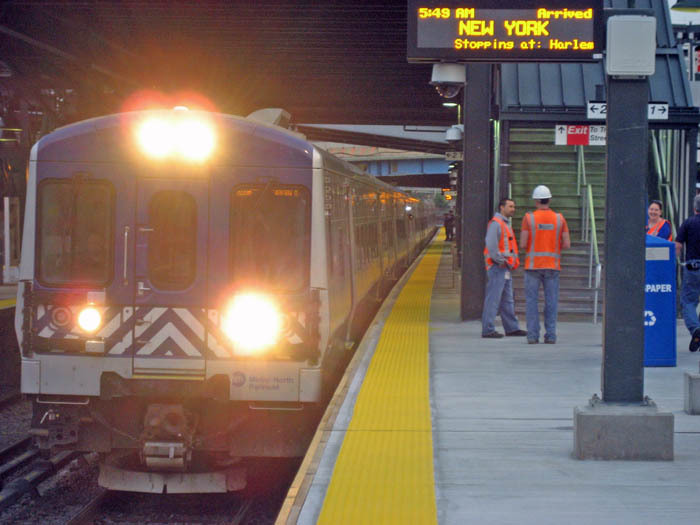 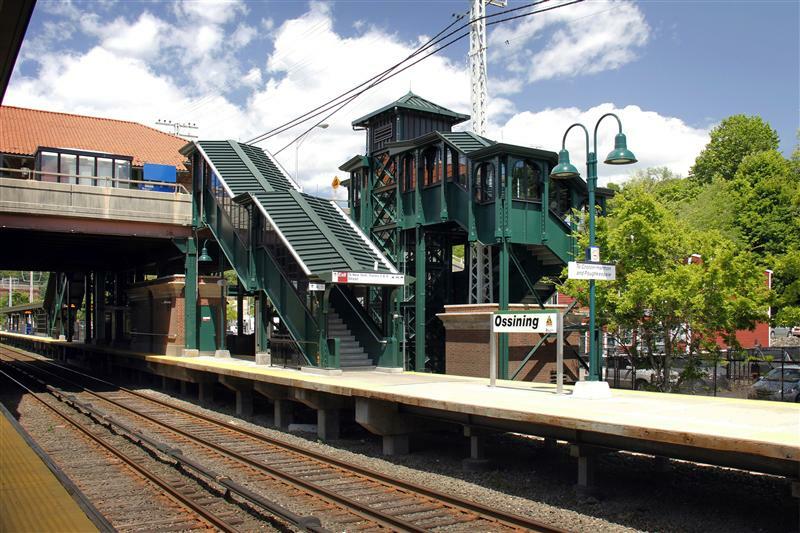 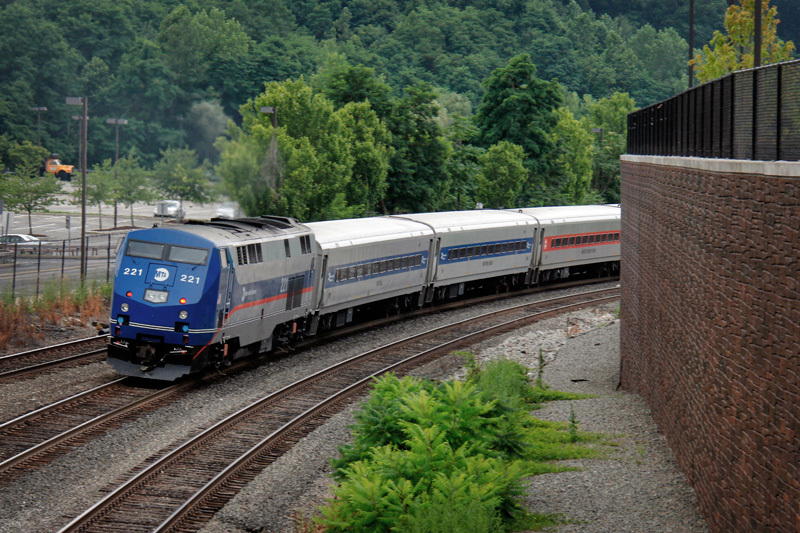 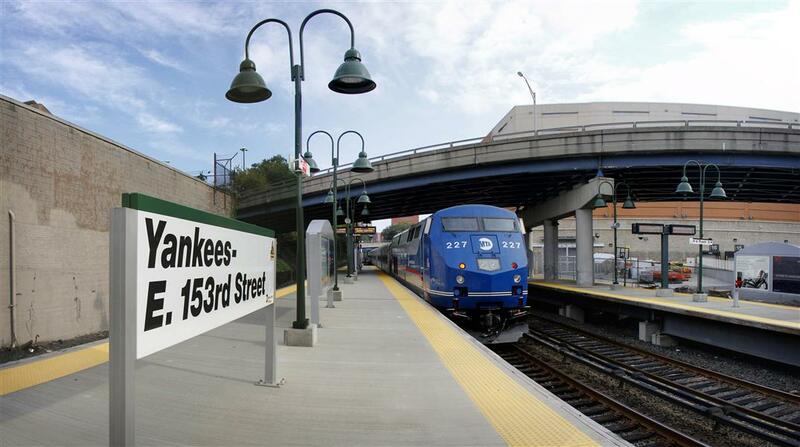 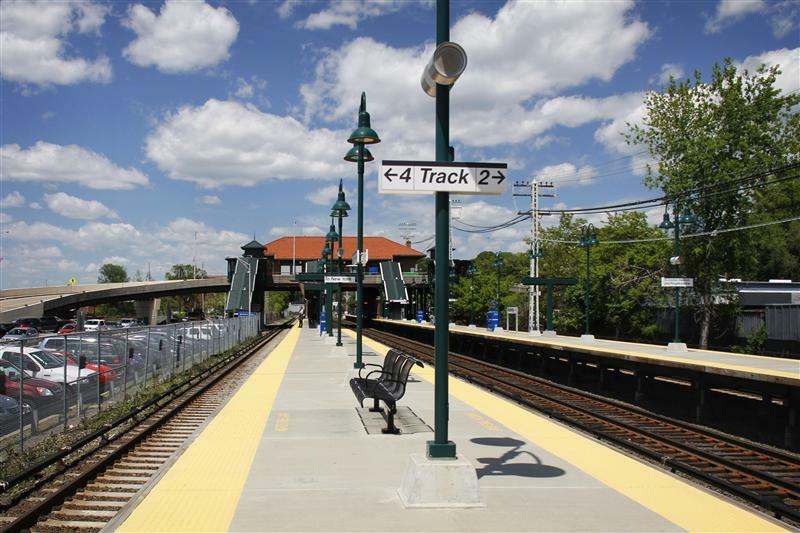 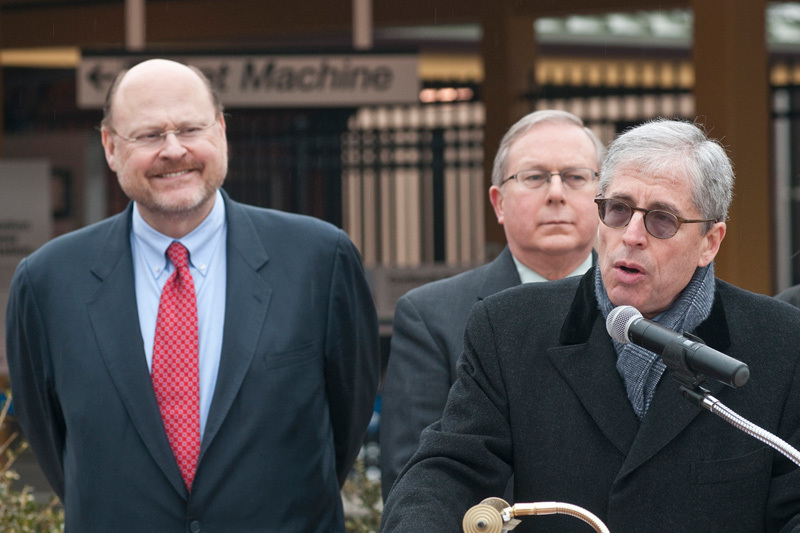 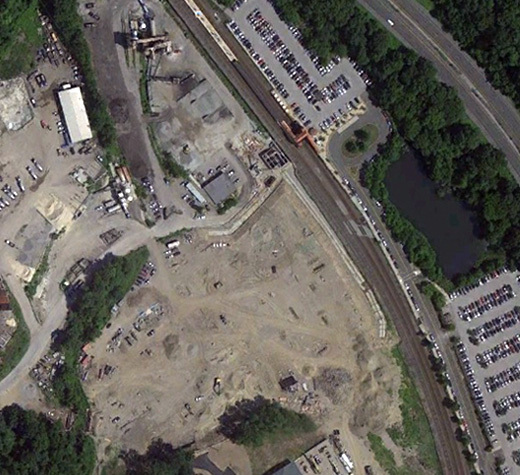 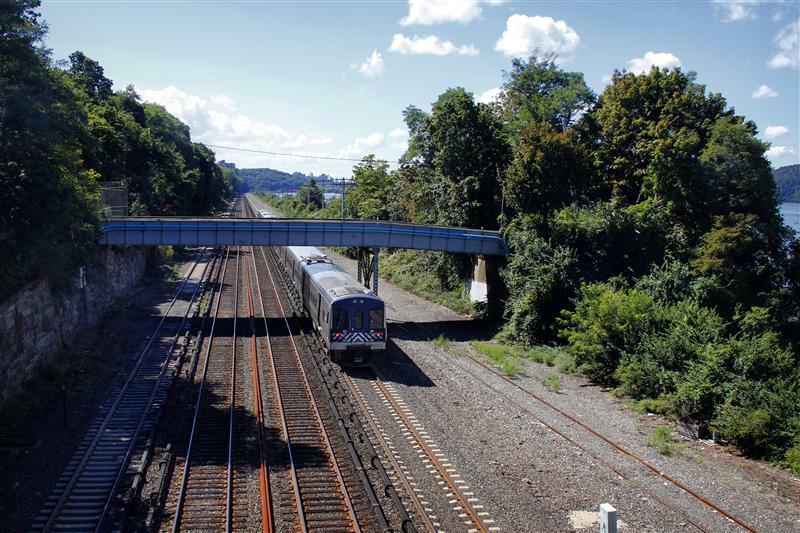 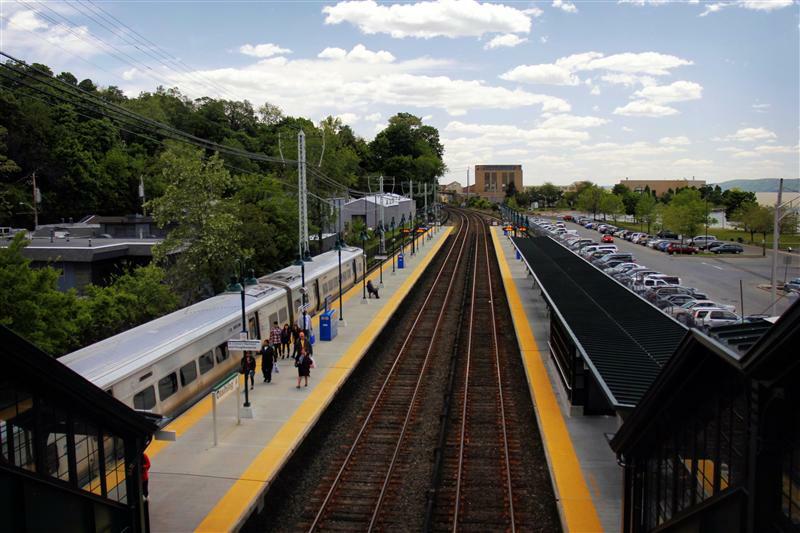 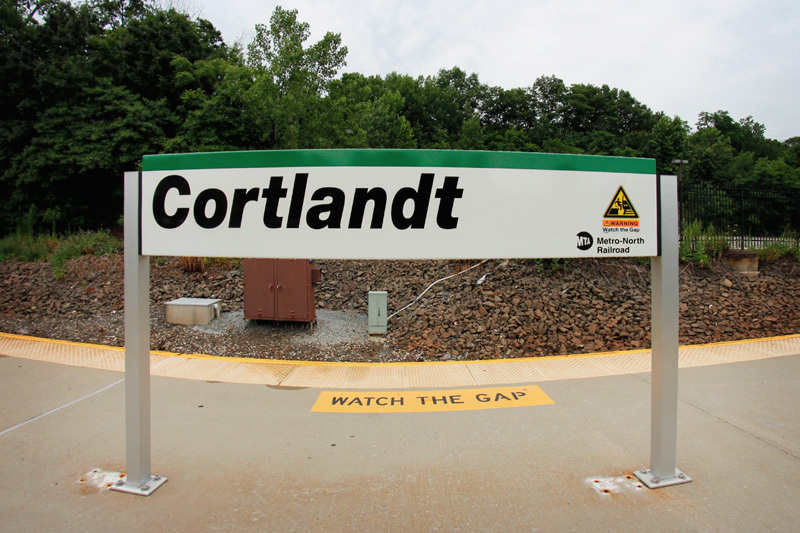 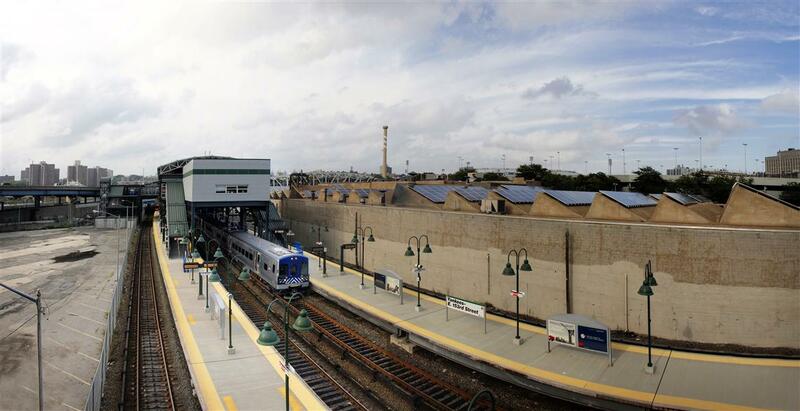 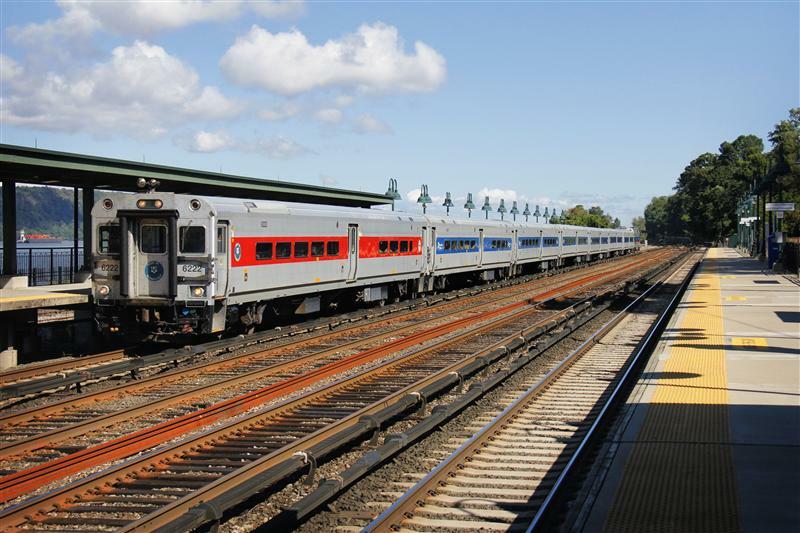 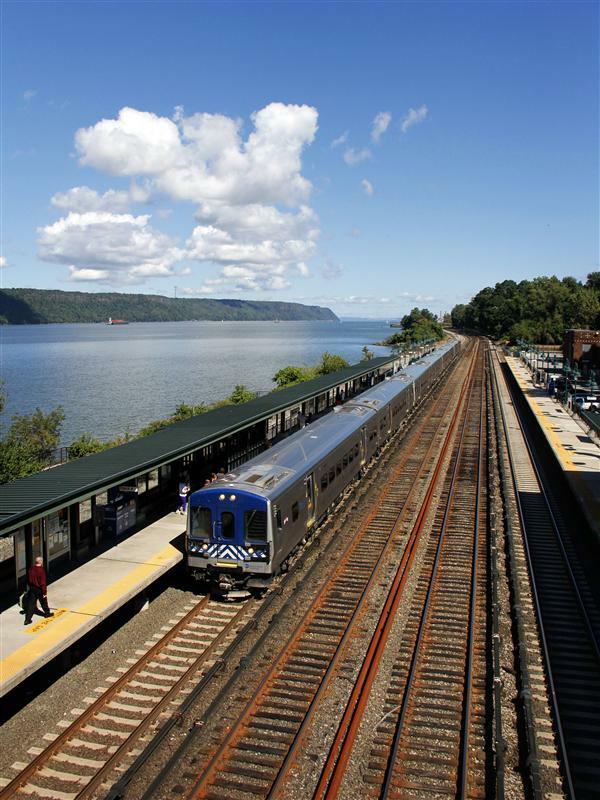 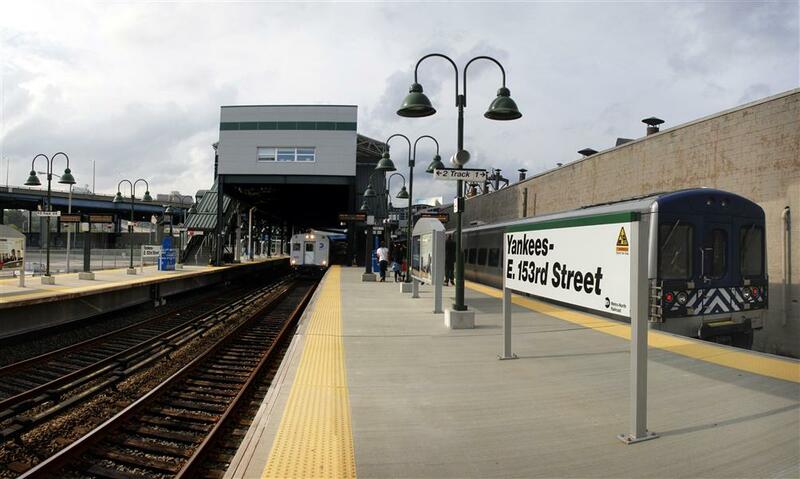 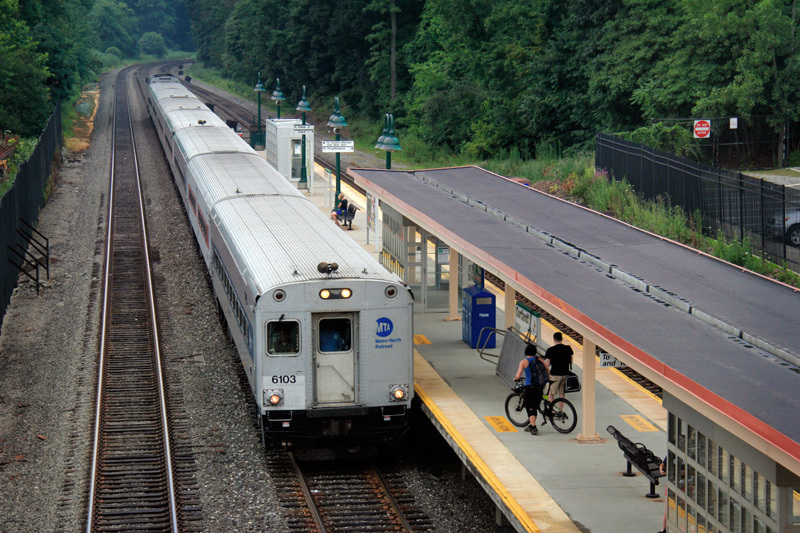 Metro-North’s station at Riverdale is located 13 miles from Grand Central. 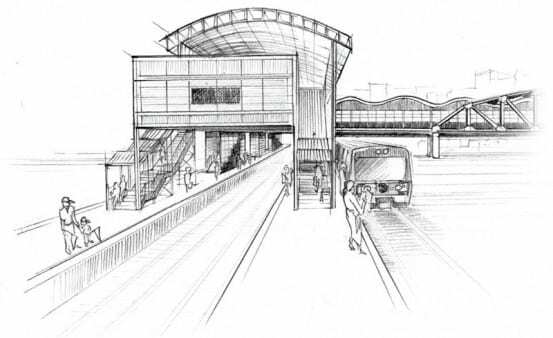 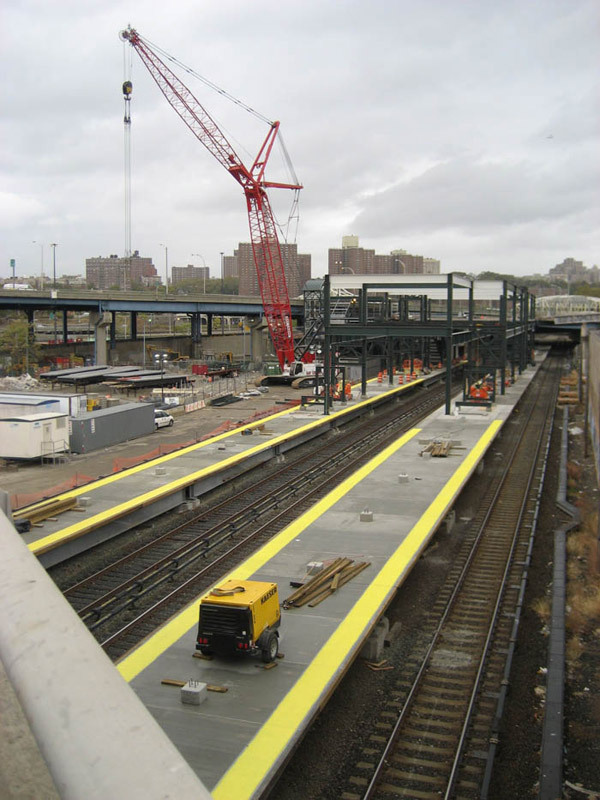 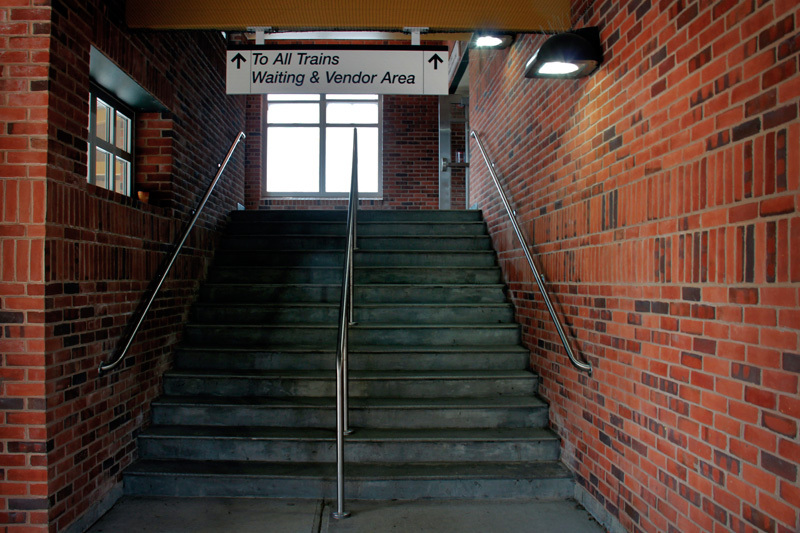 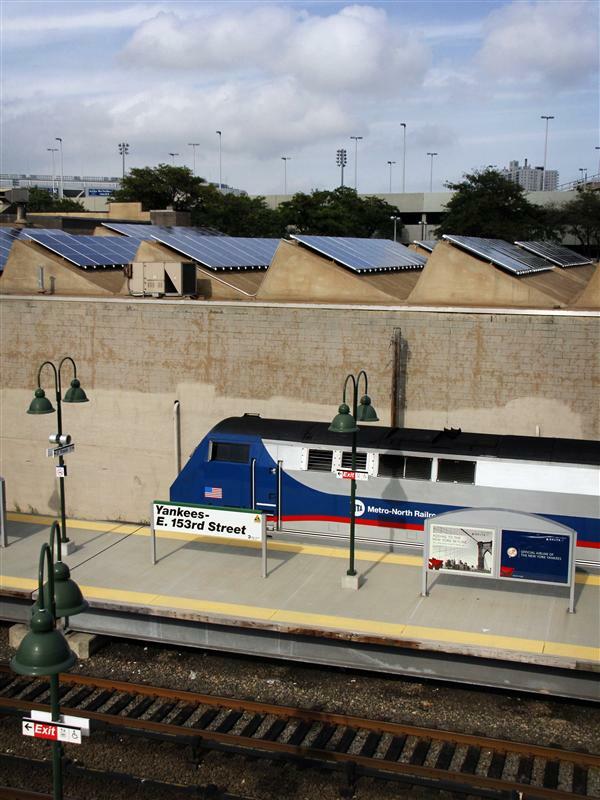 The facilities consist of an overpass with a few ticket vending machines, and two side platforms. 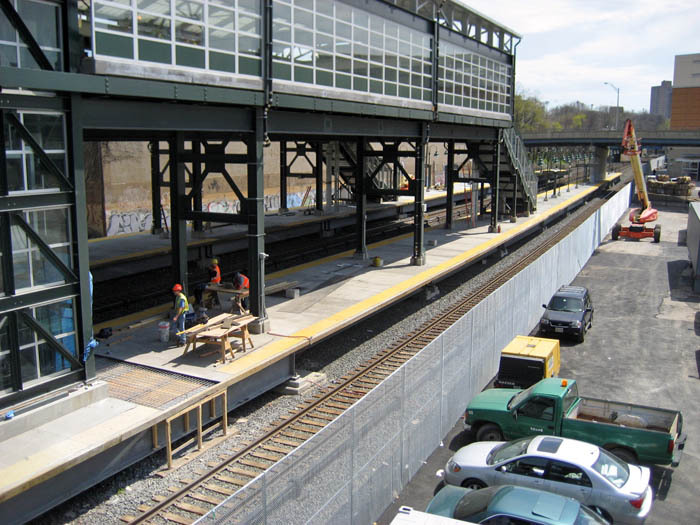 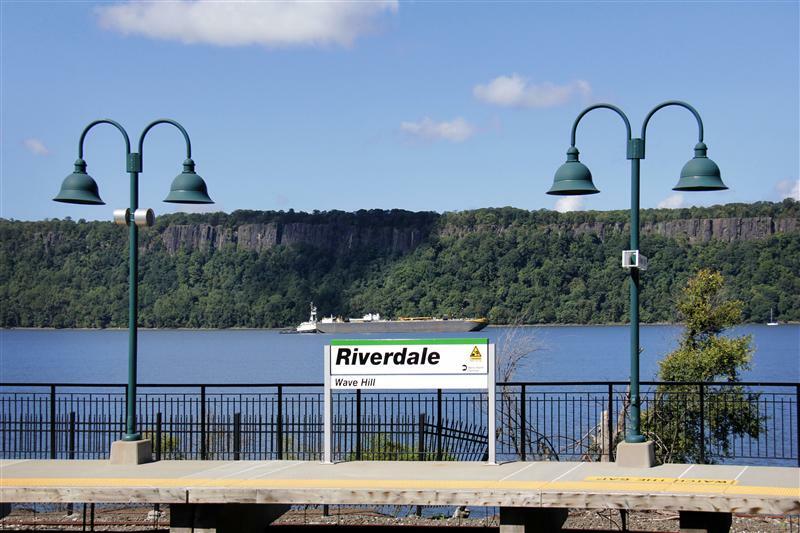 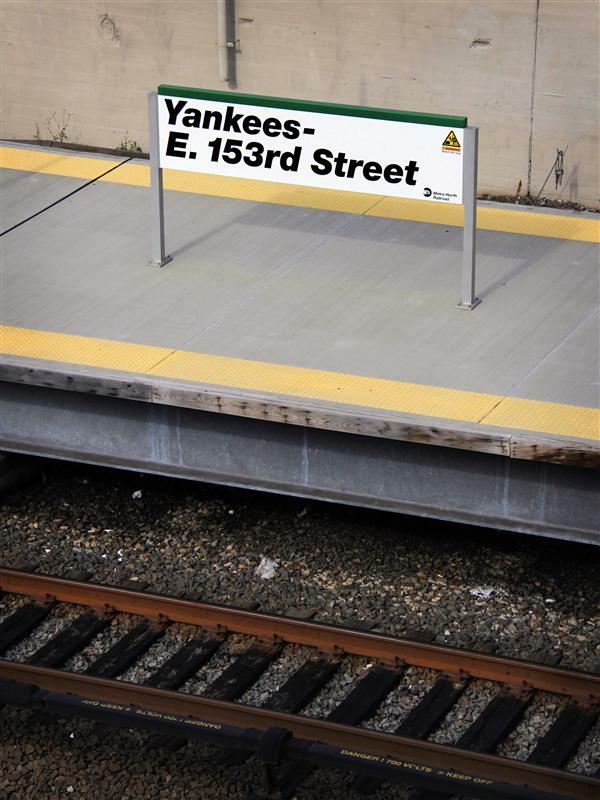 Today, Riverdale is the northernmost station in the Bronx on the Hudson Line (Mount St. Vincent station was located north of Riverdale, but was closed many years ago). 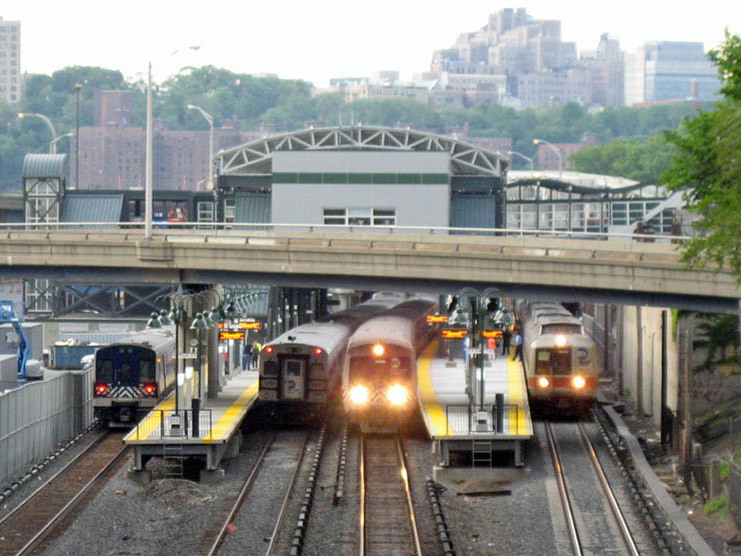 Although the station has some parking, a good amount of people use the Hudson Rail Link to get to the station. According to architects Shepley, Rutan, and Coolidge’s archives, they designed a station for the Hudson River Railroad here in 1889, though I can’t seem to find any photos or mentions of it later on. 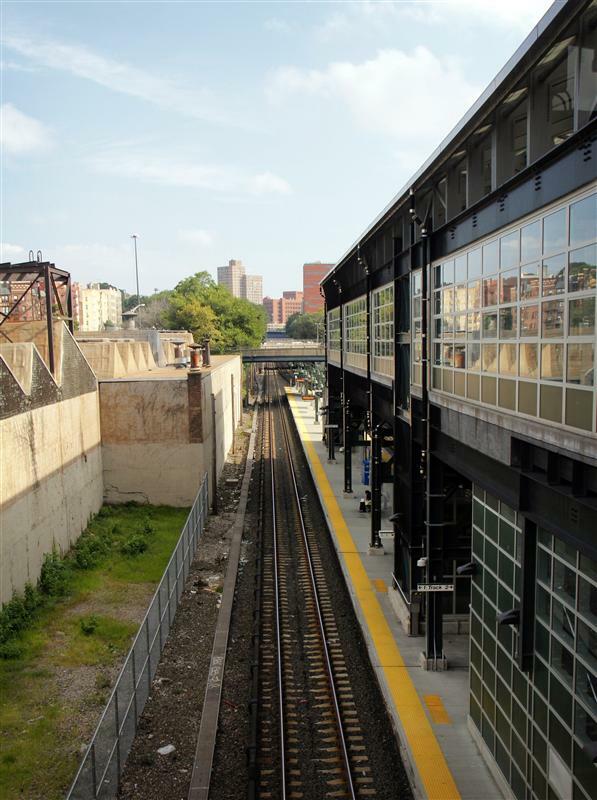 Right alongside Riverdale station is a small park that parallels both the tracks and the Hudson River. 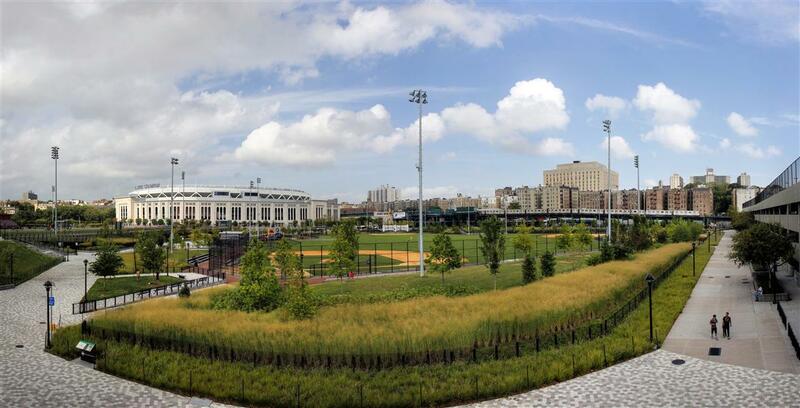 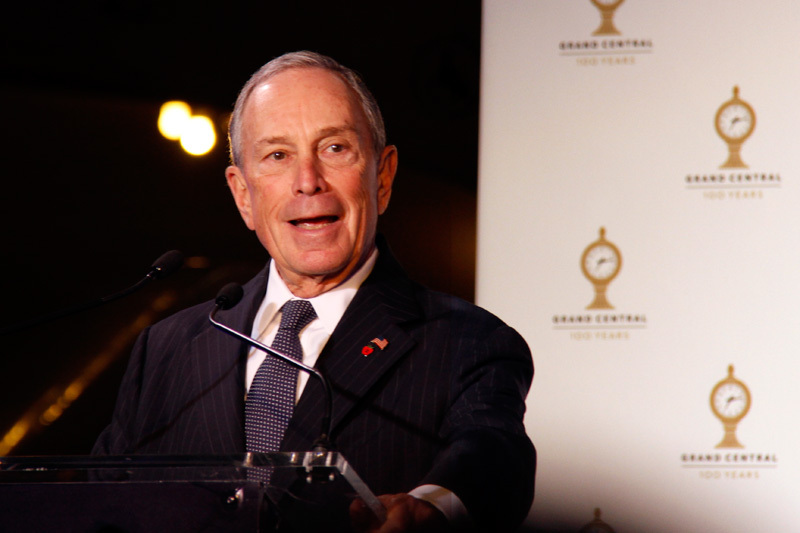 Although dedicated by Michael Bloomberg in 2005, and featured in the New York Times a year after, the park seems largely forgotten. 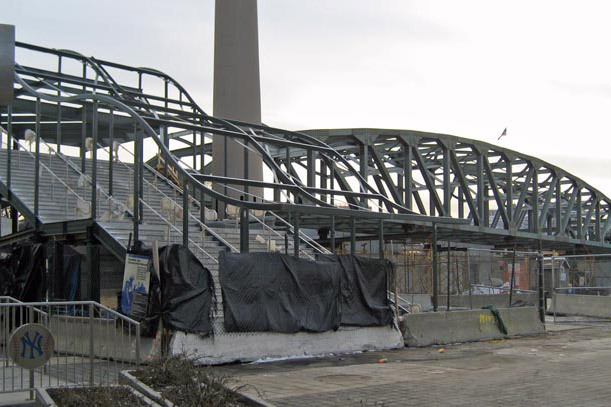 The official name of the place is the “Riverdale Waterfront Promenade and Fishing Access Site”, but you might as well call it a big stinky mess. 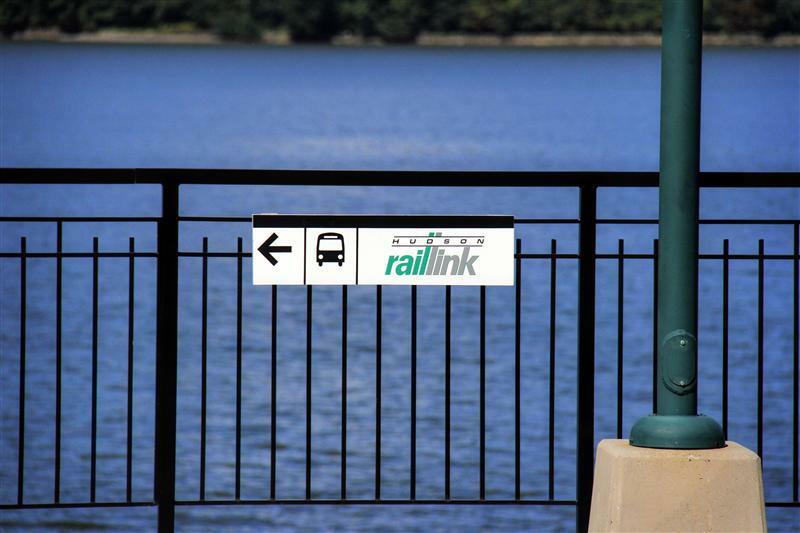 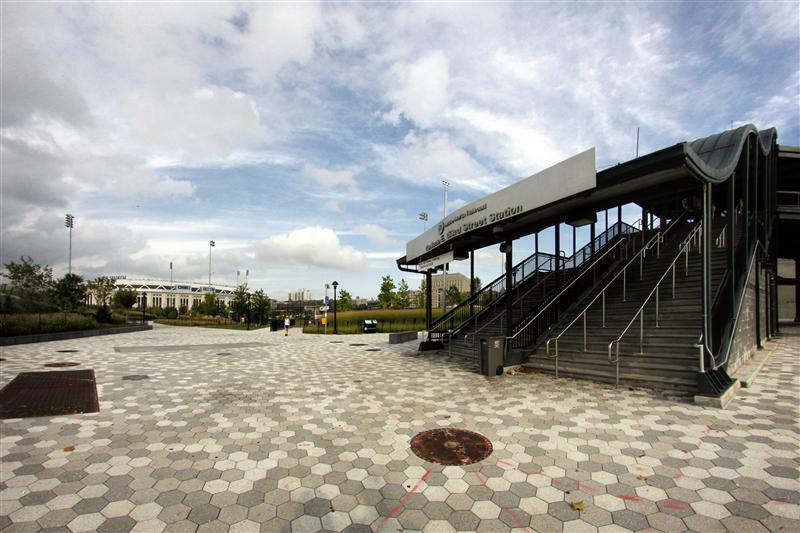 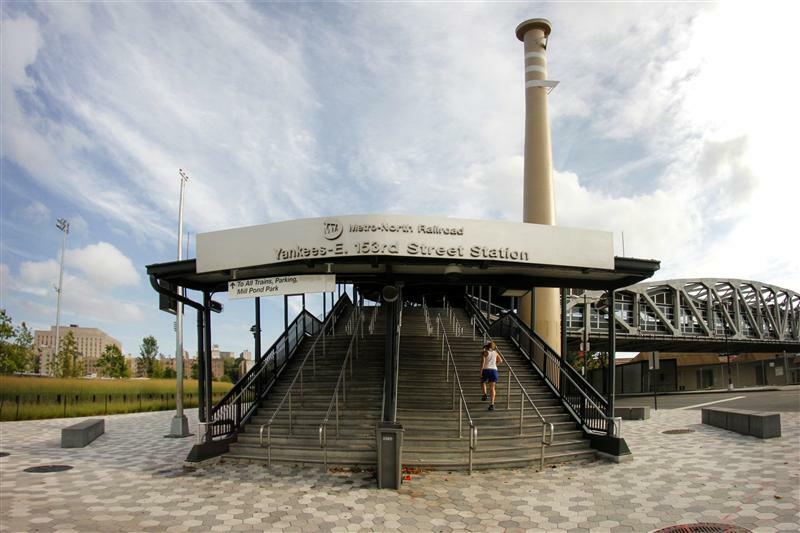 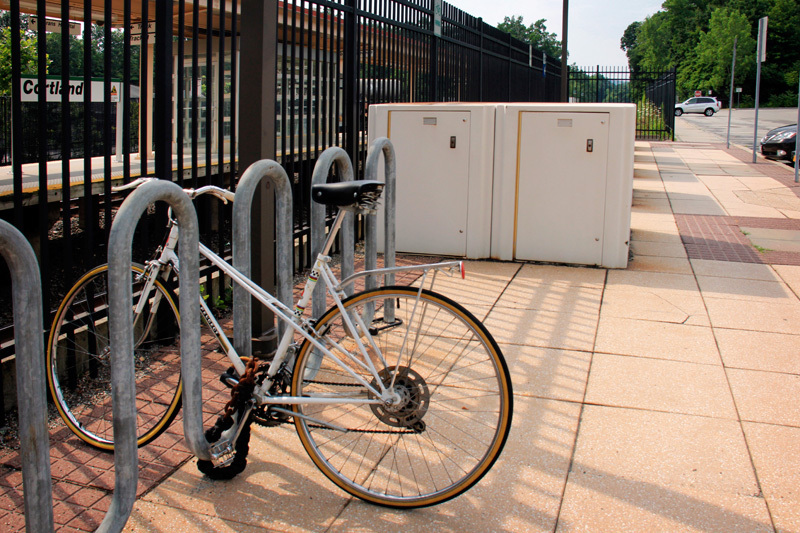 Access to the small park is gained on the southbound platform, where you descend a set of stairs and cross over a rail siding to reach the riverfront. 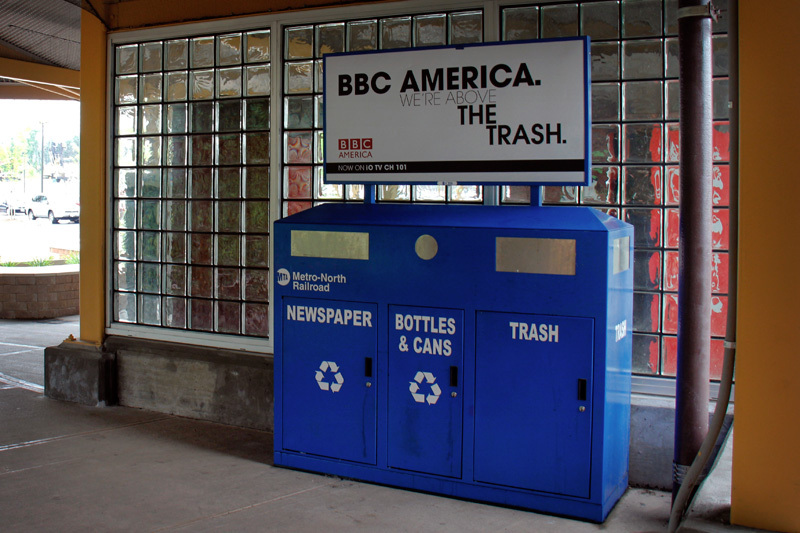 It would likely be a nice place, if not for the stinky fish guts strewn about the sidewalk, and the overfilled trash bins that probably hadn’t been emptied in weeks. 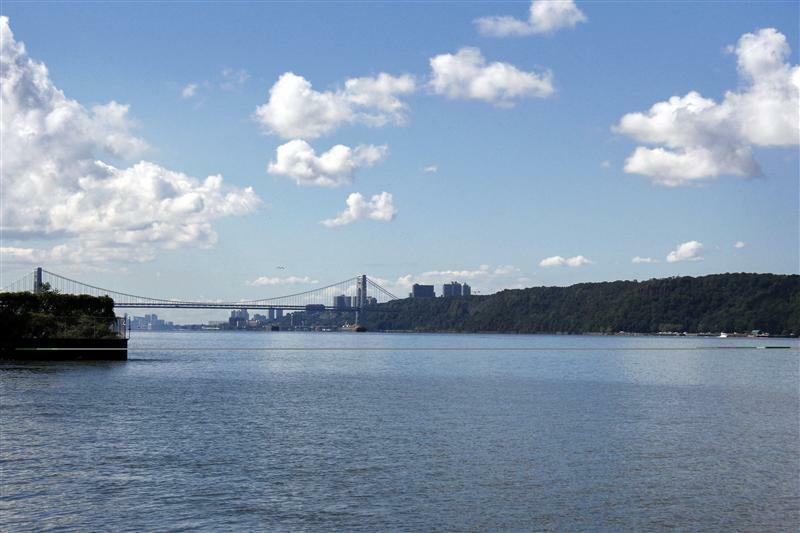 Without the trash, the park really would be a nice place to just sit and watch the river. 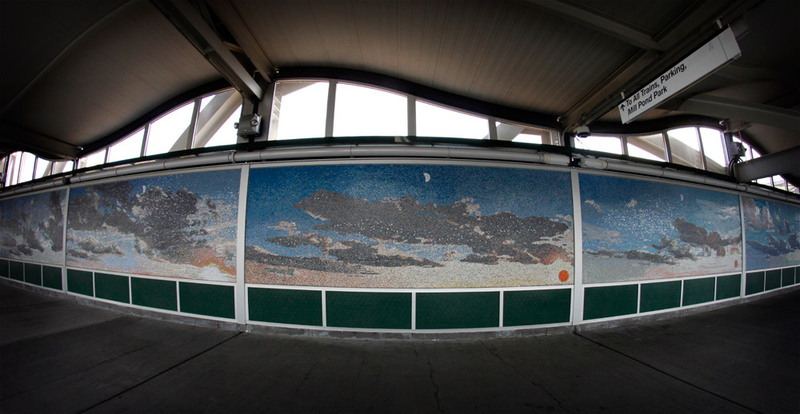 Also at Riverdale station is one of the most unphotogenic Arts for Transit pieces – and it’s certainly not the fault of the artwork. 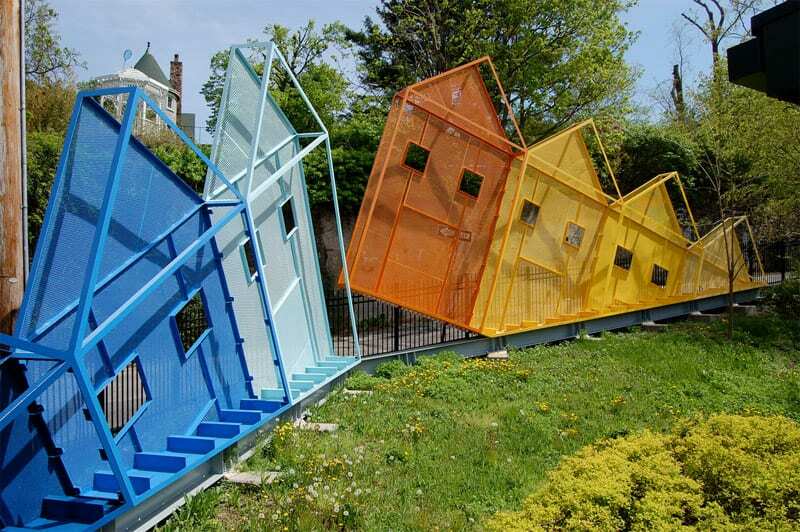 Rising and Setting, by Dennis Oppenheim is a colorful steel sculpture, unfortunately overtaken with weeds. 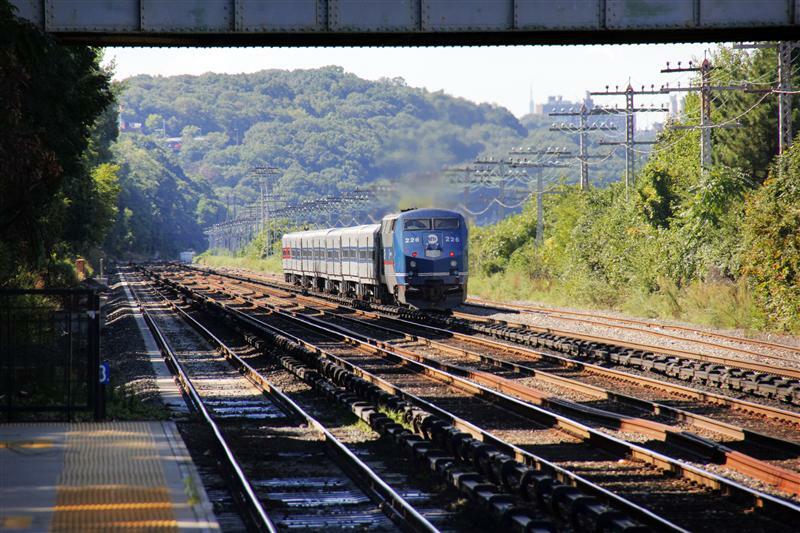 Metro-North desperately needs to send someone over there with a weedwhacker. 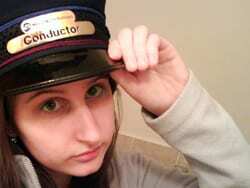 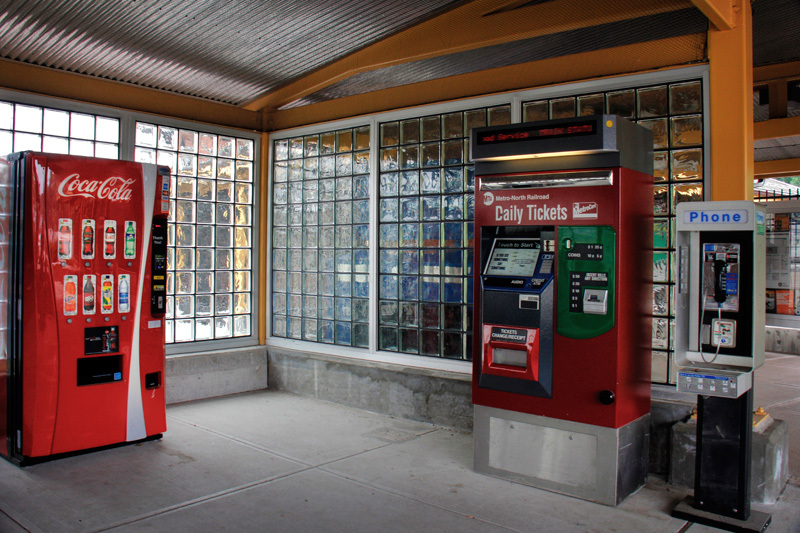 As much as I love the Arts for Transit program, I wonder at times if everybody fully thinks these things through. 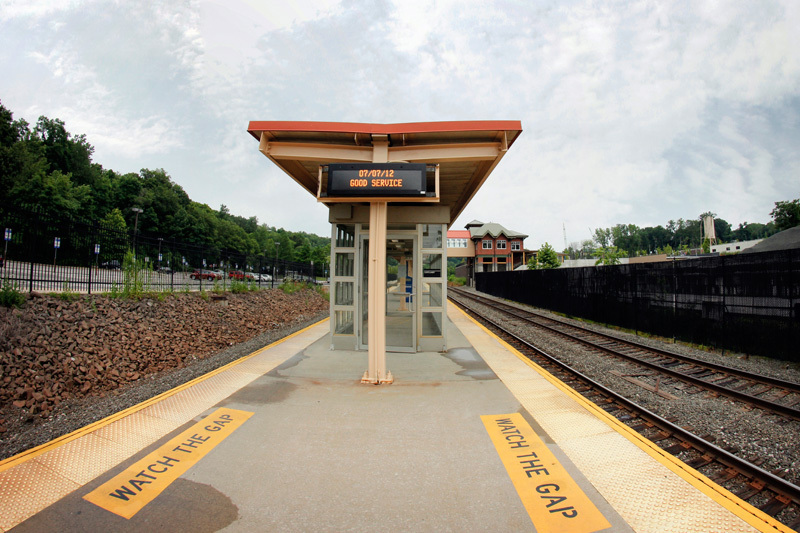 Putting art in locked stations is pointless, and although pretty horrible, North White Plains‘ art has been desperate for a paint job for years. 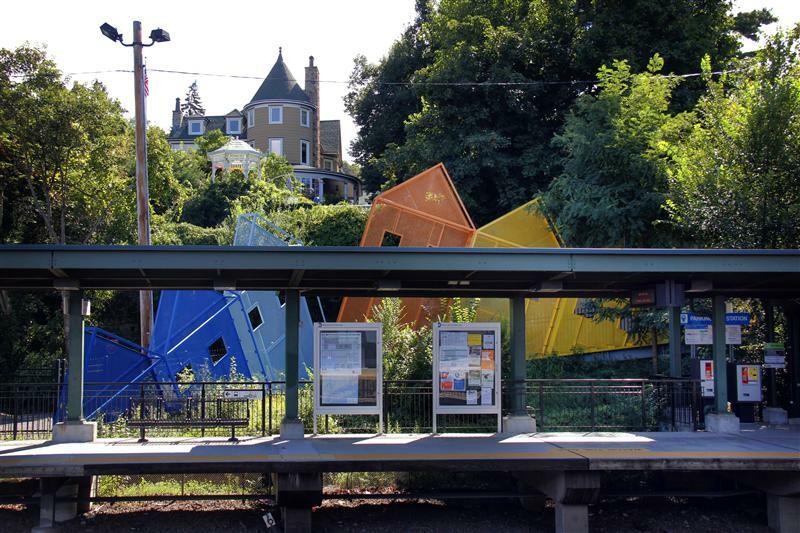 All of these wonderful installations certainly need to be maintained – and at places like Riverdale (and Wassaic, where the art is also being obscured by growth) sending somebody to trim some plants seems like a pretty easy fix! 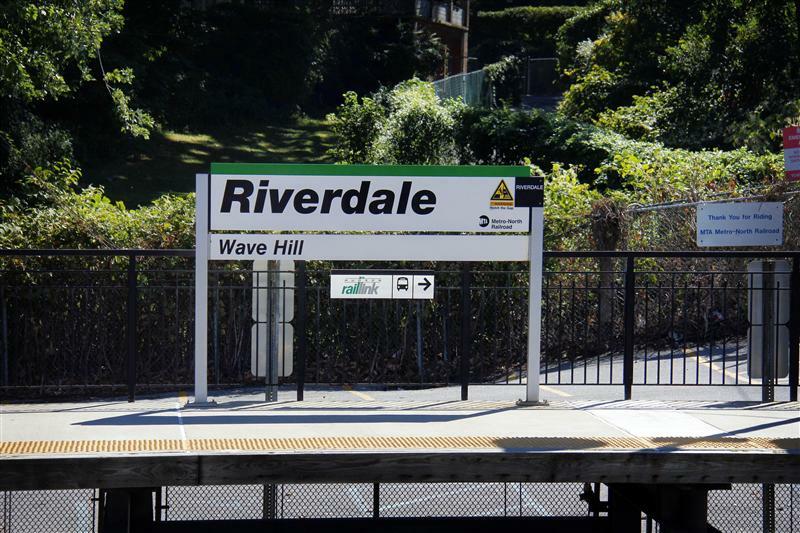 Though the area doesn’t get any bonus points for the stinky park, and few for the art, I really don’t mean to be insulting to Riverdale. 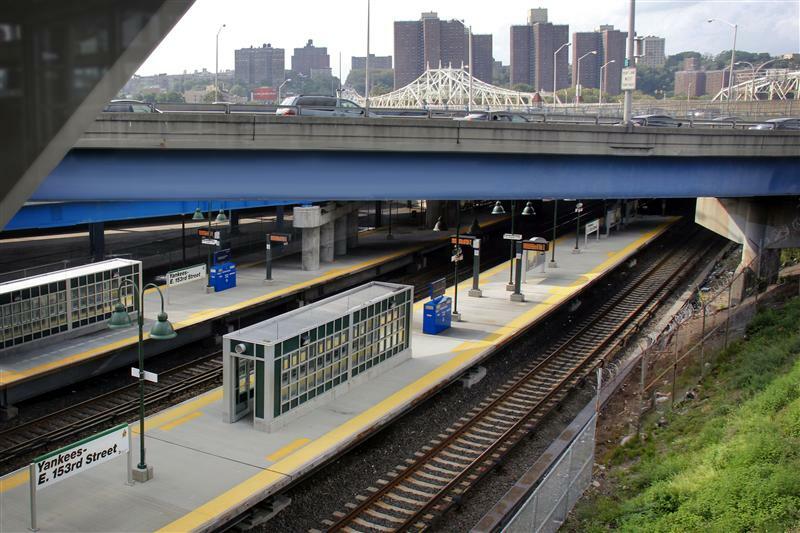 The station is quite nice, and from the overpass, the view of the river and the Palisades is quite wonderful. 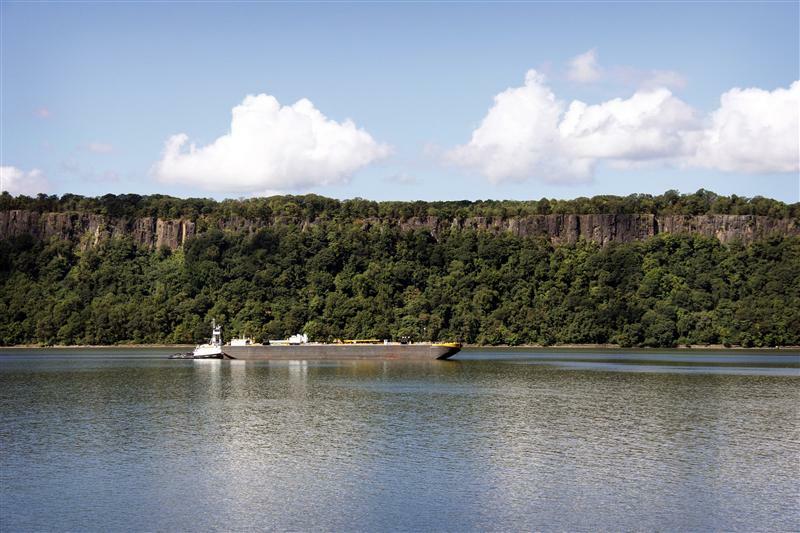 Even from the platforms you can see large ships and tiny pleasure-crafts moving up and down the river. 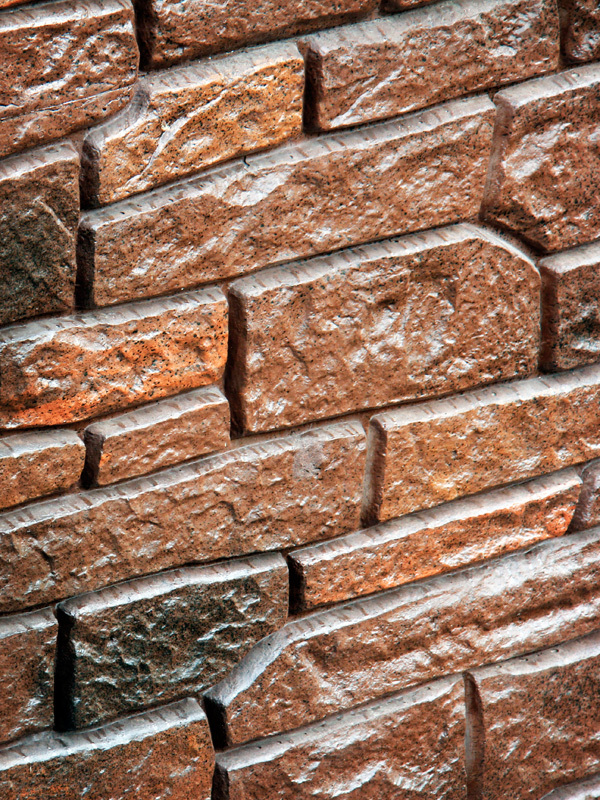 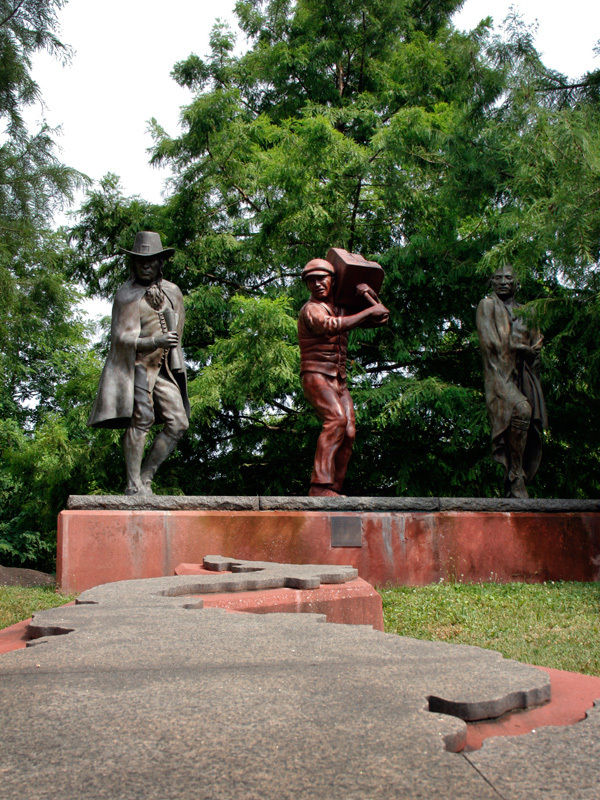 Wave Hill, the 28-acre public garden, is a worthwhile attraction not far from the station. 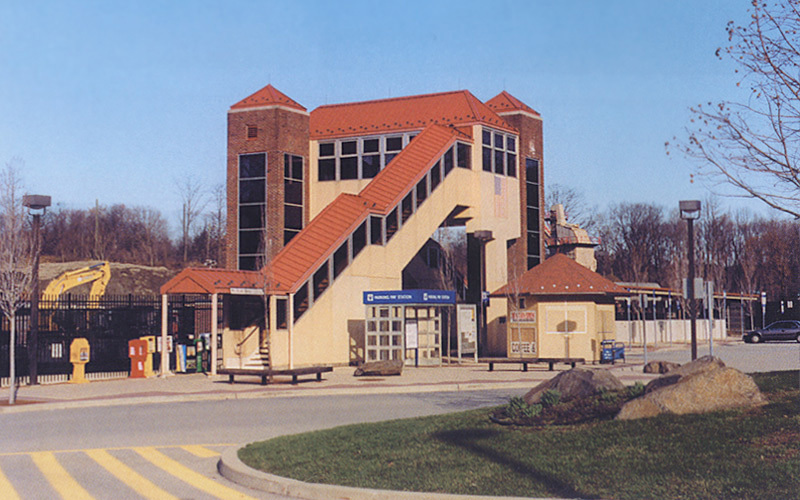 They even operate a free shuttle to public transit riders, so it is definitely worth checking out if you’re ever in the area. Everybody knows Sing Sing – Late 1800’s stereoview of the railroad tracks running through the prison. 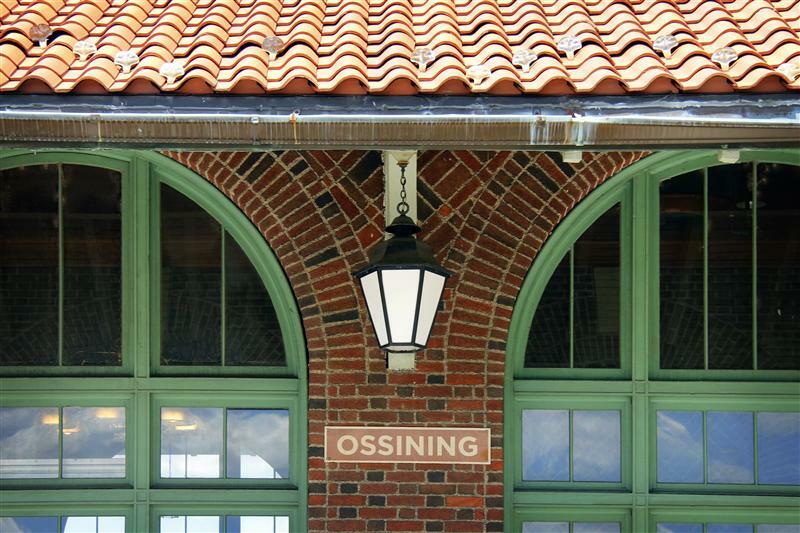 Yes, Ossining is the home of Sing Sing prison, or as it is known now, the Sing Sing Correctional Facility. 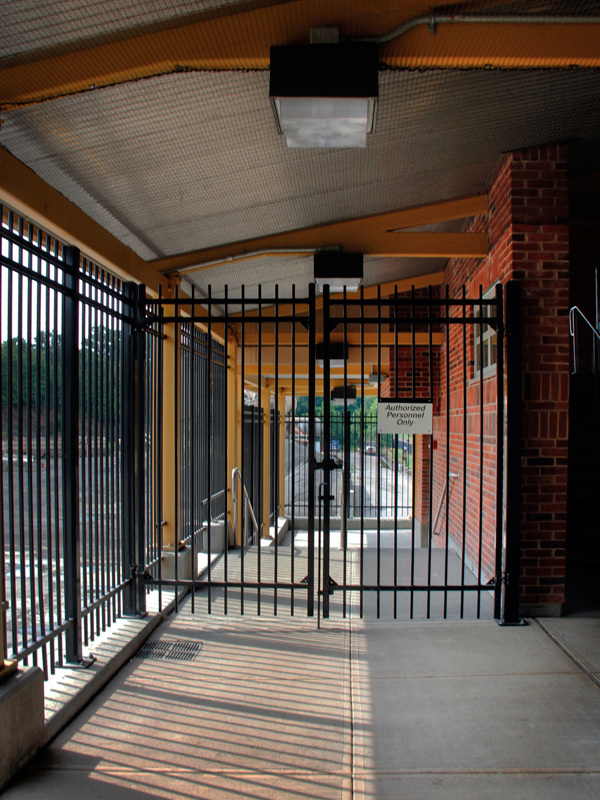 Dating back to the early 1800’s, the prison has been a longtime feature on the Hudson River, as well as along the railroad. 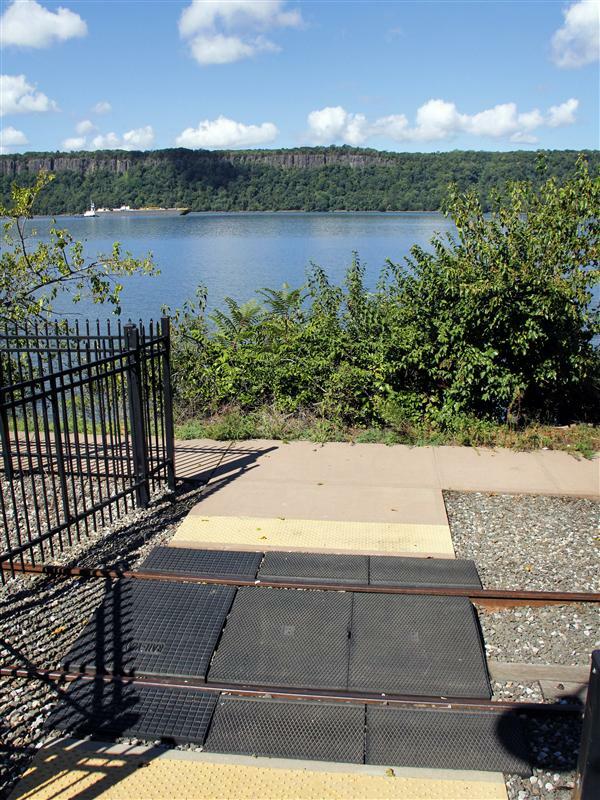 The Hudson River Railroad tracks bisected the prison, and the tracks still pass through there today. 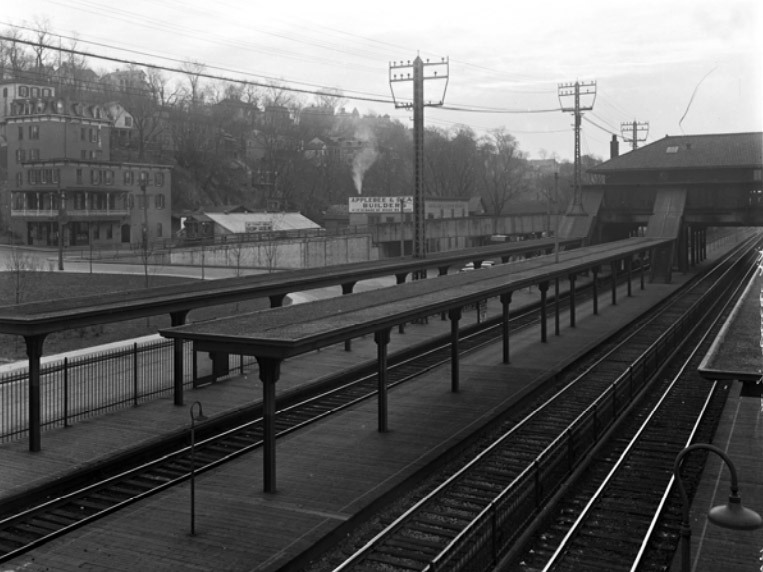 Photo of the railroad tracks going through Sing Sing Prison, circa 1920. 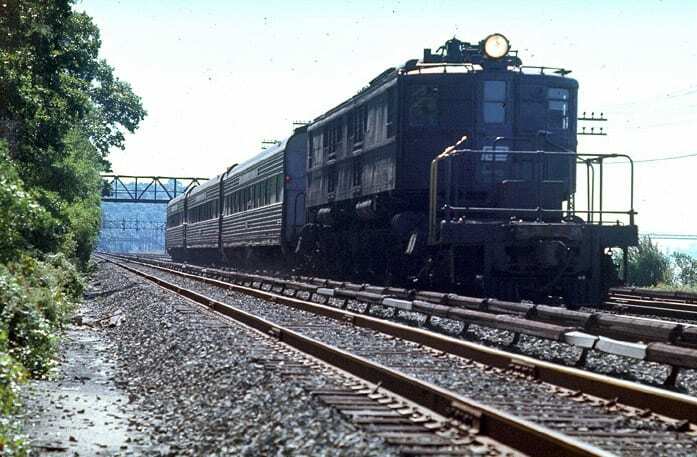 Even those that are not entirely familiar with Sing Sing have probably heard the phrase “sent up the river,” meaning sending someone to prison. 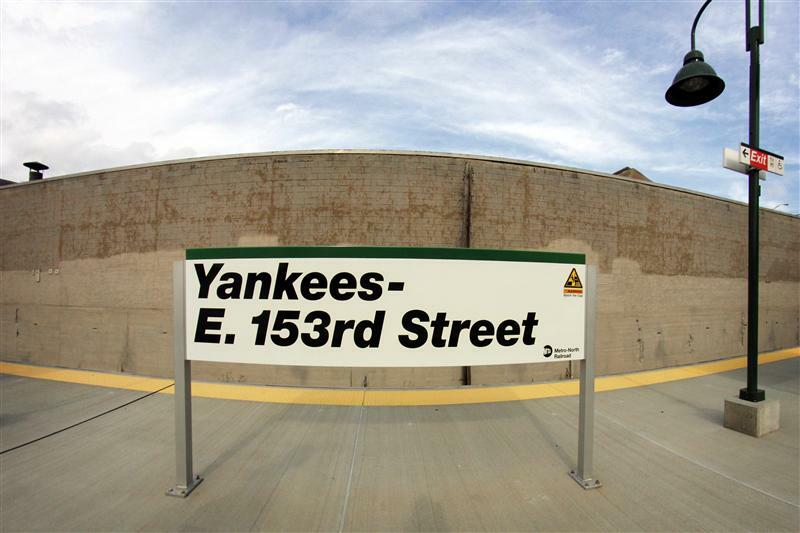 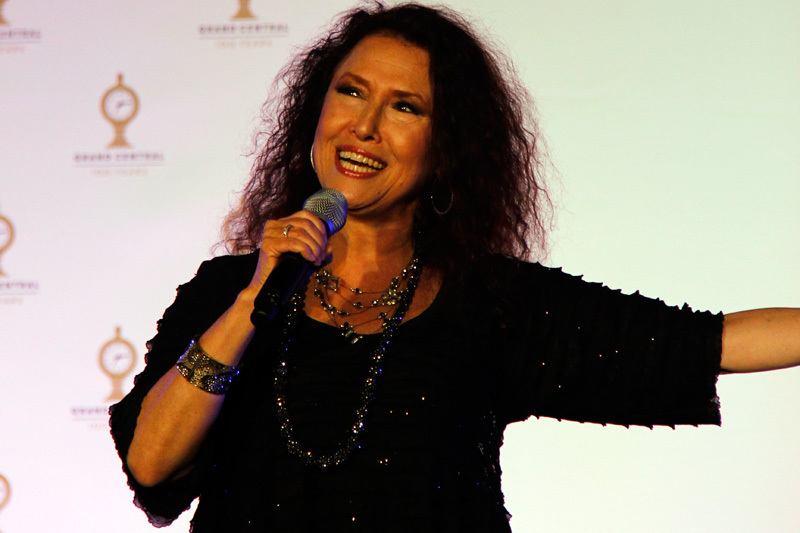 Sing Sing is the origin of that phrase – as it is located right up the river from New York City. 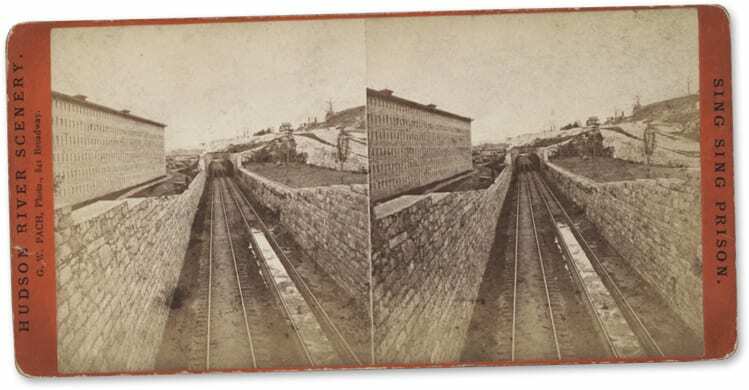 Interestingly enough, some prisoners weren’t quite sent up the river – they were sent up the railroad tracks. 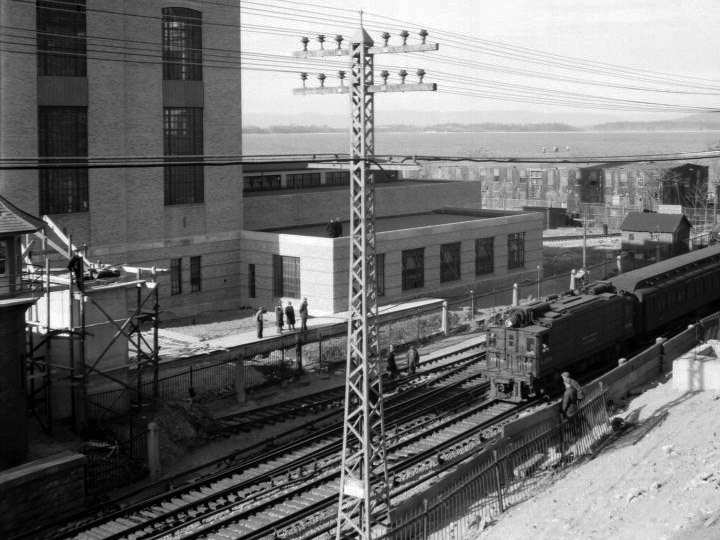 Since the prison was conveniently located right on the railroad, some prisoners were actually transported from the city via train. 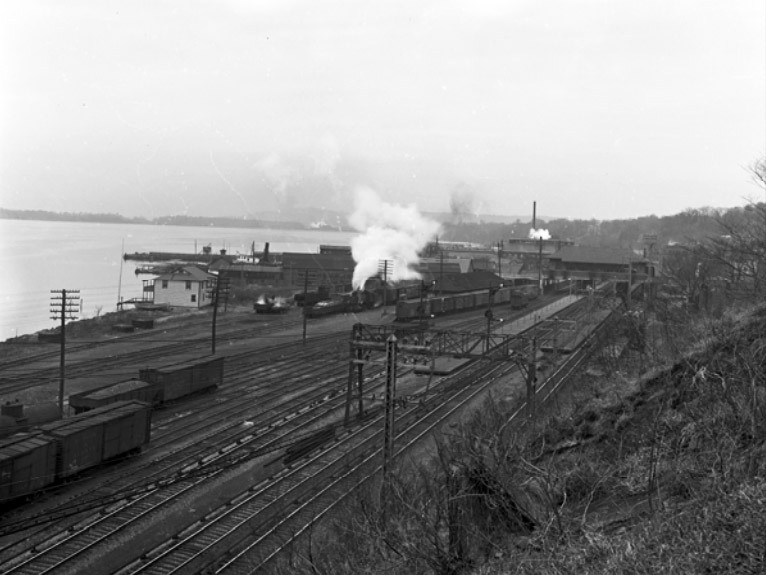 Their nice attire belies their destination – the four seated men on the right are being “sent up the river” by train, circa 1932. 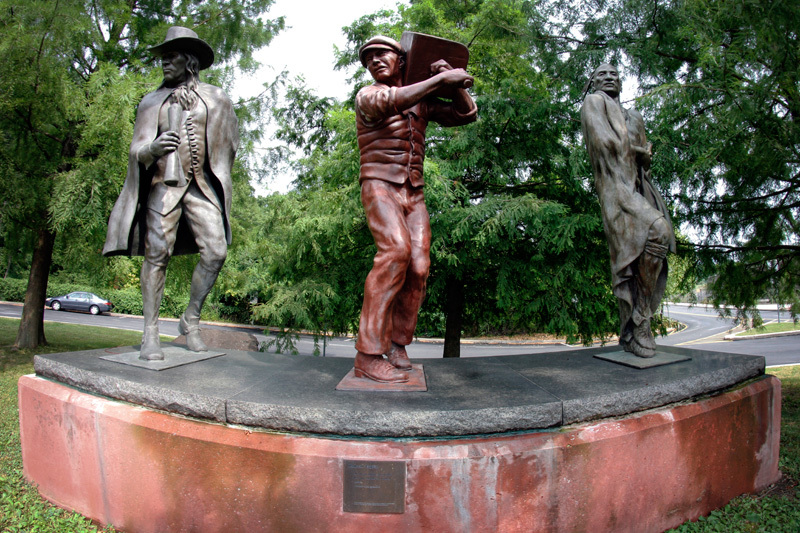 Those four were set to die in Sing Sing’s electric chair for killing a police officer. 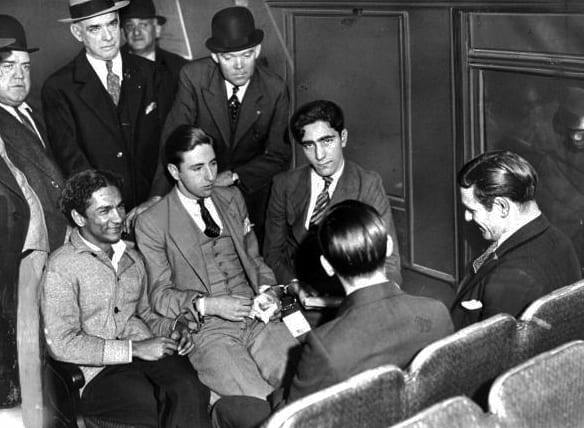 In 1933 the men were granted a new trial, and I can’t find any record of them actually being executed. 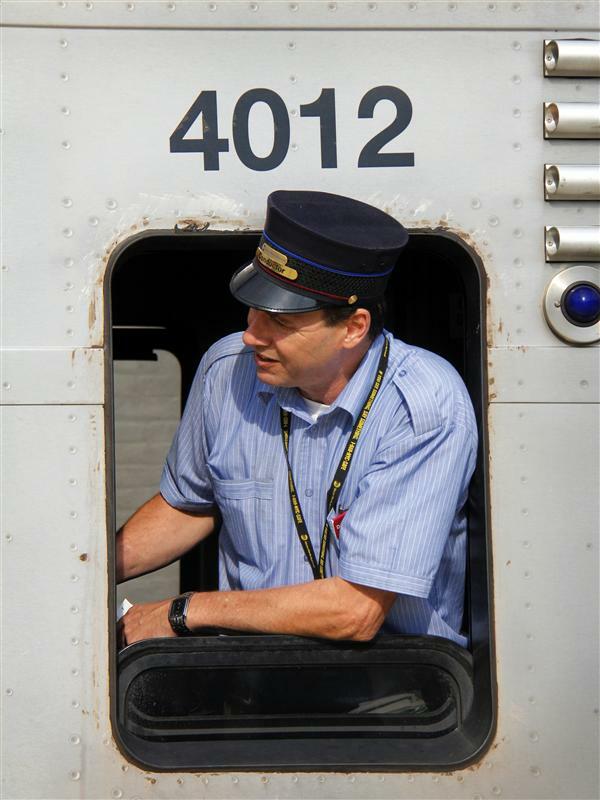 Assumedly prisoners were not carried on the same train/in the same car as normal passengers. 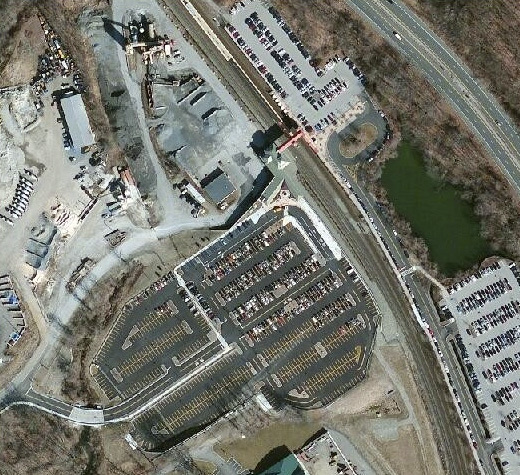 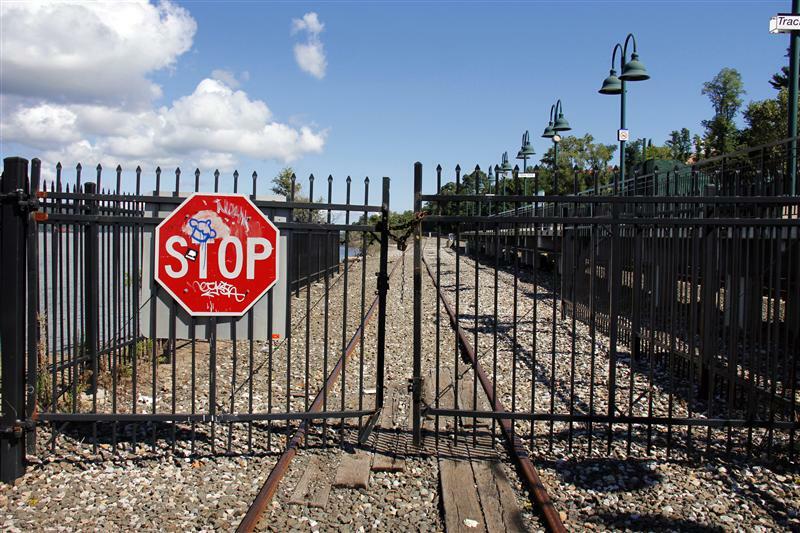 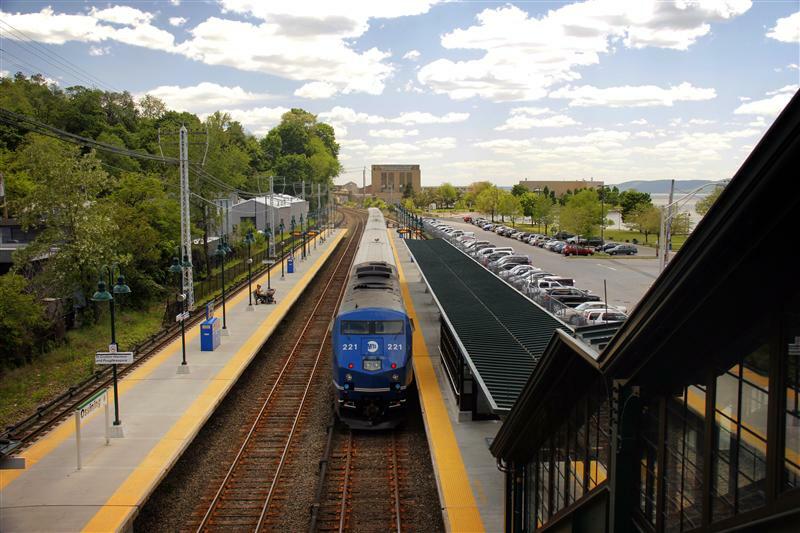 Ossining’s railroad station is located just north of the prison complex, and is about 30 miles from Grand Central. 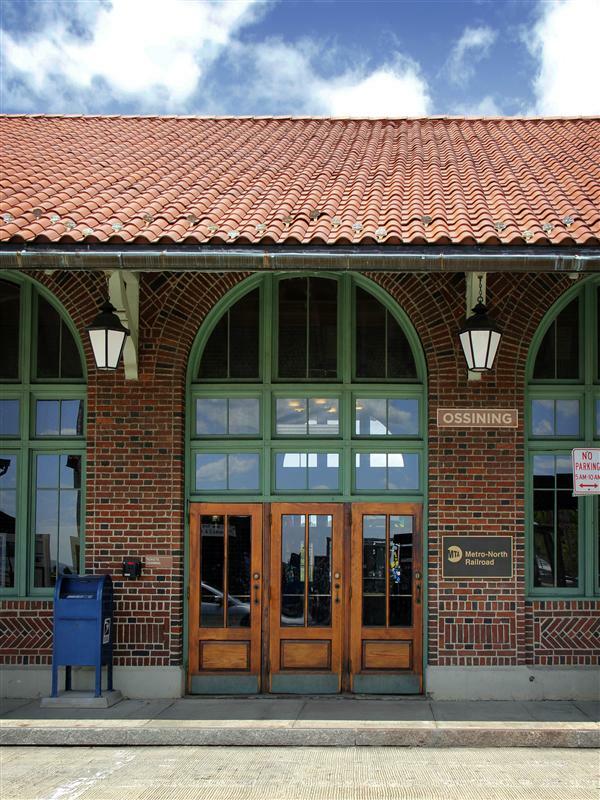 The station currently on site was built in 1914 in the Renaissance Revival style, replacing the original that was built in 1851. 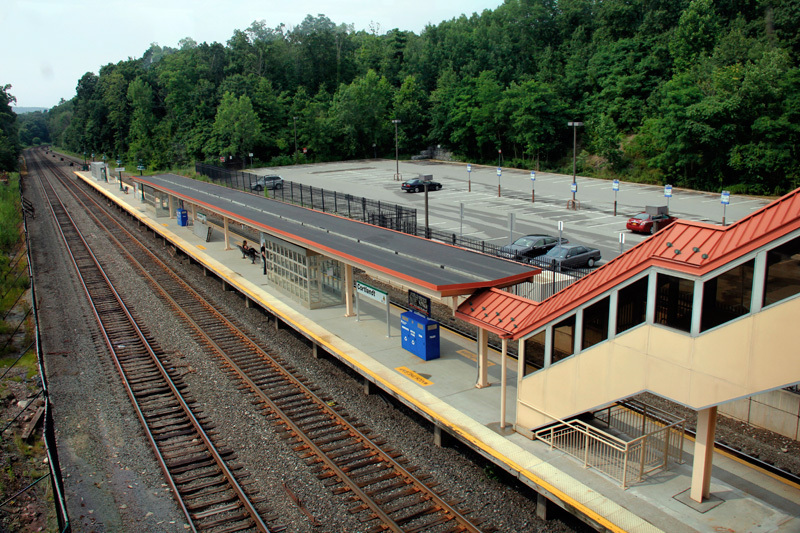 While the original station was at grade, the new station was built above the tracks. 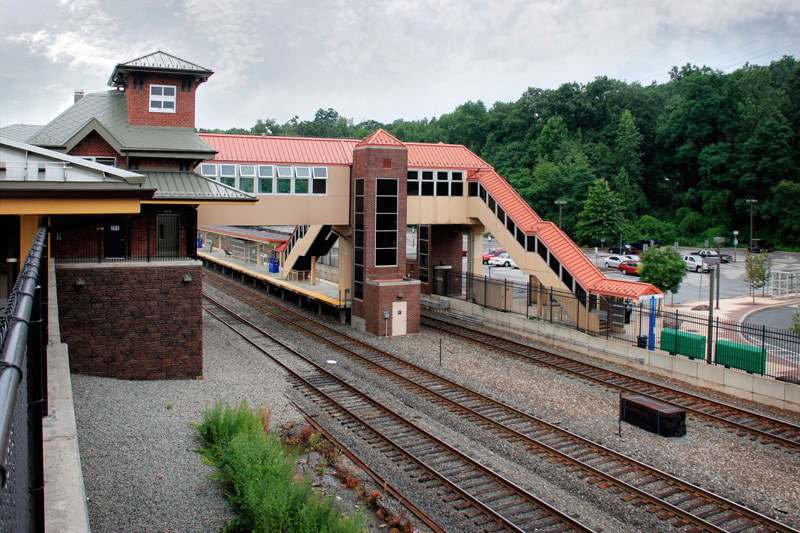 Main Street was also modified so it too would cross above the tracks, eliminating the grade crossing. 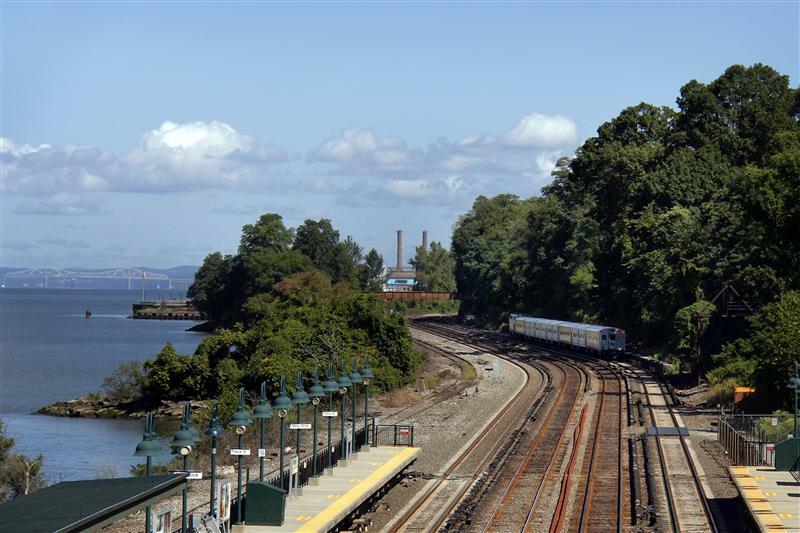 Just east of the station is the Hudson River, from which a ferry to Haverstraw operates. 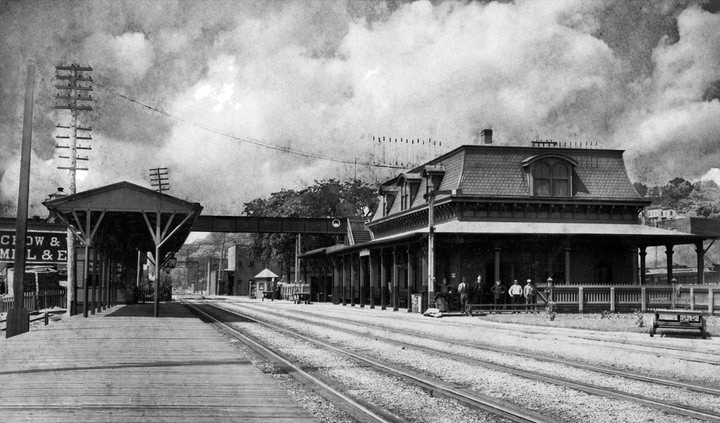 The original station at Ossining, circa 1912. 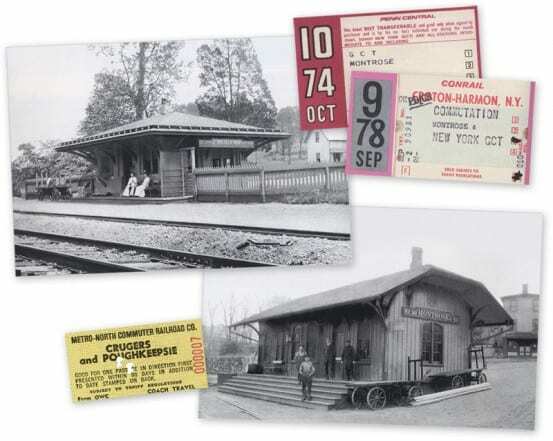 Photo from the Ossining Historical Society. 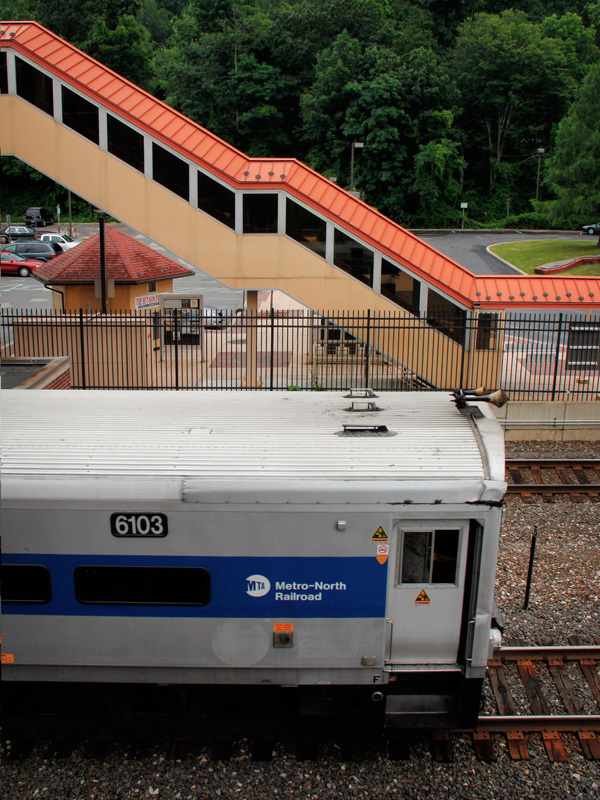 Various views of Ossining. Photos from the Ossining Historical Society. 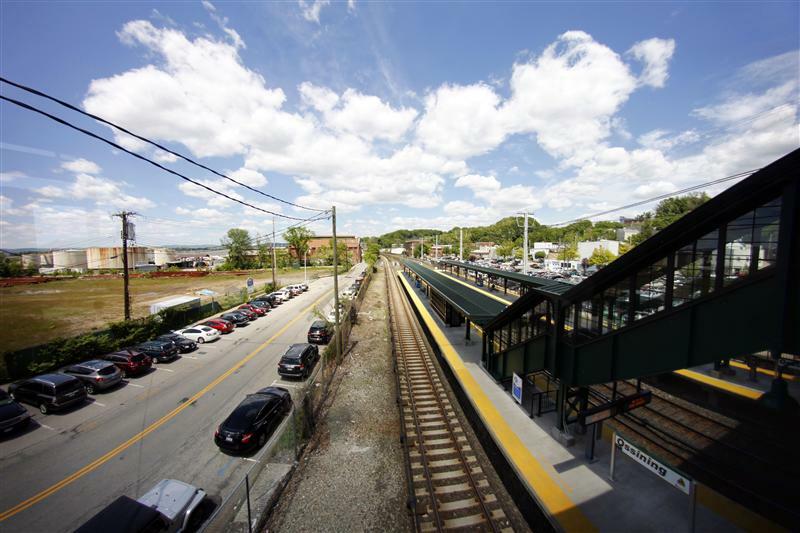 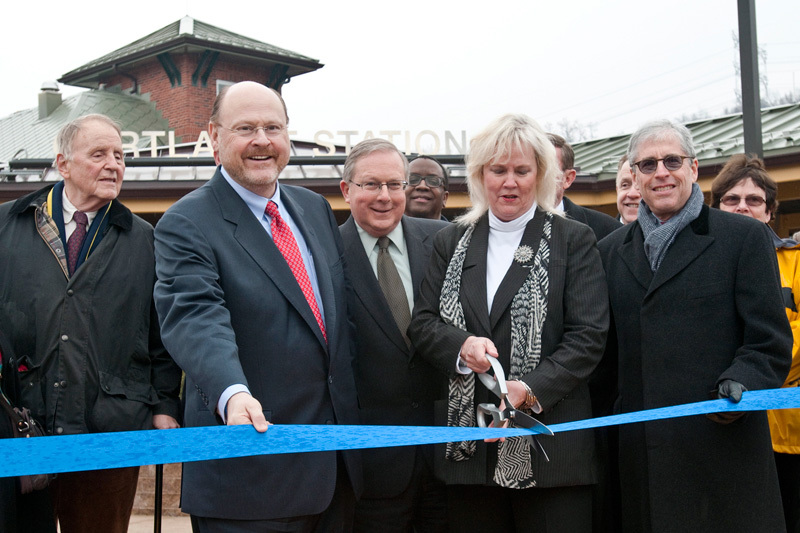 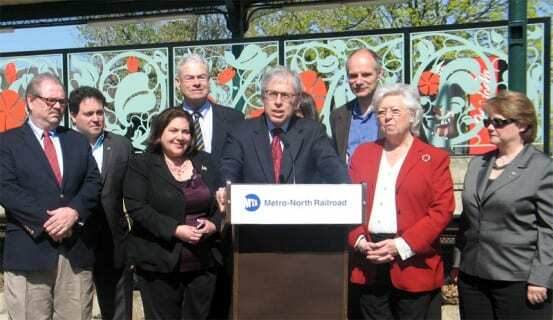 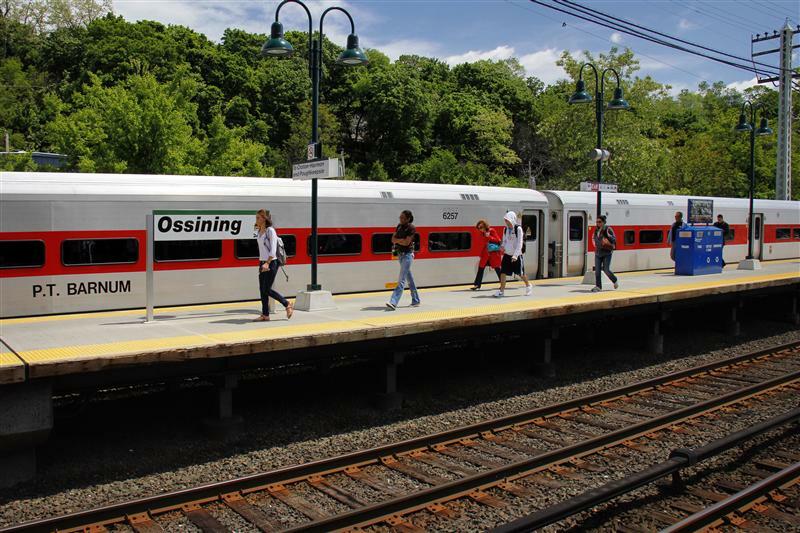 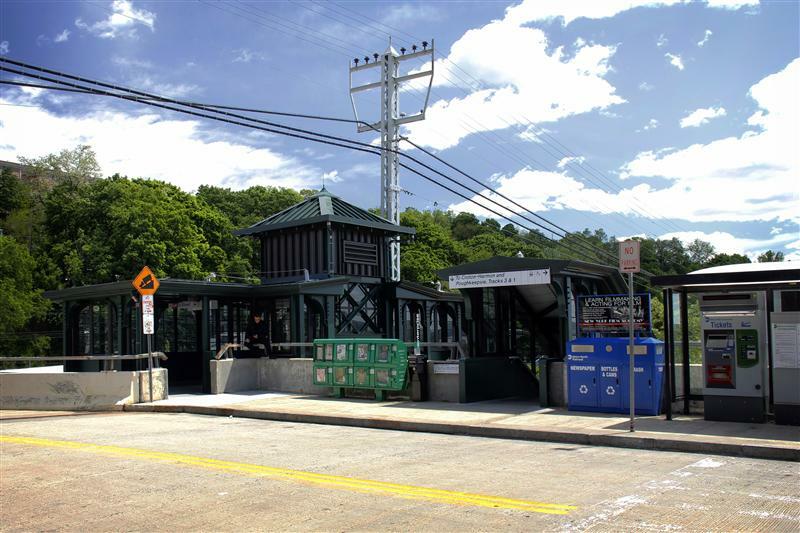 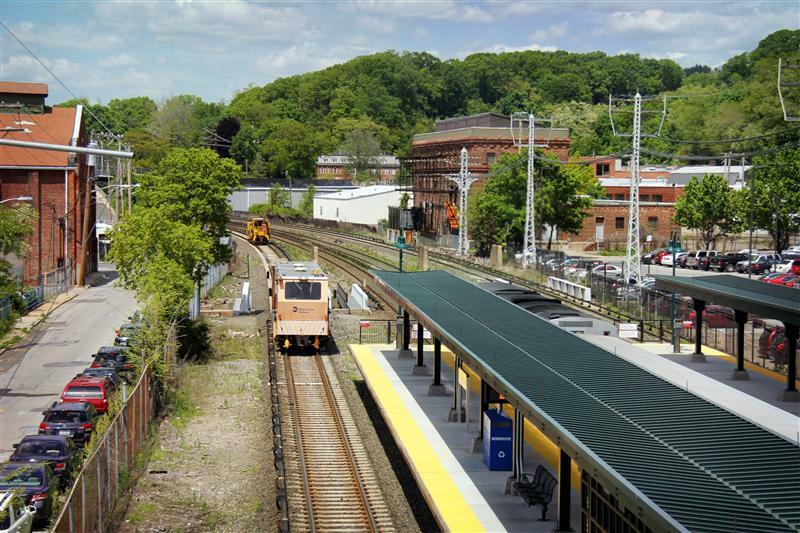 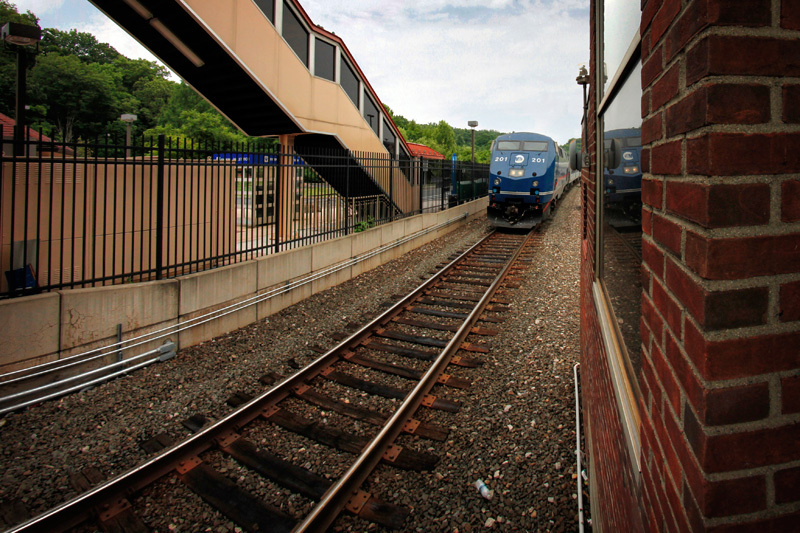 Like many stations along the Hudson Line, Ossining has recently been fixed up by Metro-North. 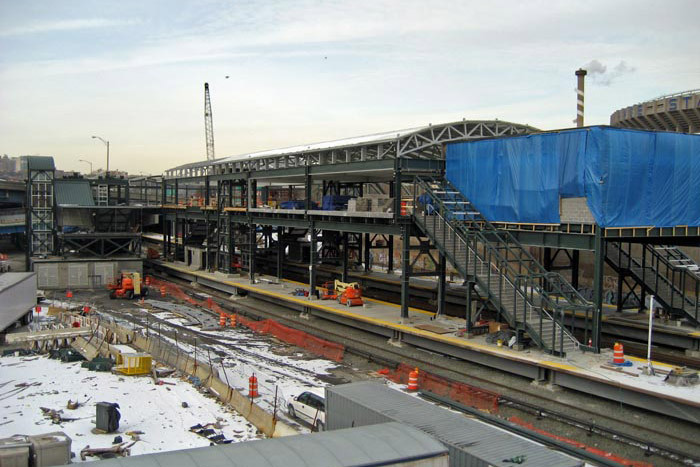 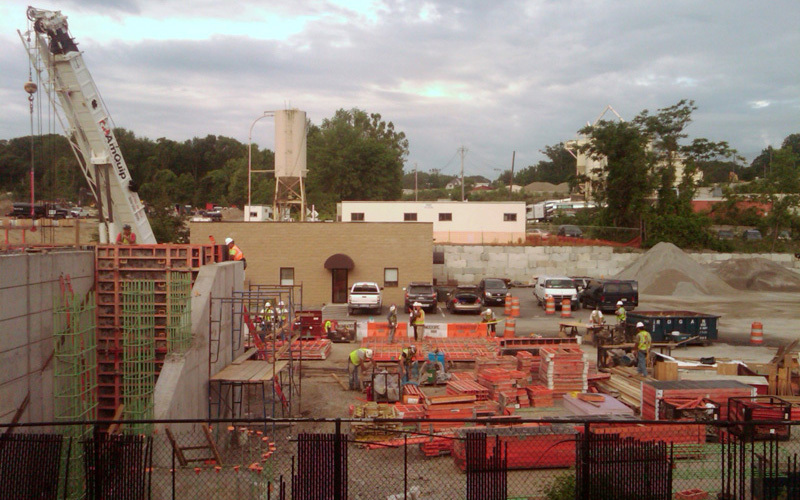 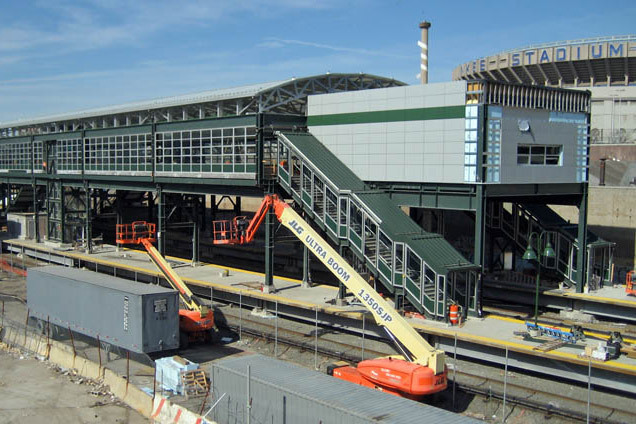 Some of the work at the station included seven brand new staircases, and four new elevators. 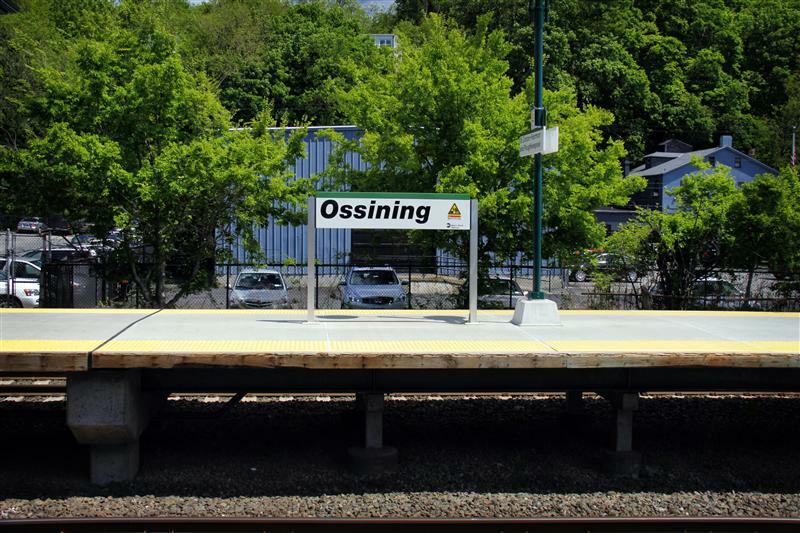 Unfortunately during my visit (Ossining was actually the first station I photographed on the Hudson Line!) 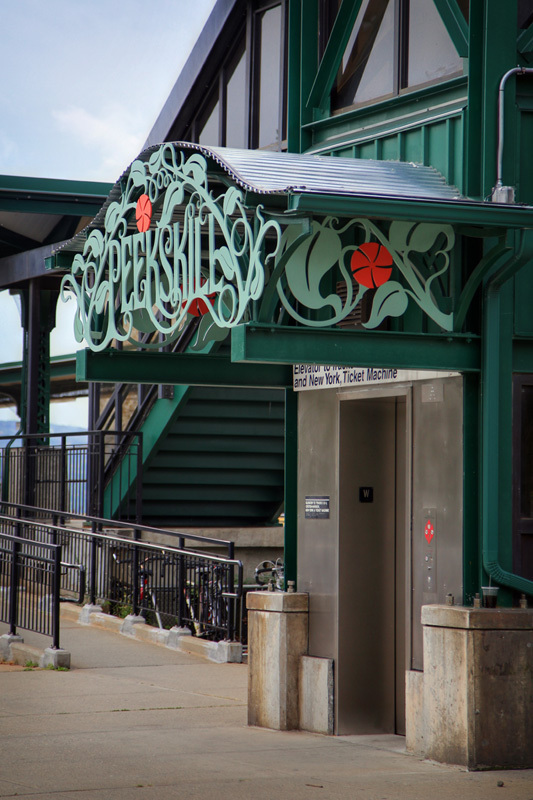 the station building was closed. 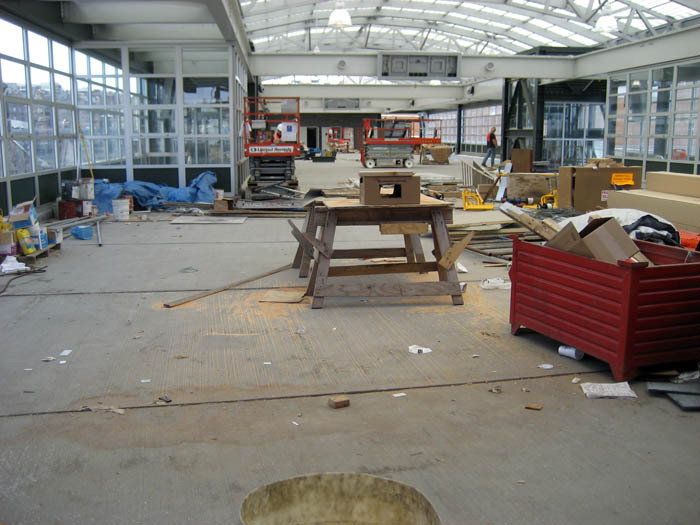 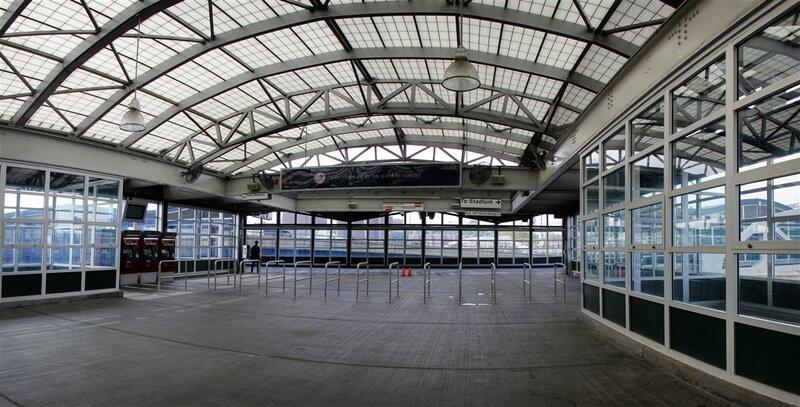 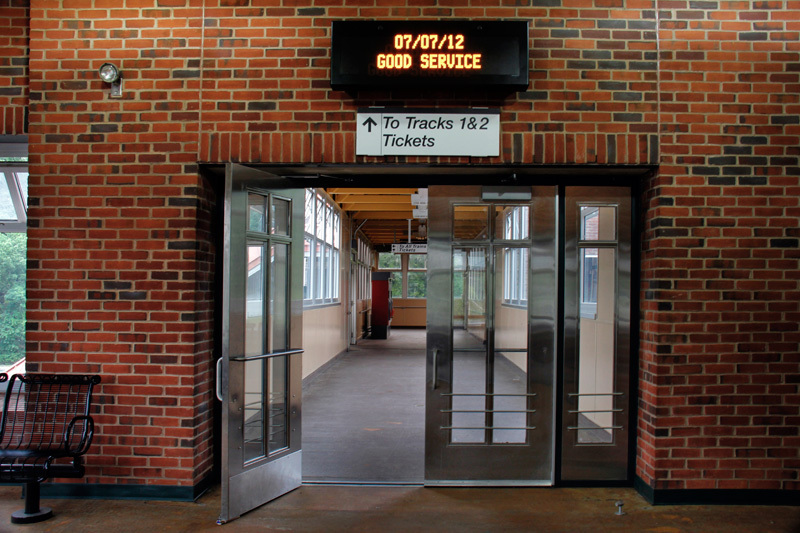 The ticket windows are no longer manned, and Metro-North is looking for a tenant to occupy the space in the old station. 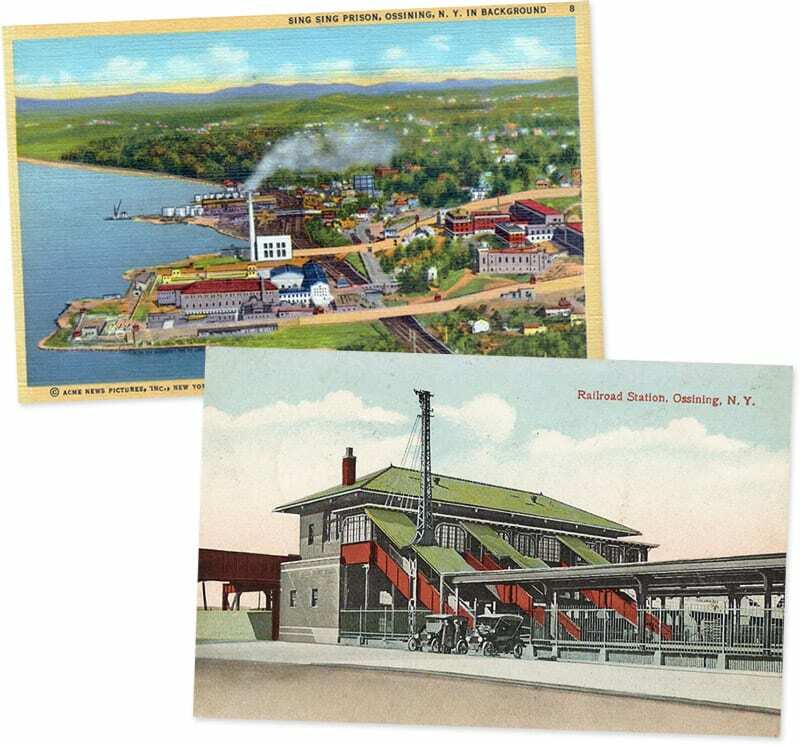 More postcards from Sing Sing, and Ossining station. 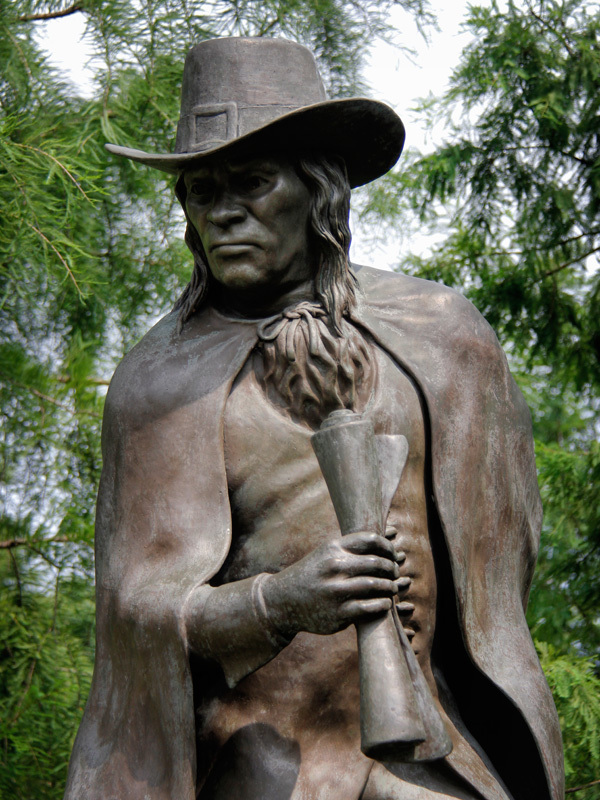 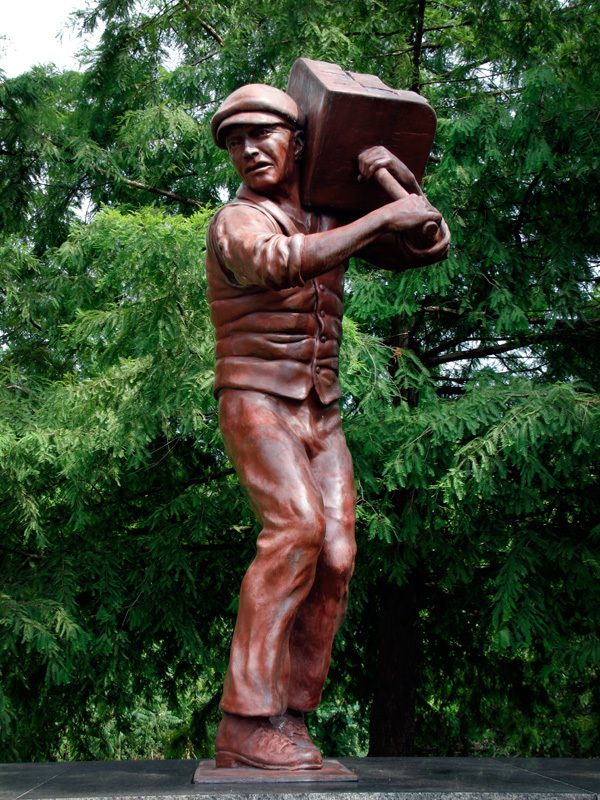 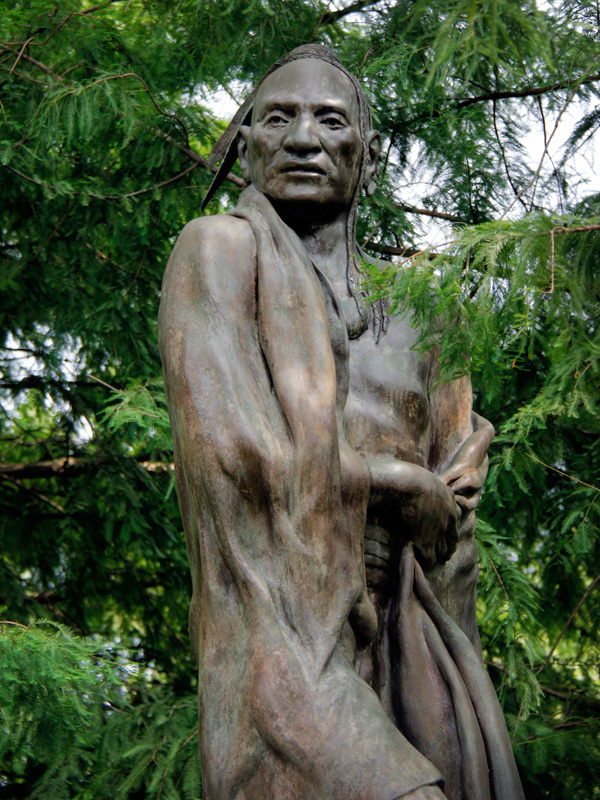 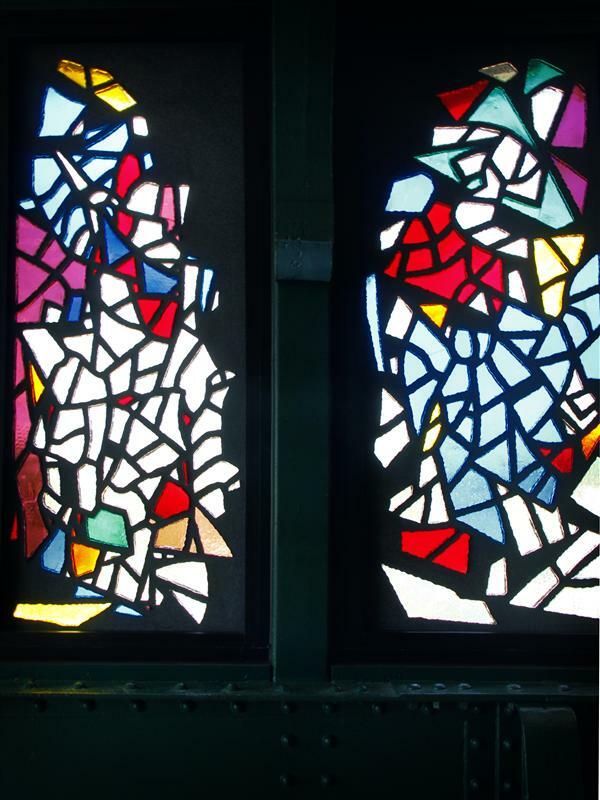 Before I wrap this up, one last detail to note about Ossining is that it also has some art. 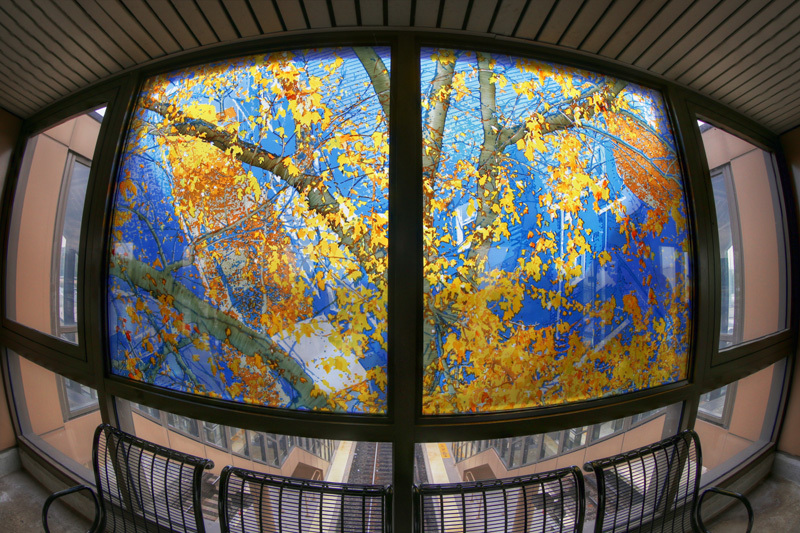 In 2010 a faceted-glass piece by abstract expressionist artist Robert Goodnough was installed through the Arts for Transit program. 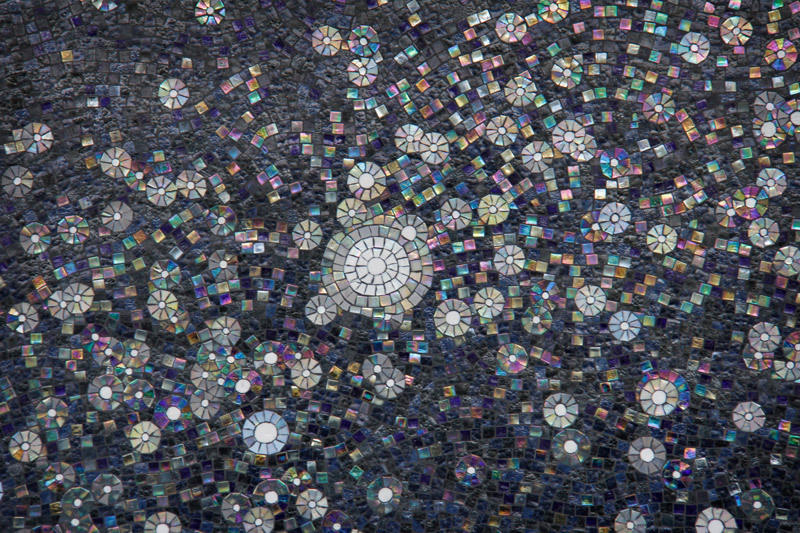 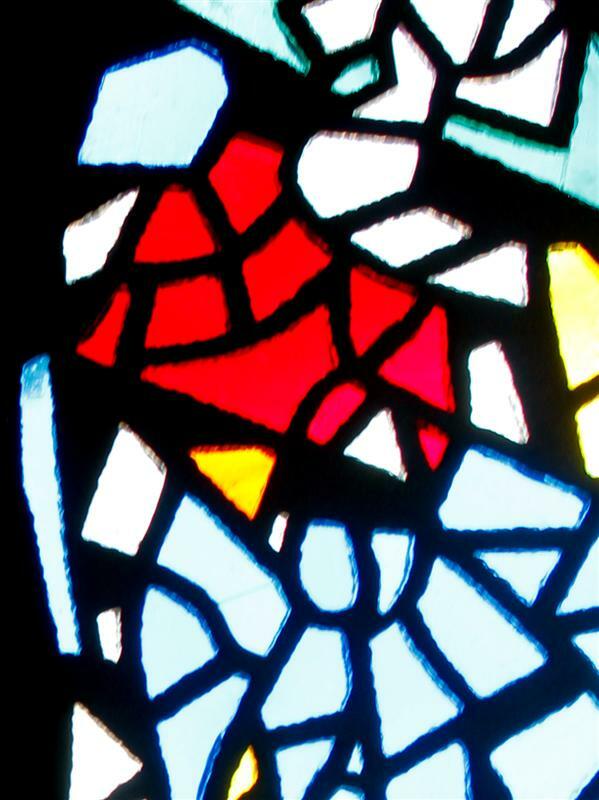 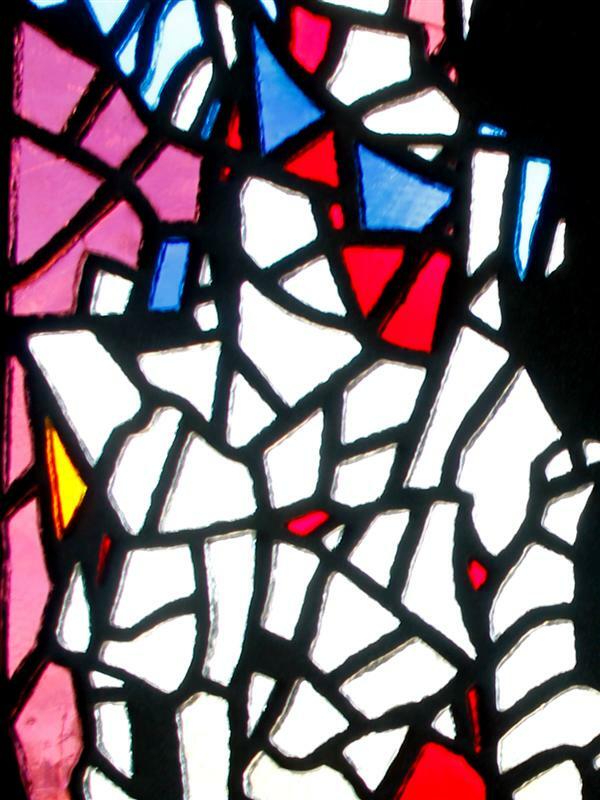 The piece, titled K—M—G, was originally created as a paper collage, and then translated into the finished glass. 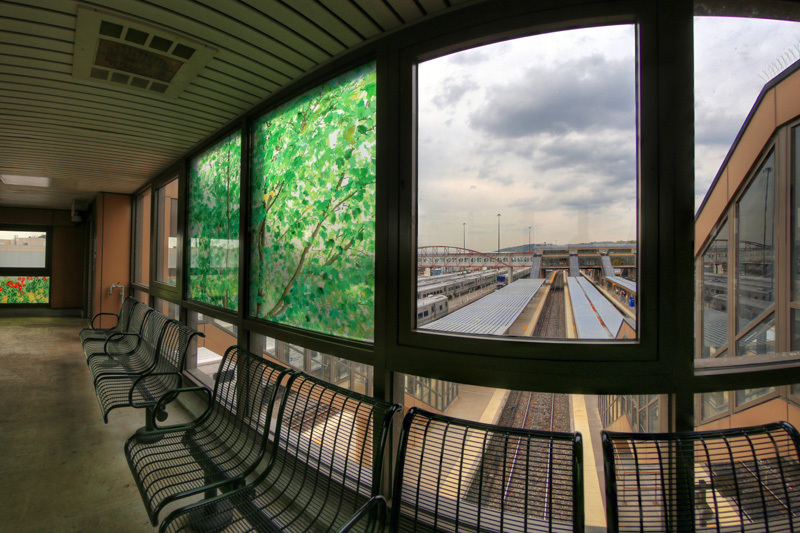 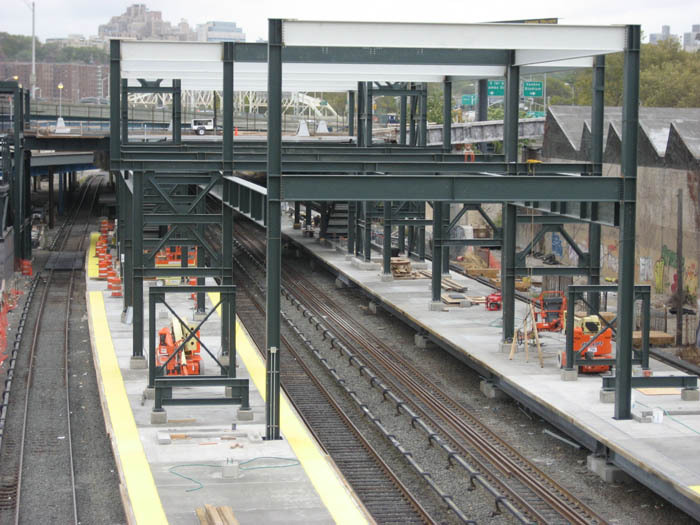 The work is comprised of 16 windows, all located in the station’s north overpass. 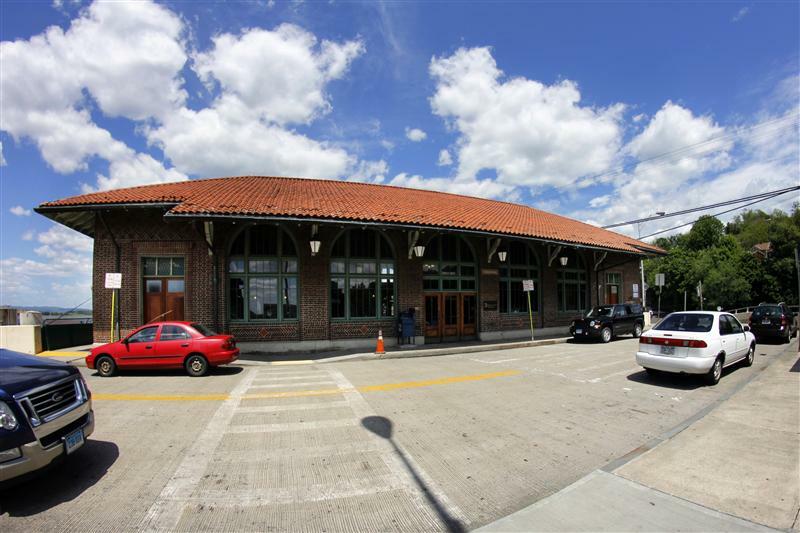 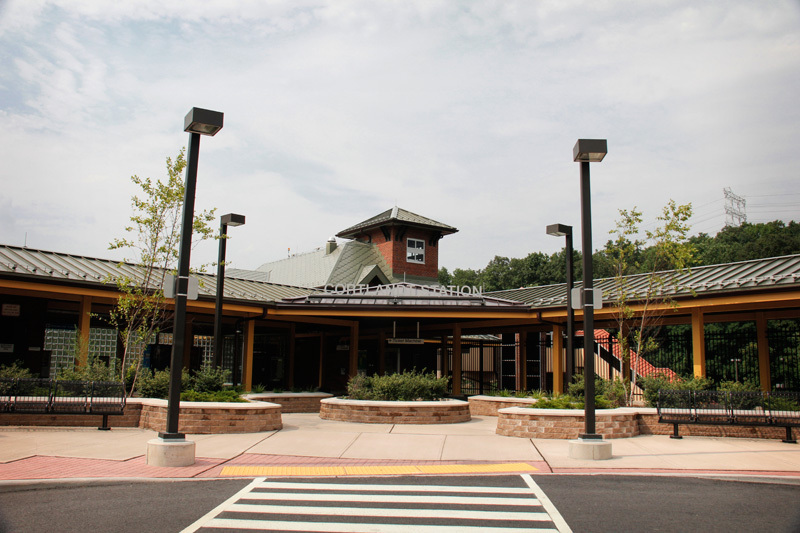 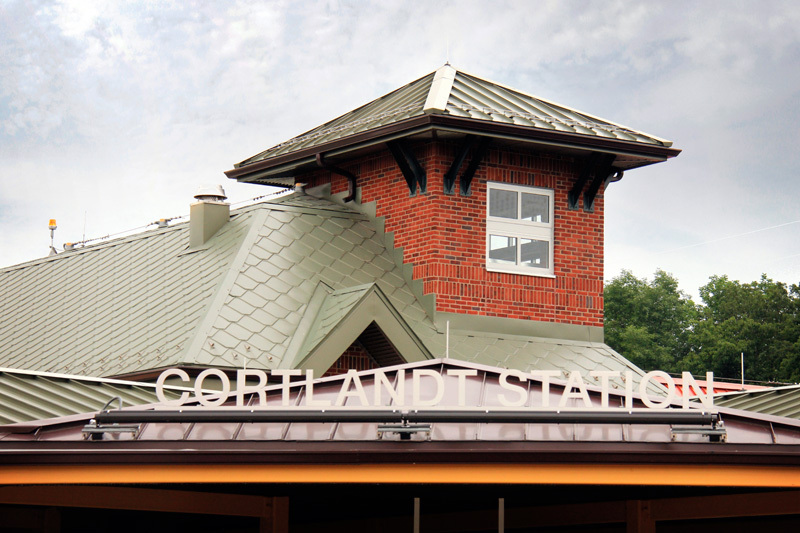 All in all, it makes an attractive addition to a nice Hudson Line station.